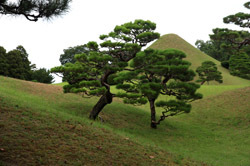 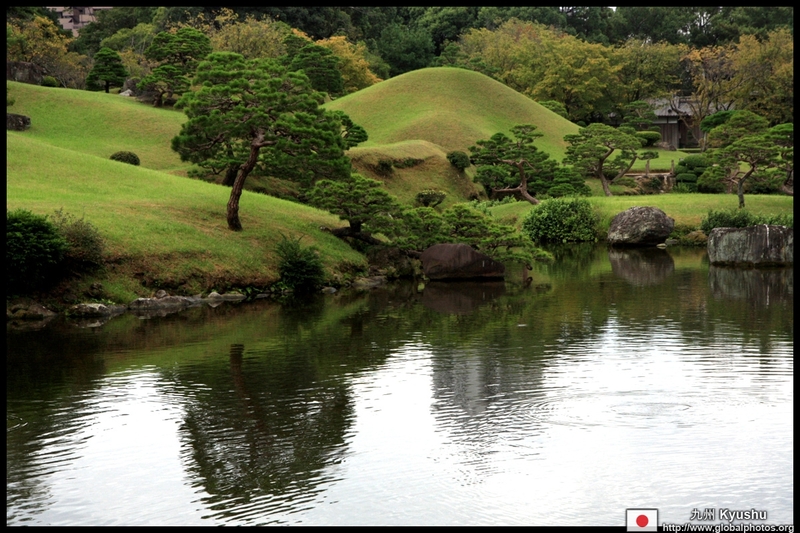 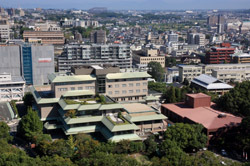 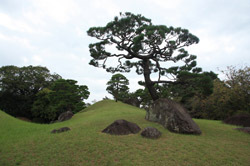 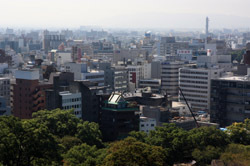 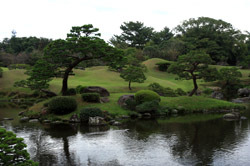 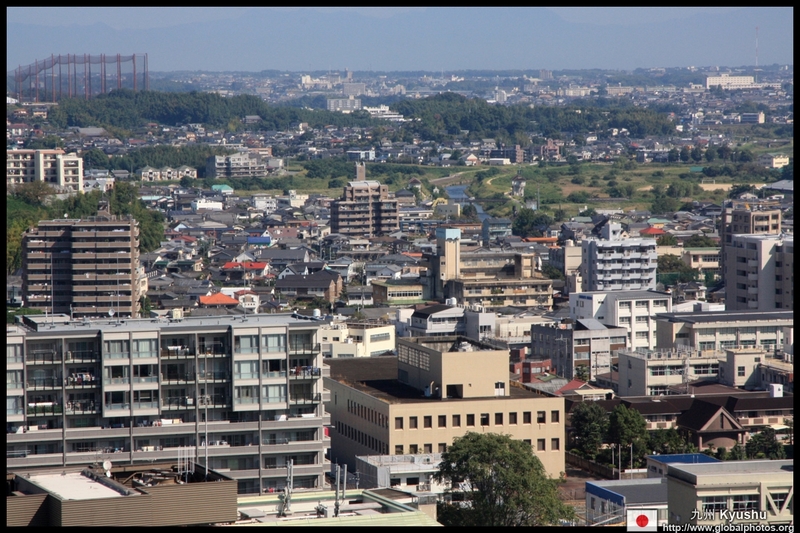 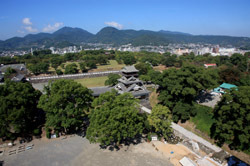 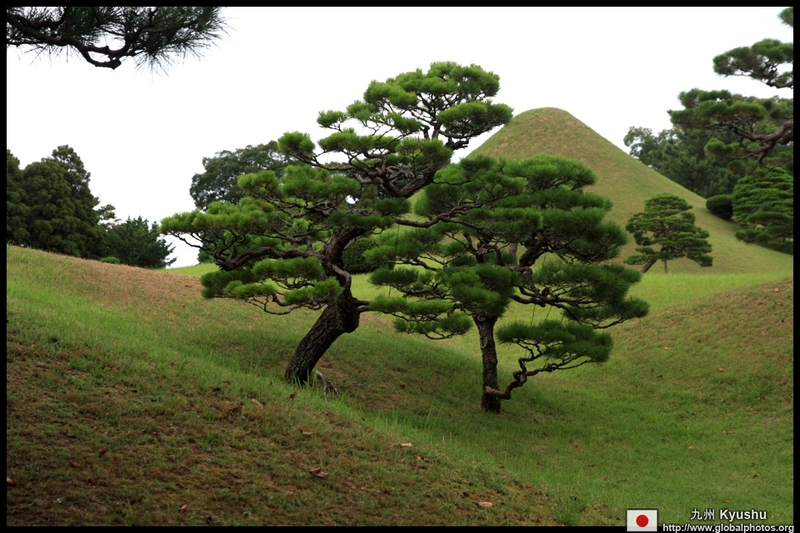 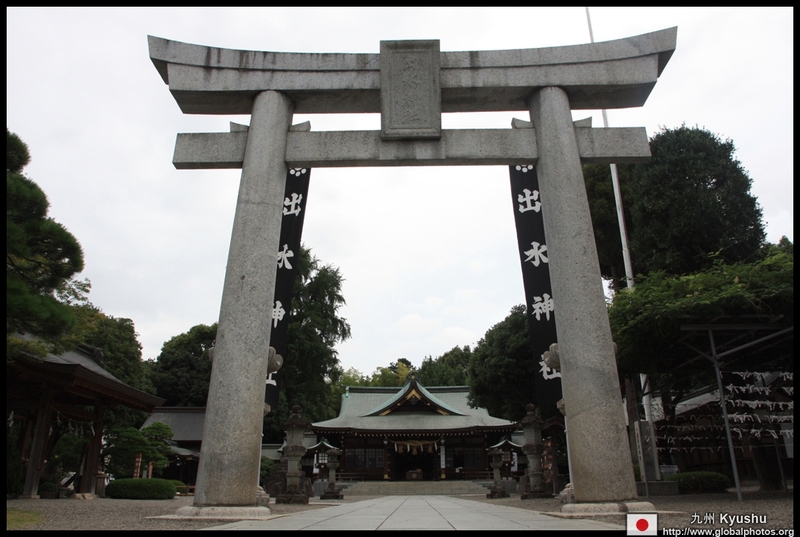 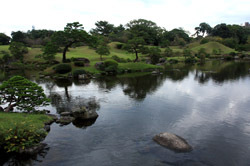 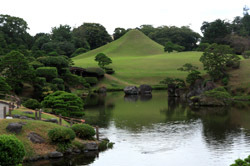 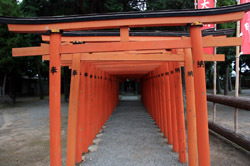 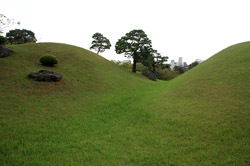 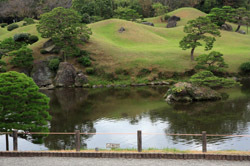 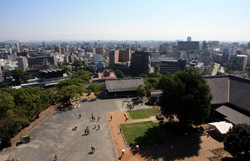 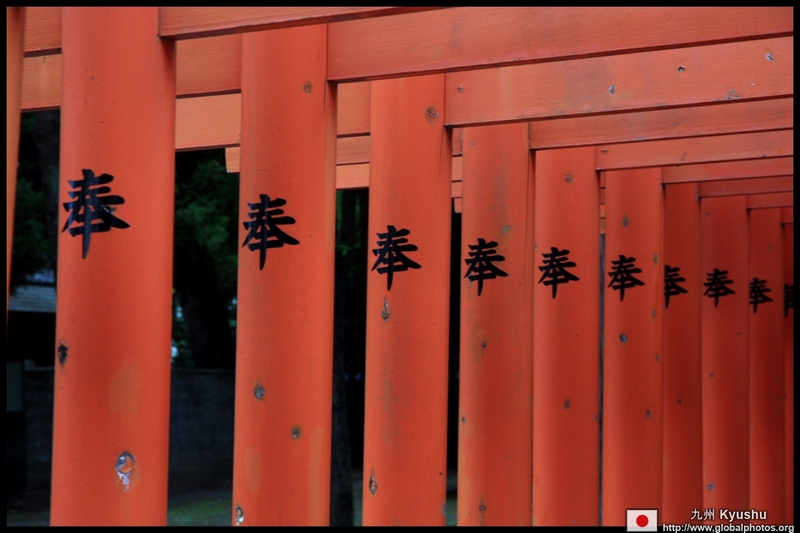 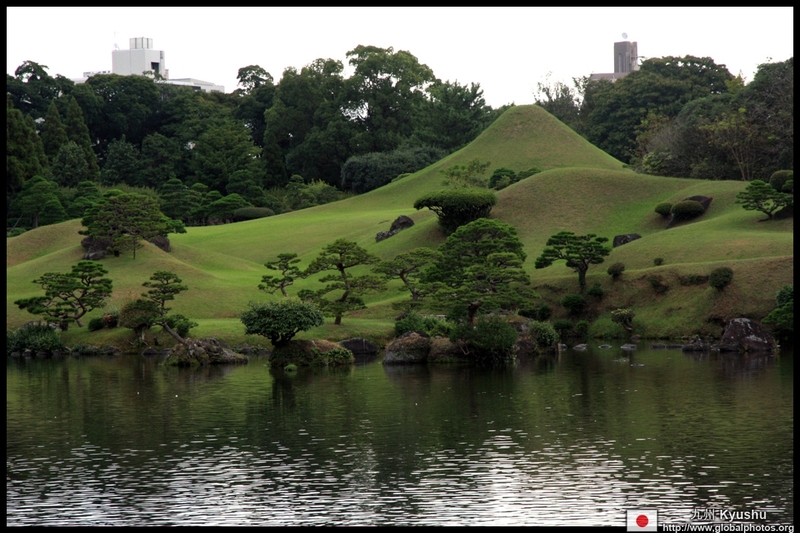 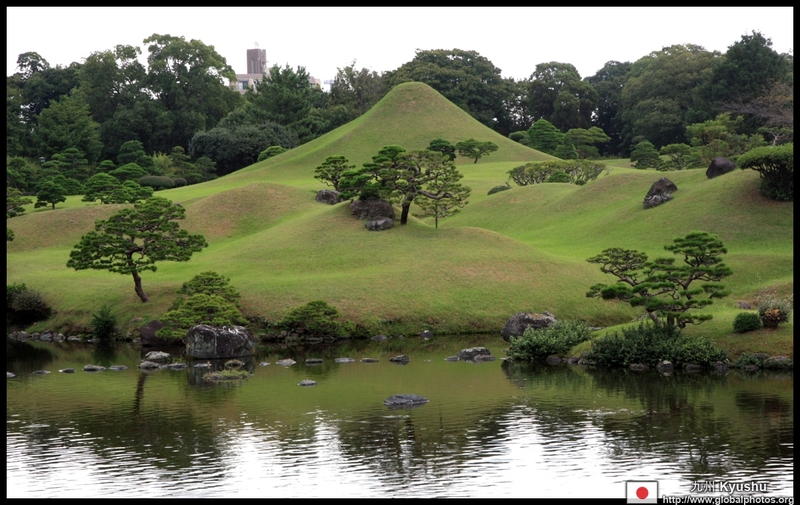 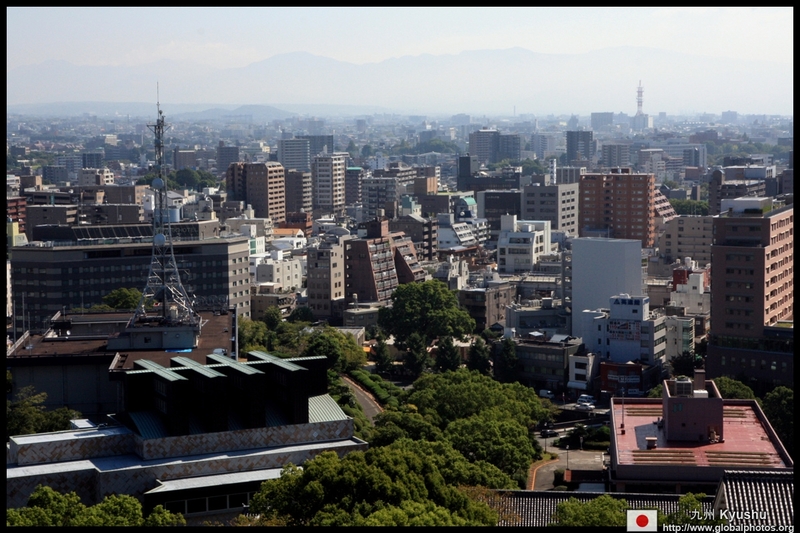 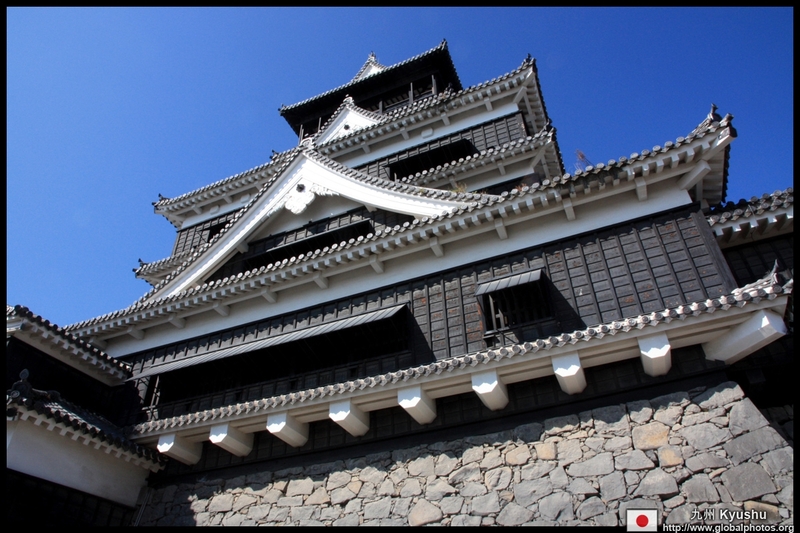 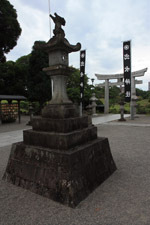 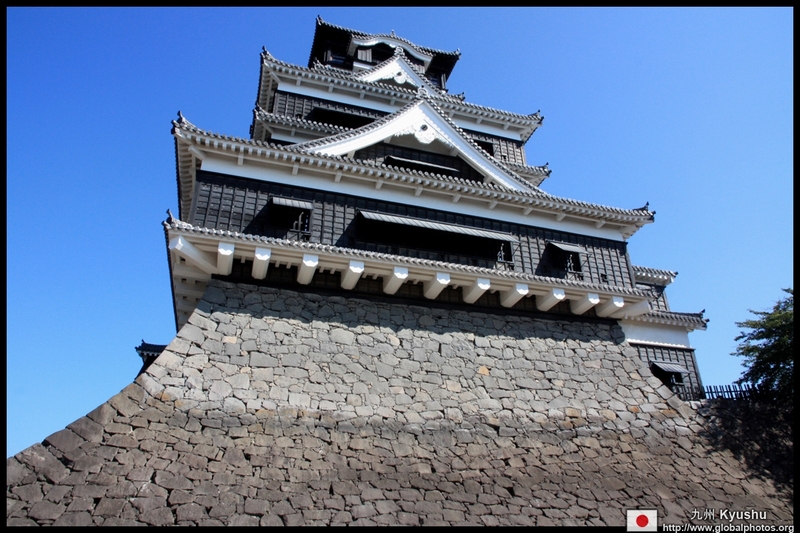 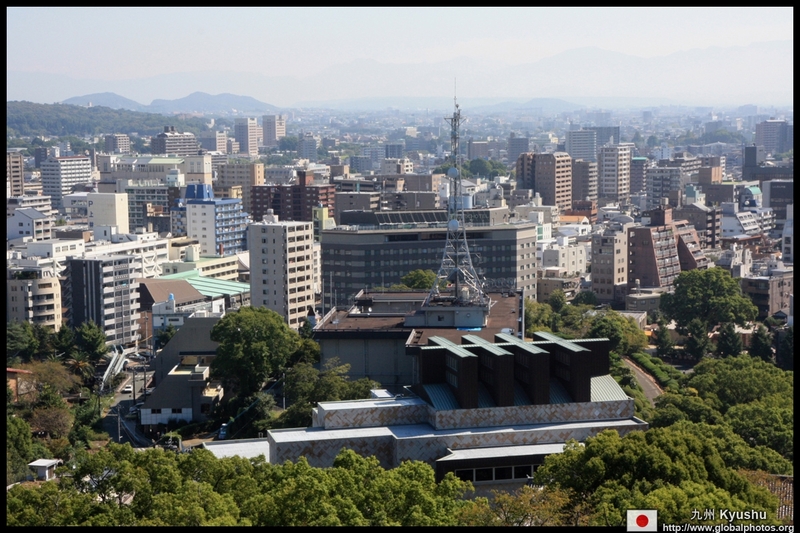 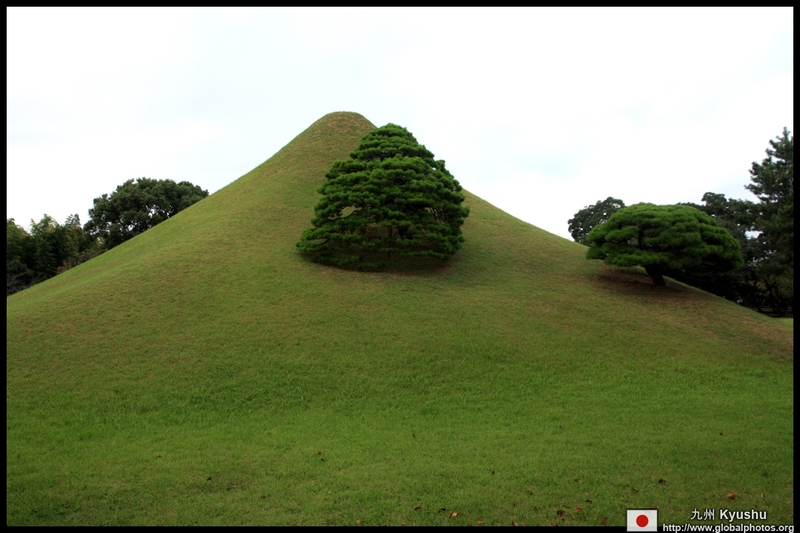 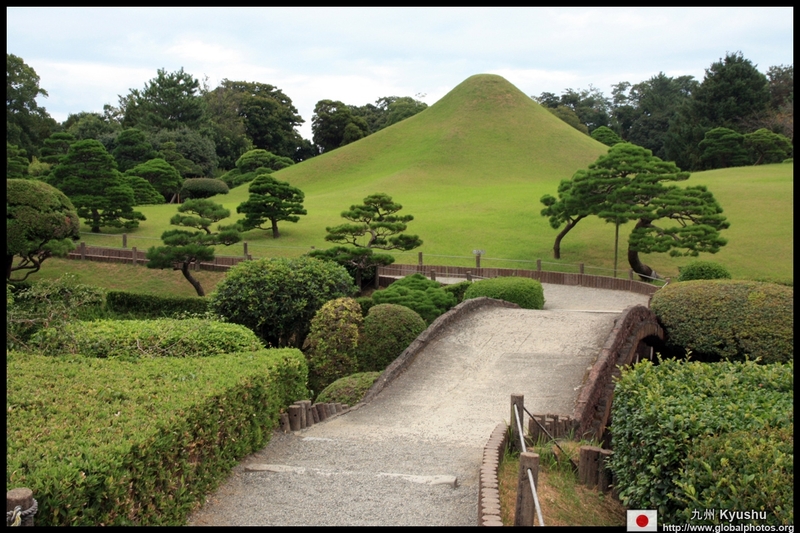 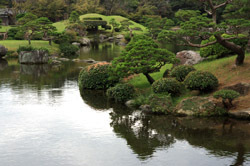 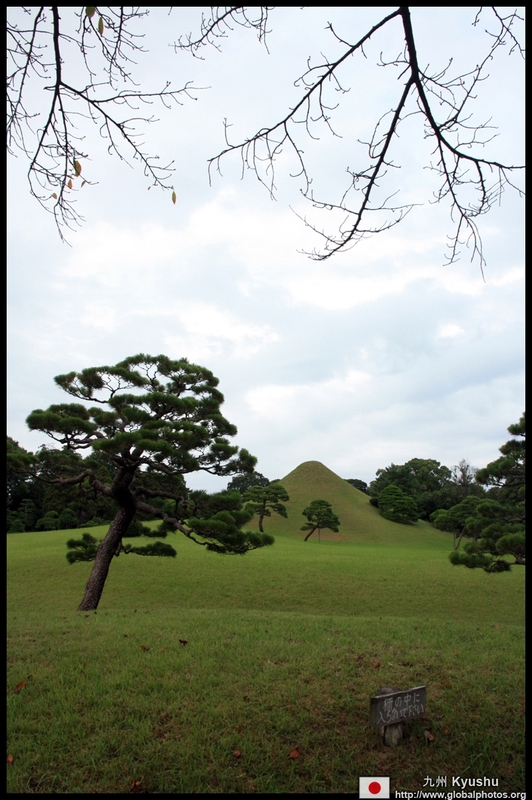 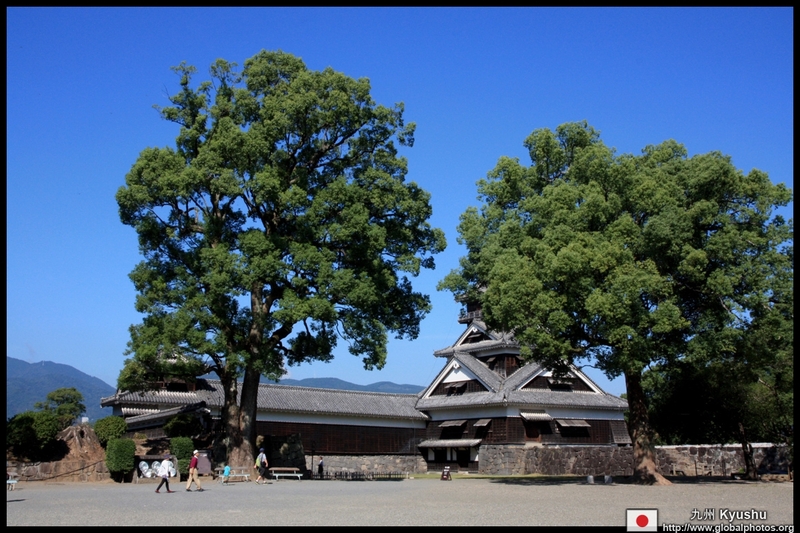 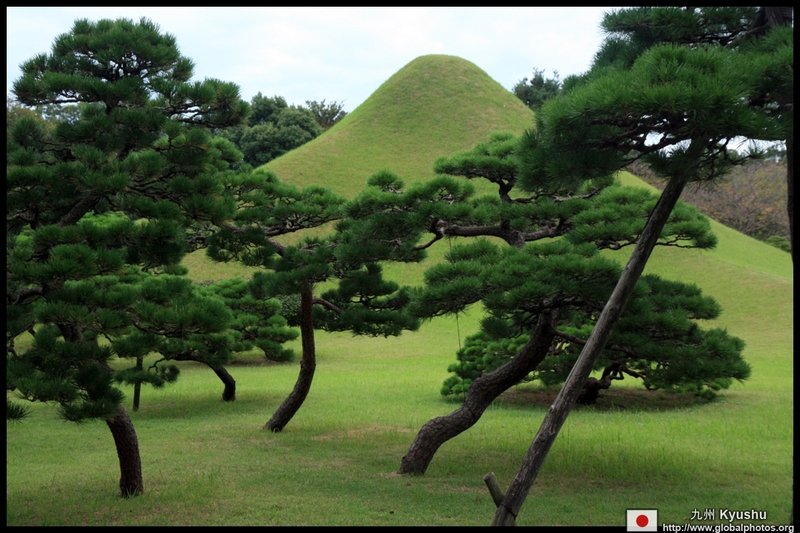 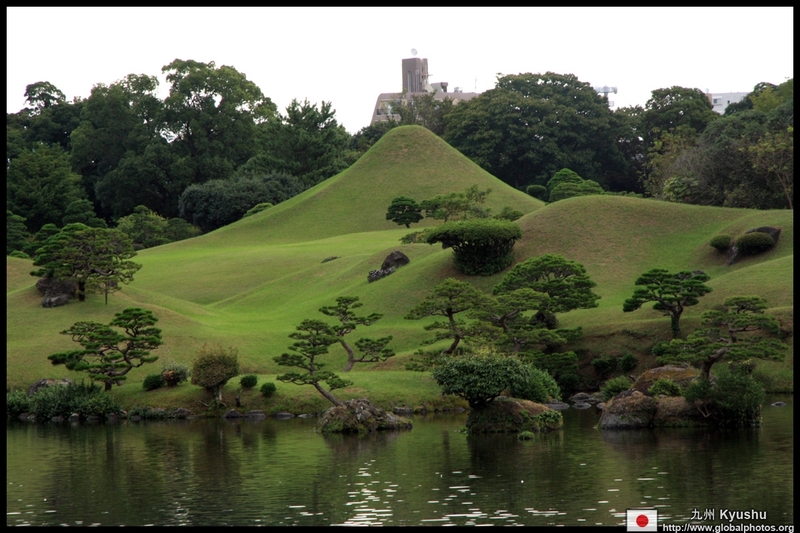 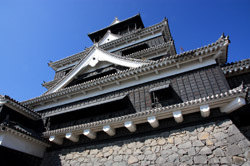 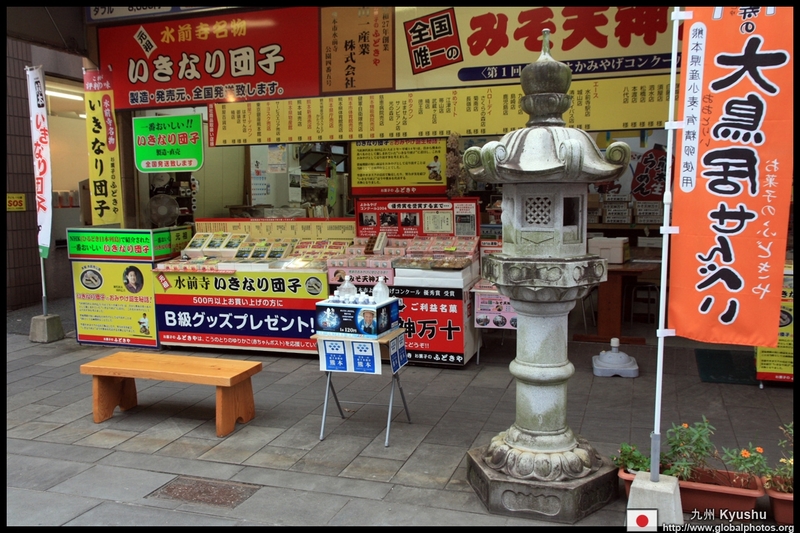 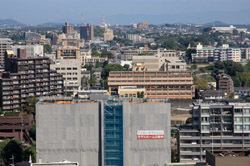 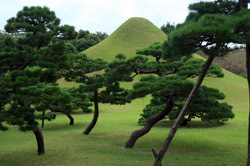 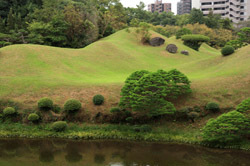 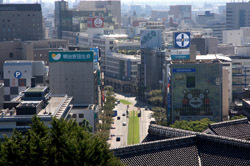 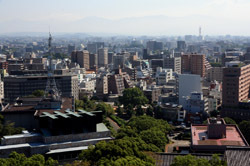 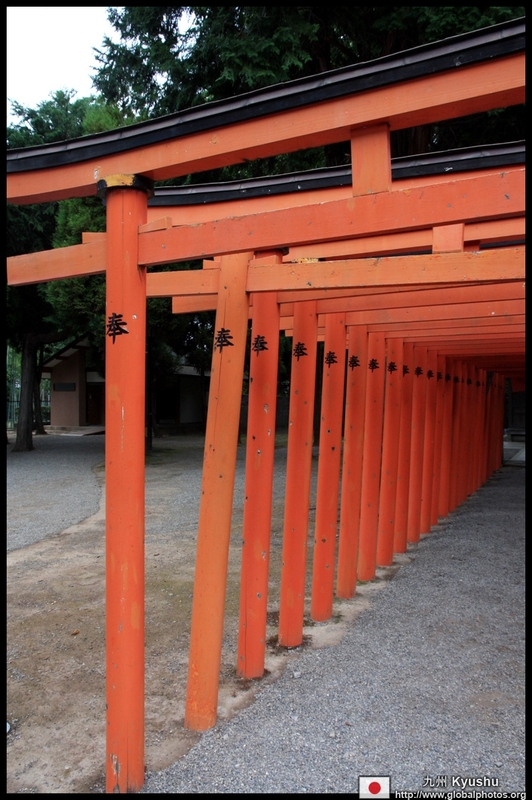 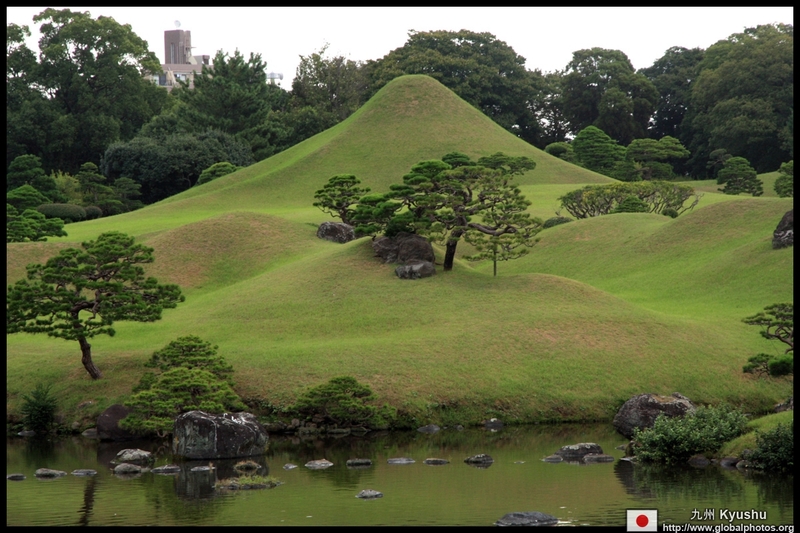 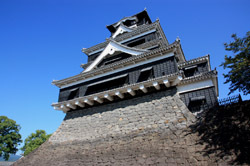 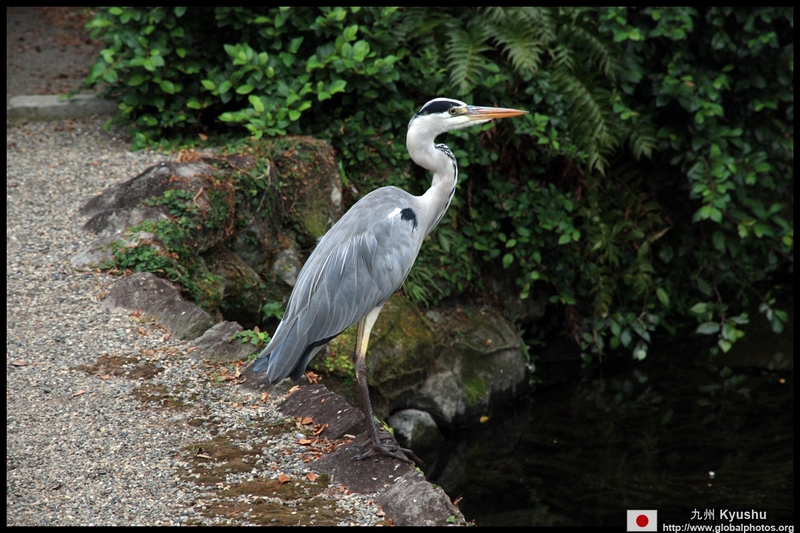 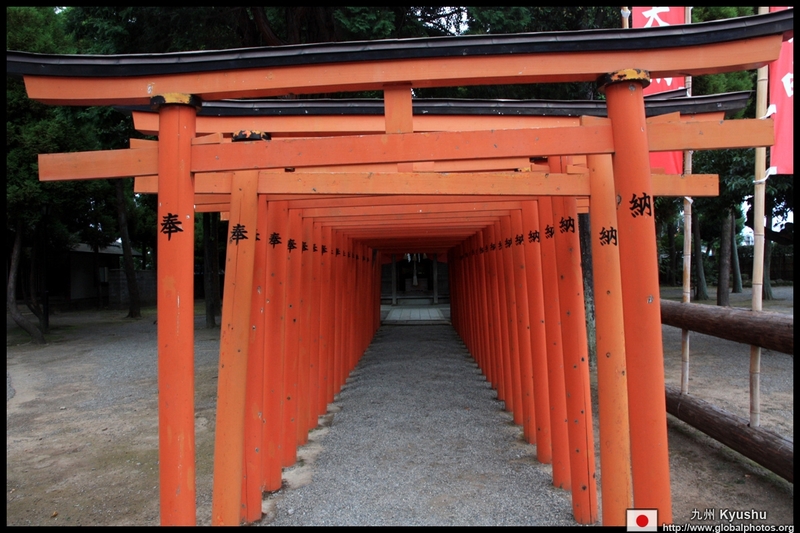 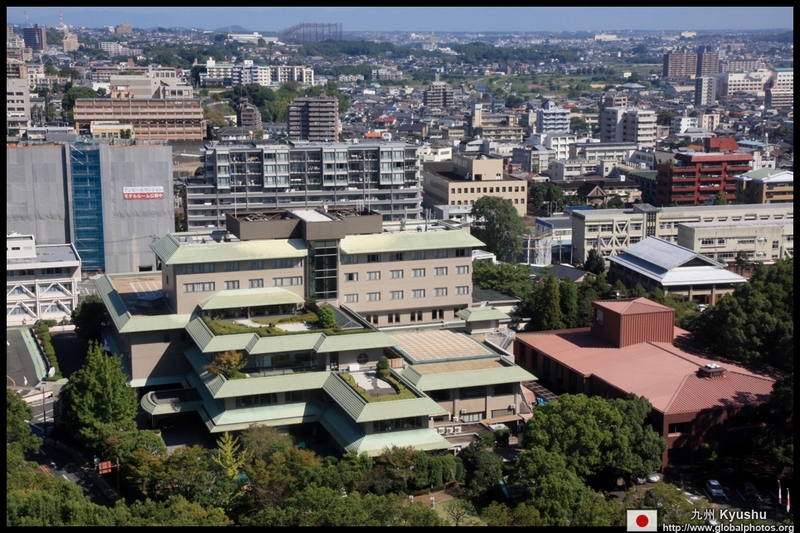 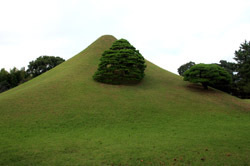 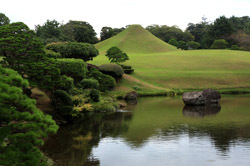 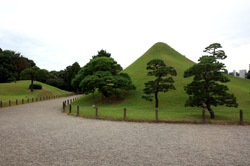 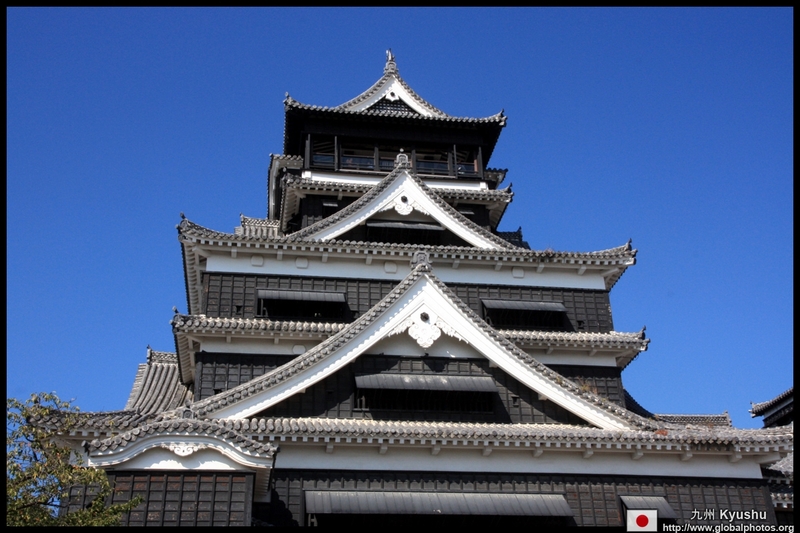 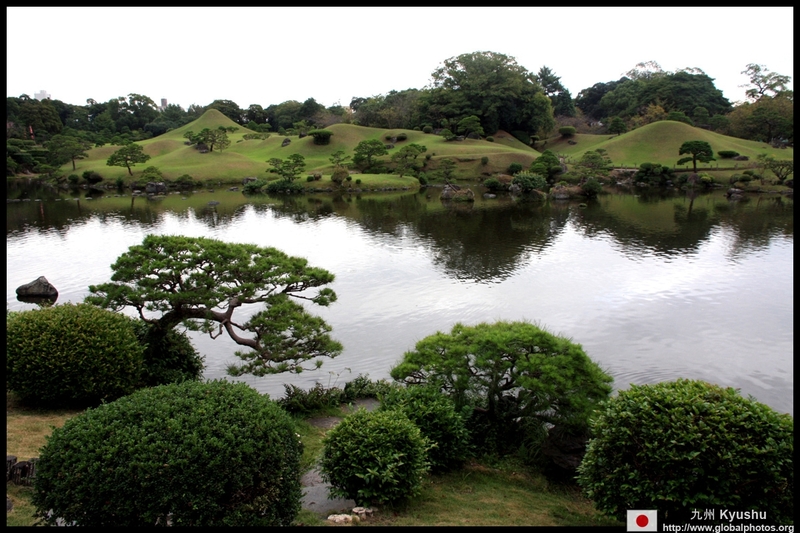 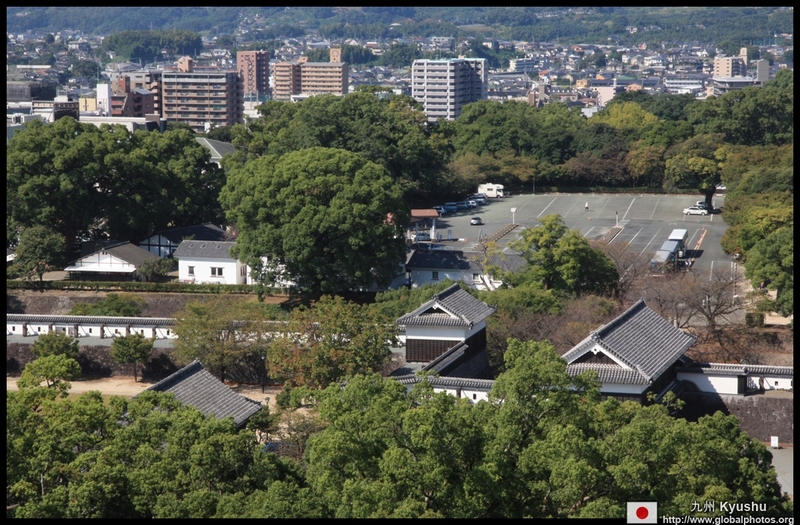 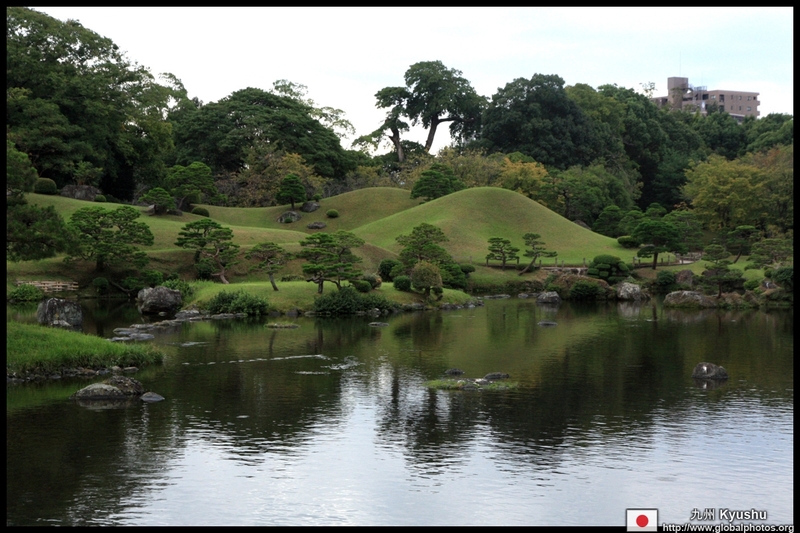 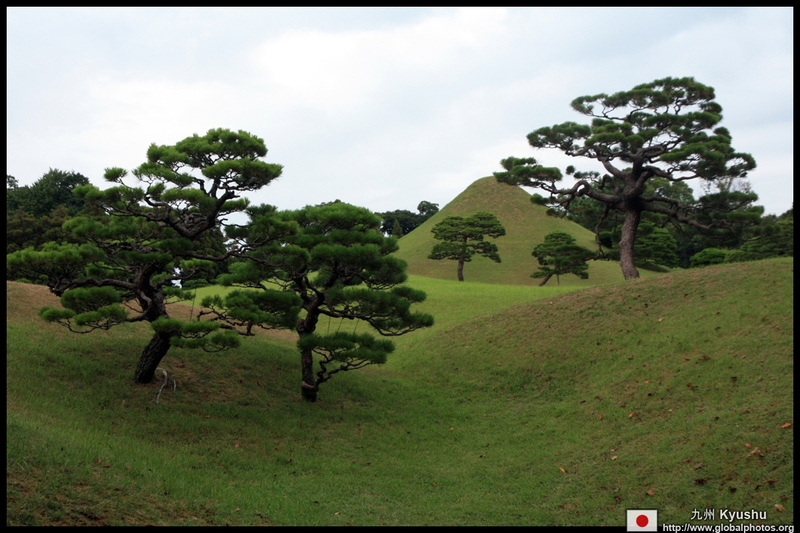 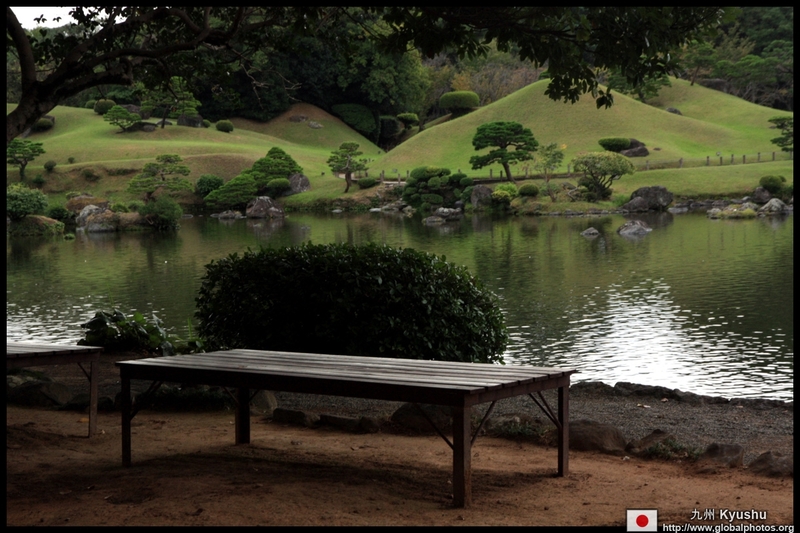 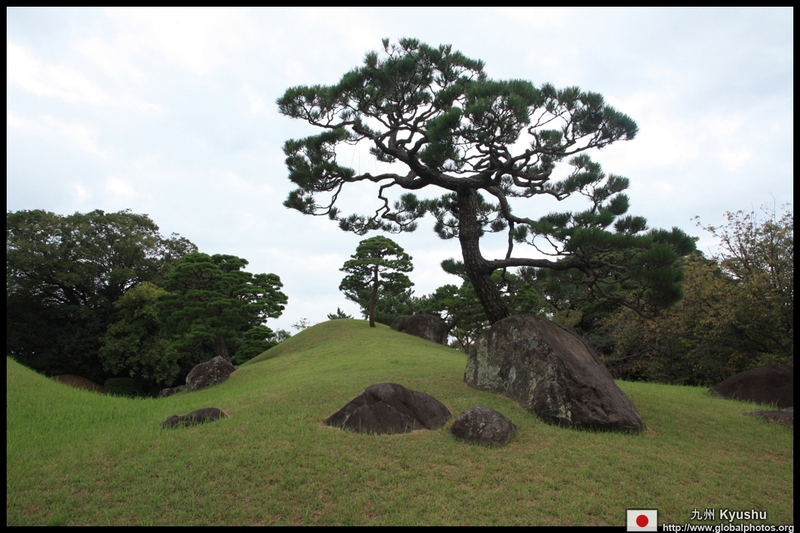 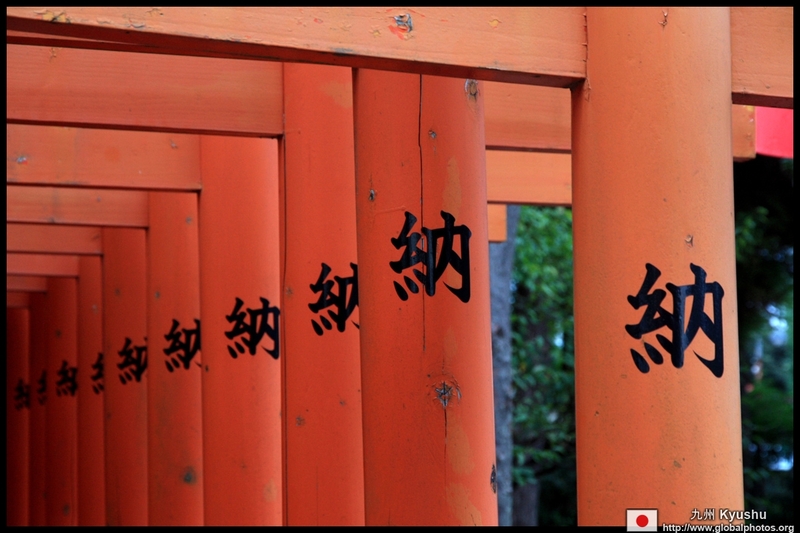 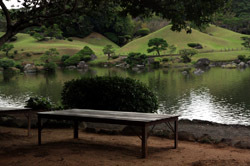 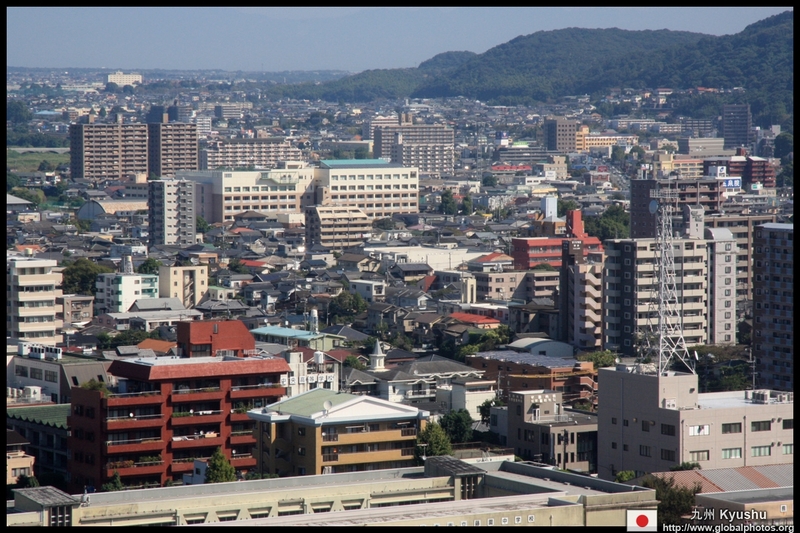 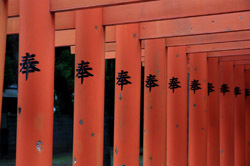 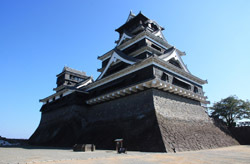 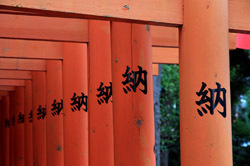 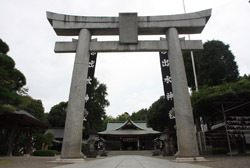 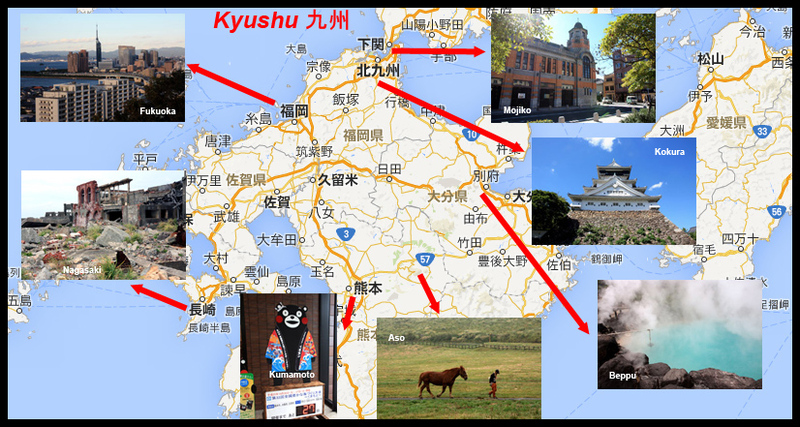 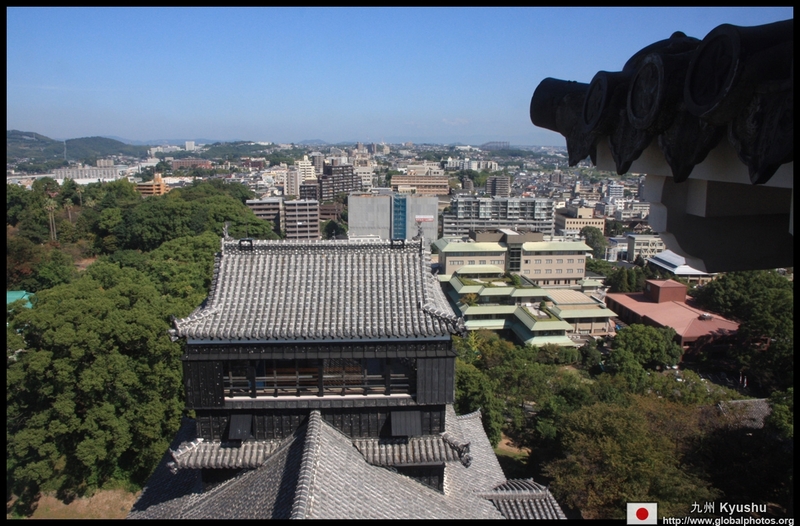 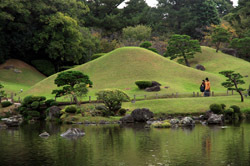 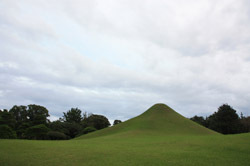 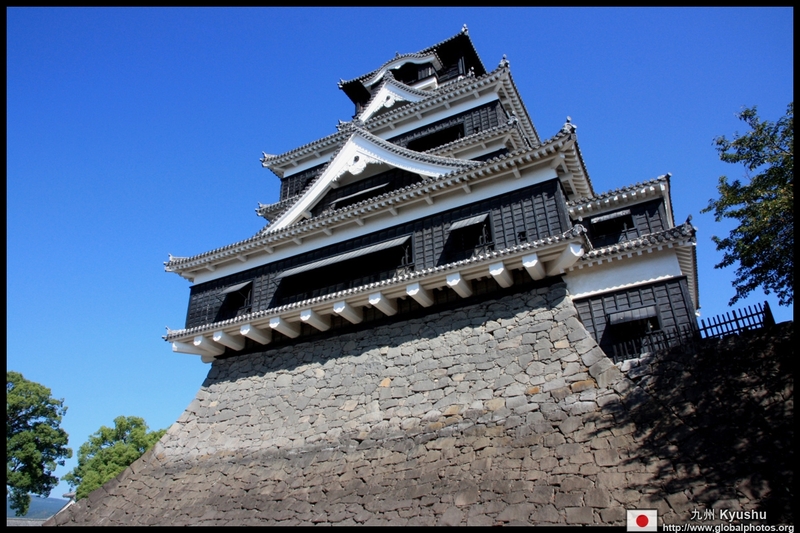 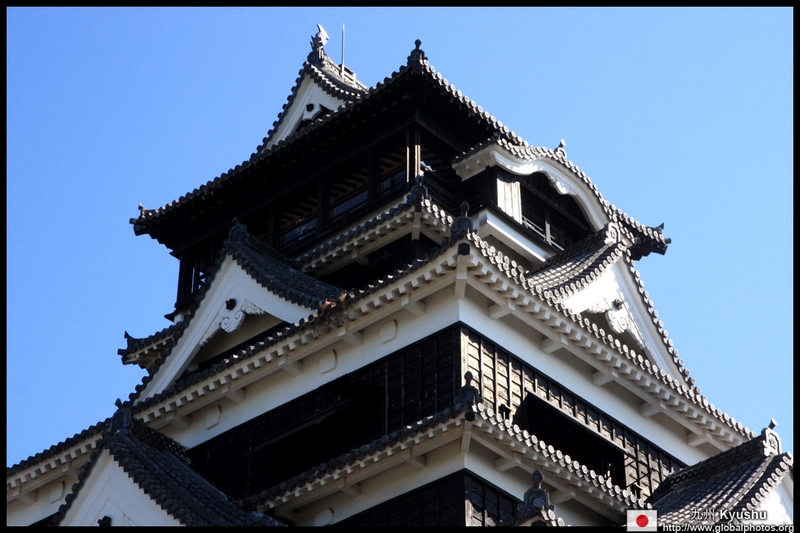 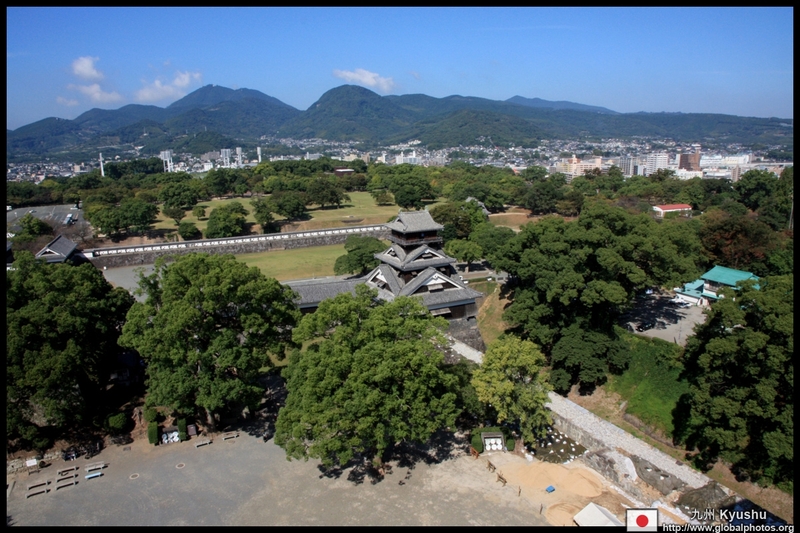 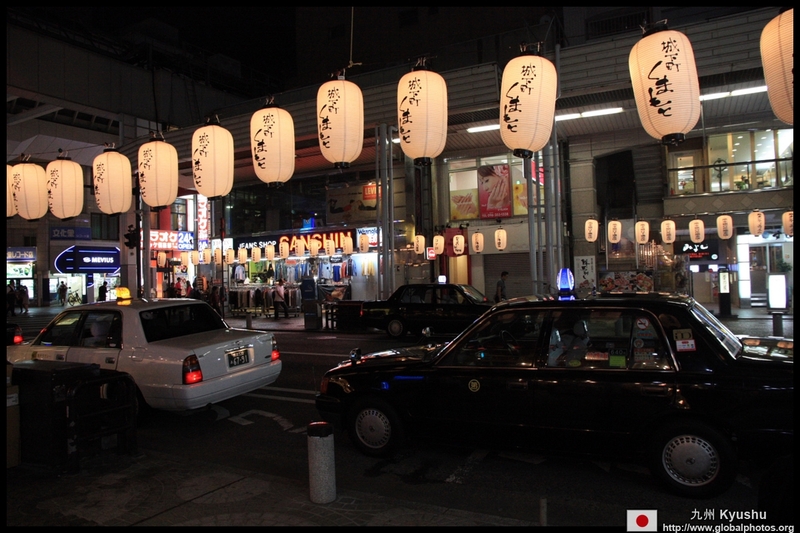 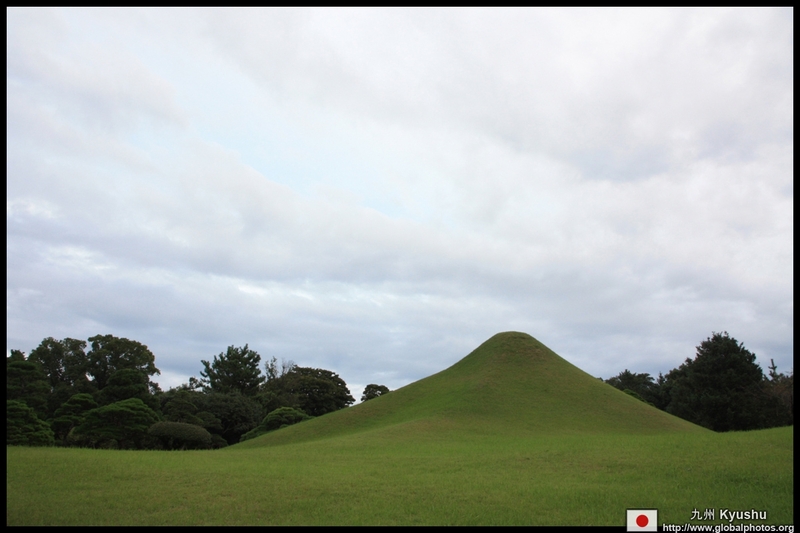 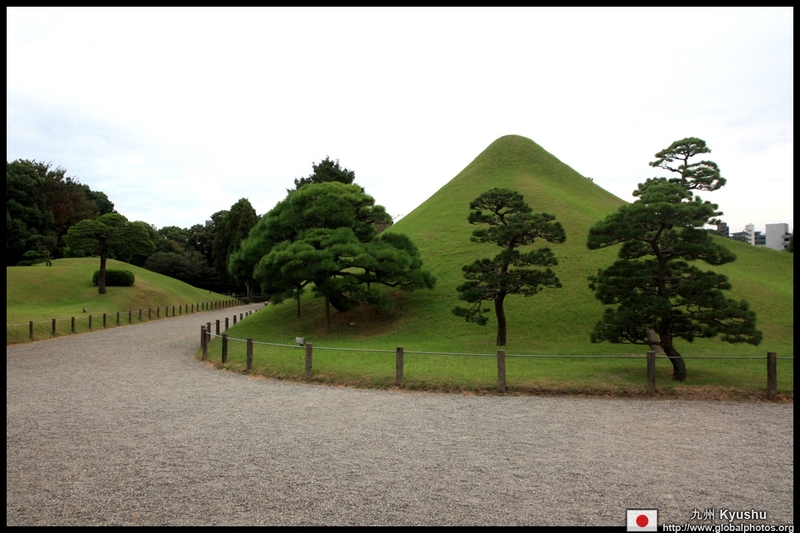 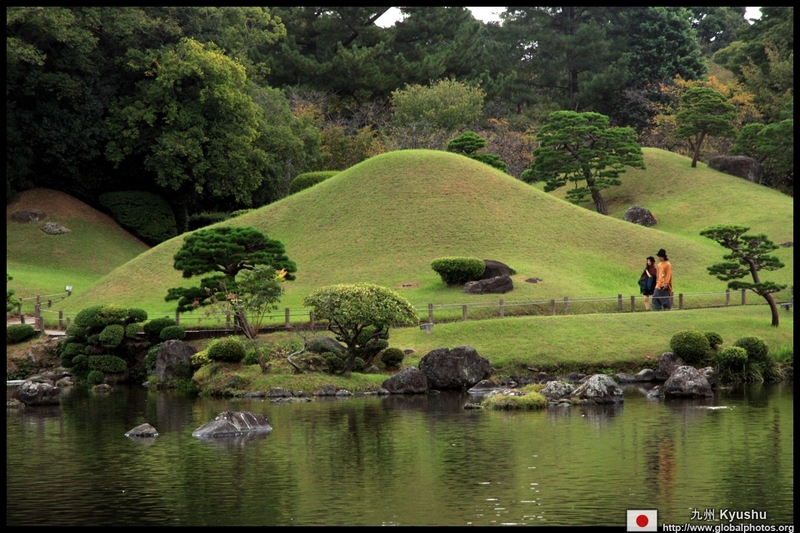 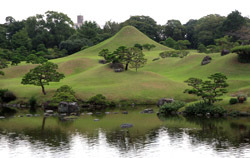 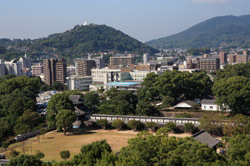 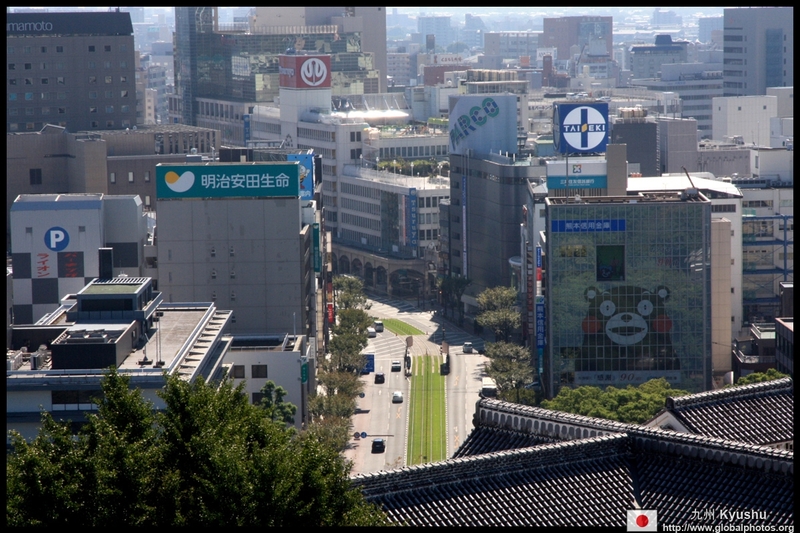 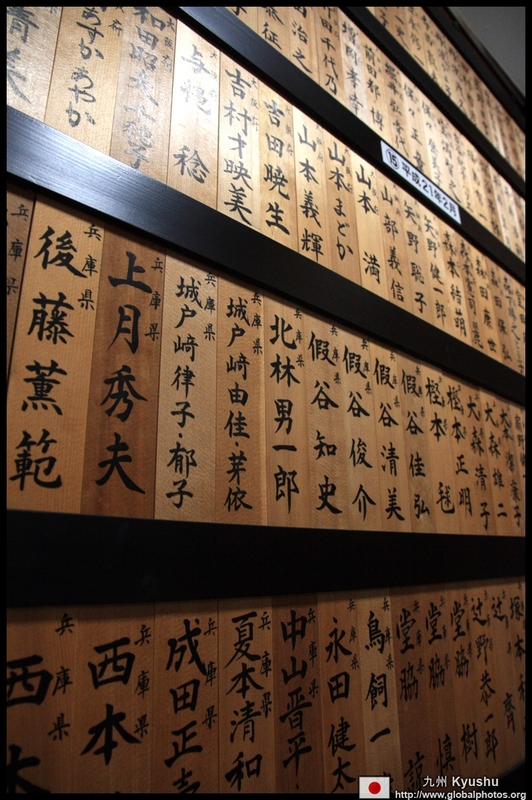 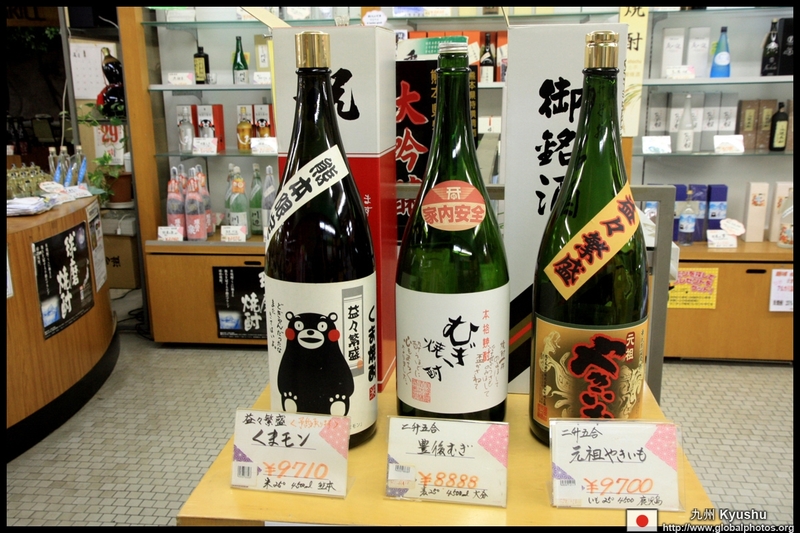 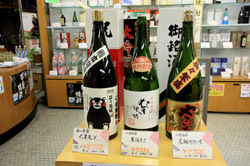 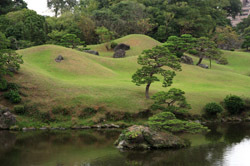 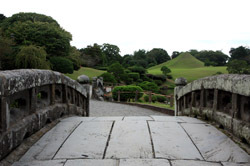 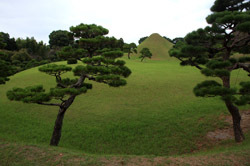 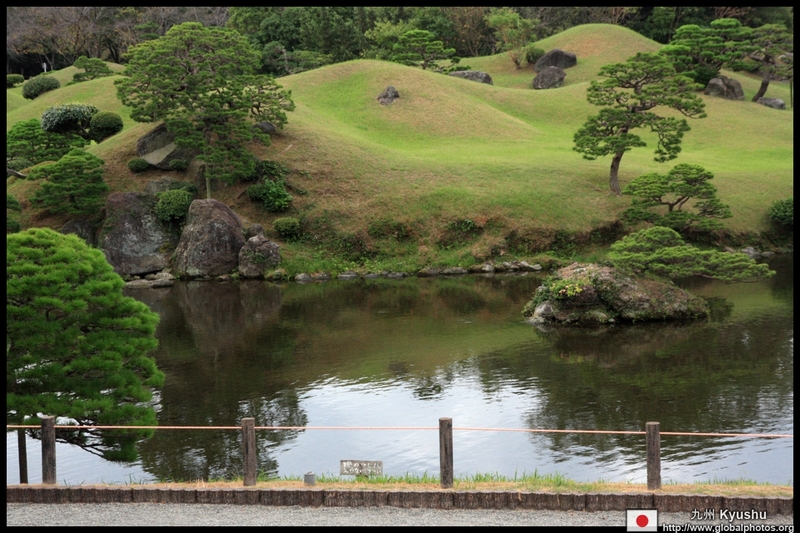 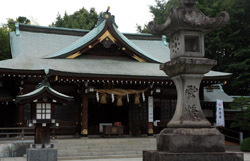 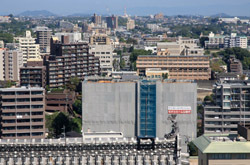 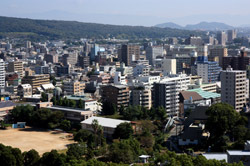 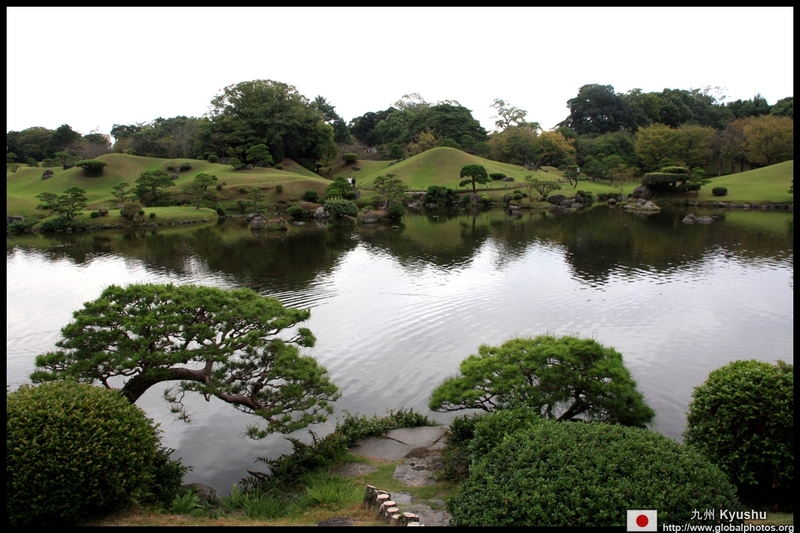 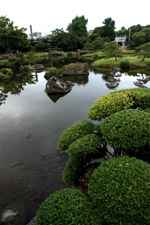 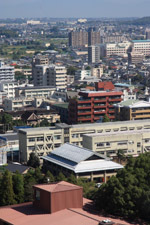 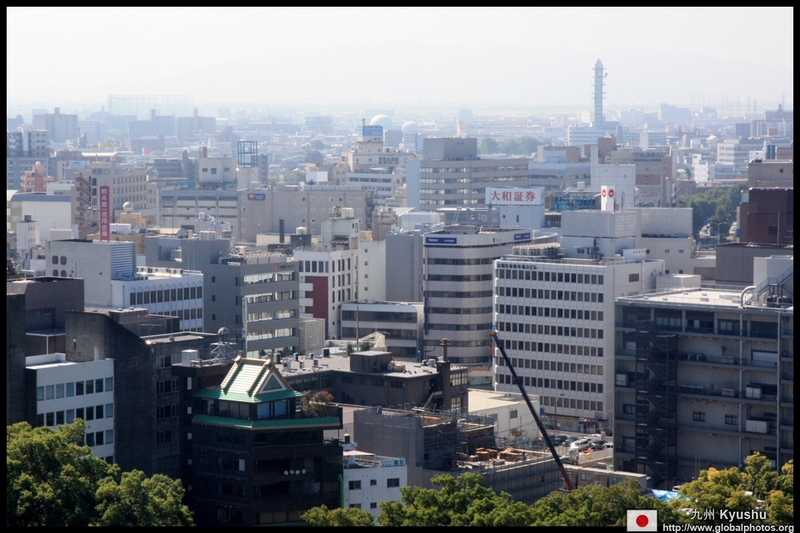 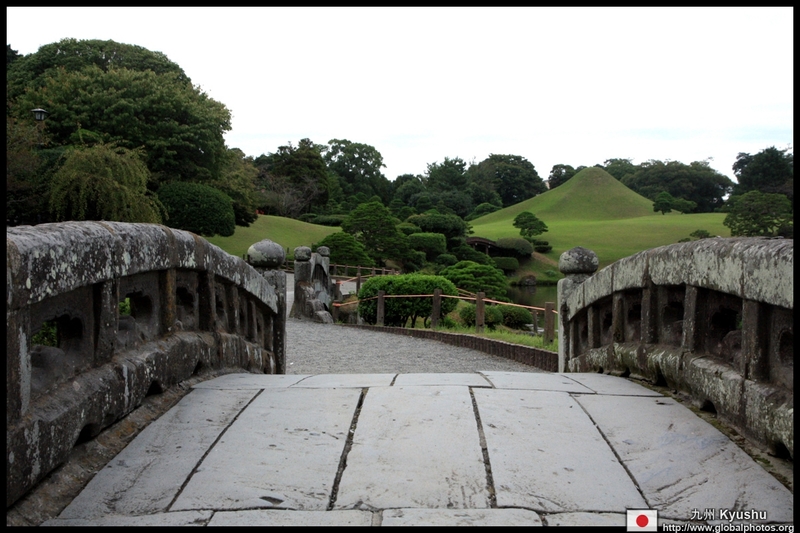 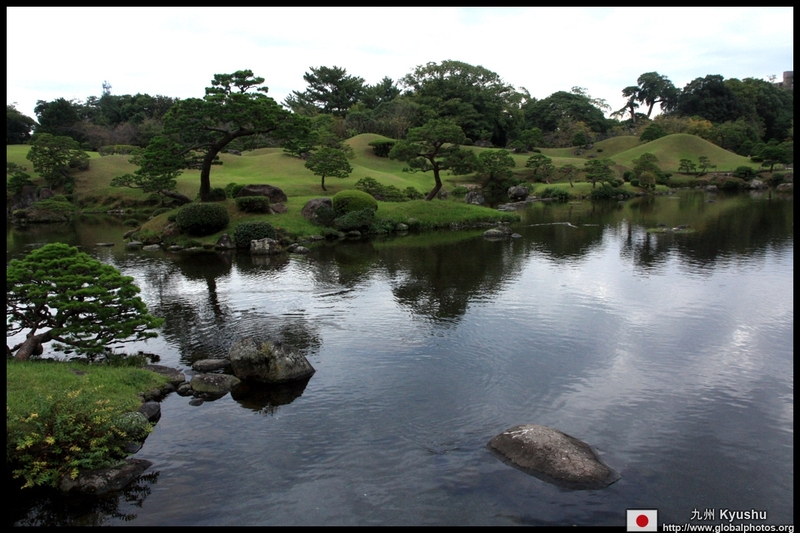 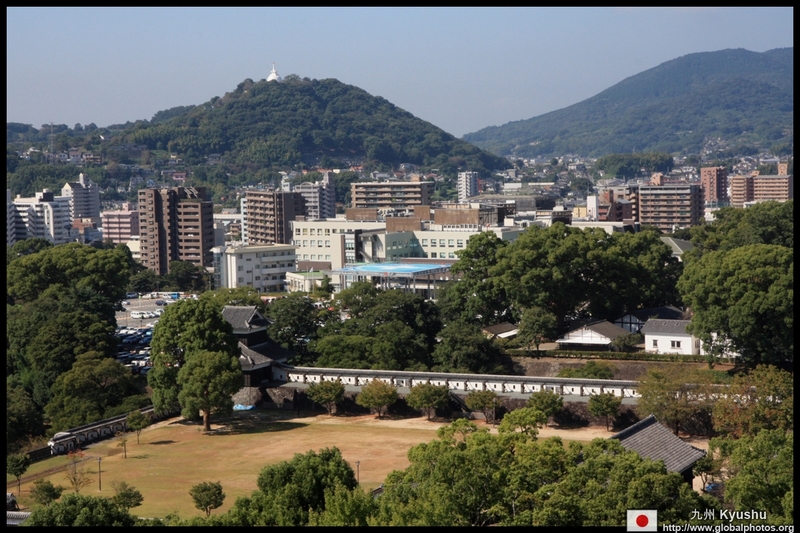 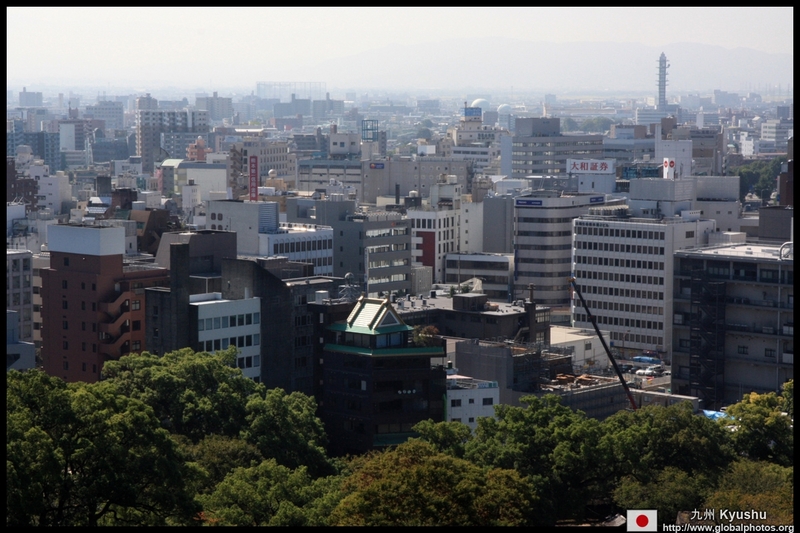 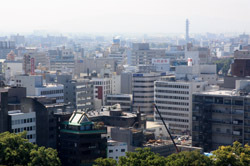 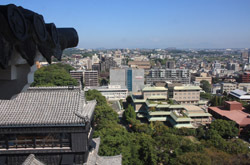 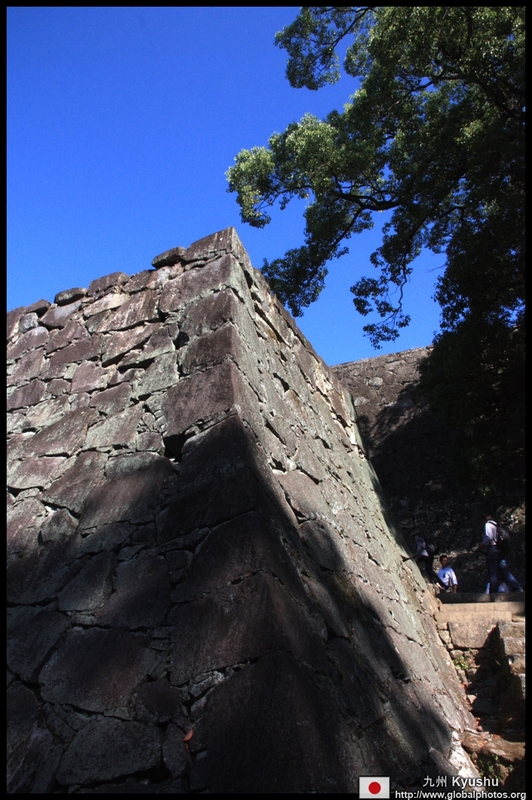 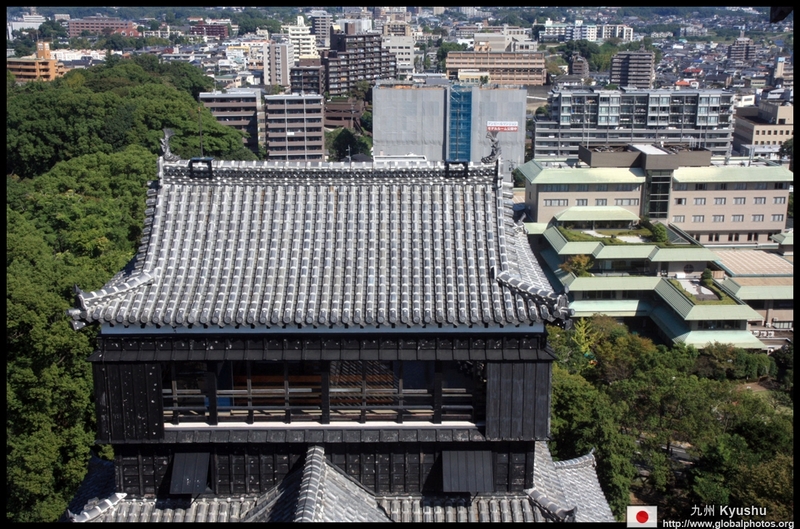 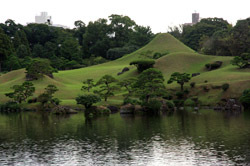 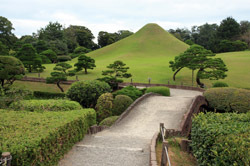 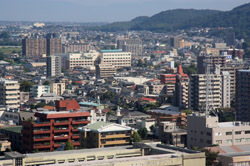 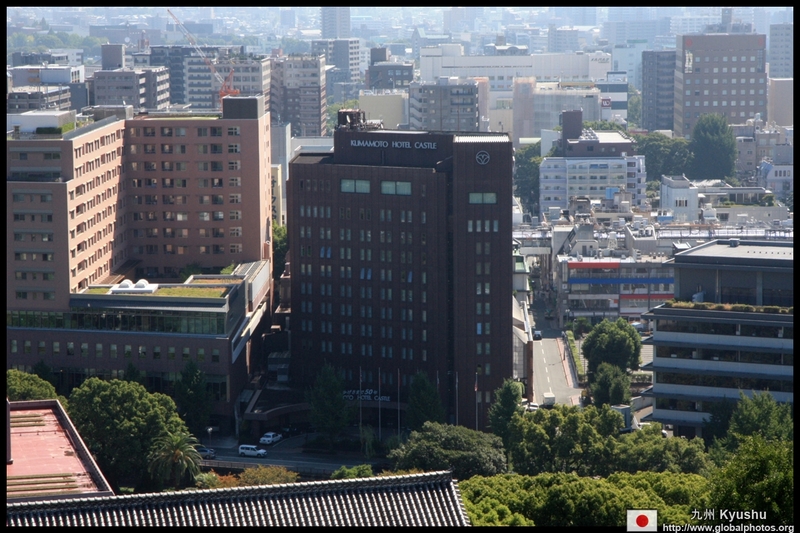 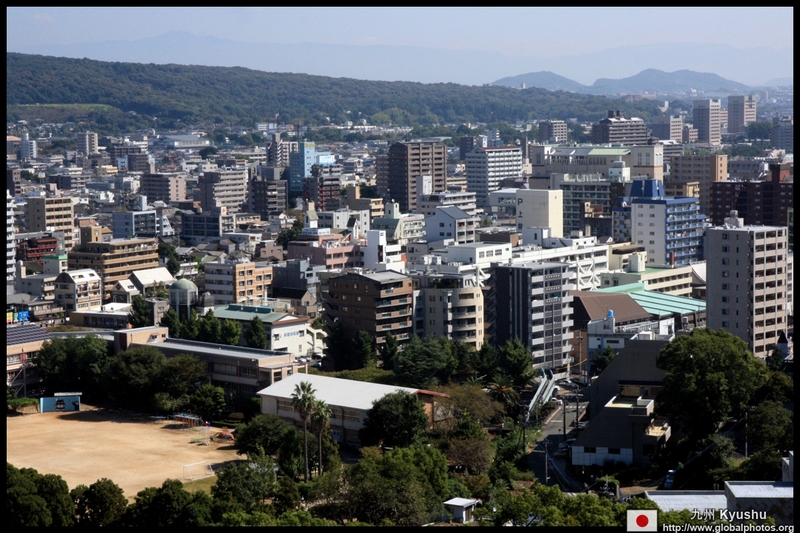 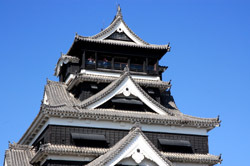 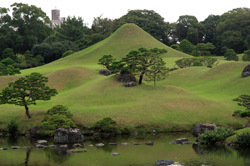 Kumamoto is in the middle of Kyushu and serves as the gateway to the Mount Aso region. 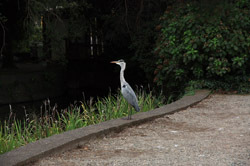 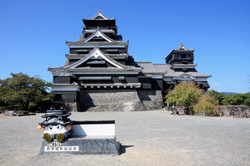 With a population of only 730,000, it has been an important castle town for centuries. 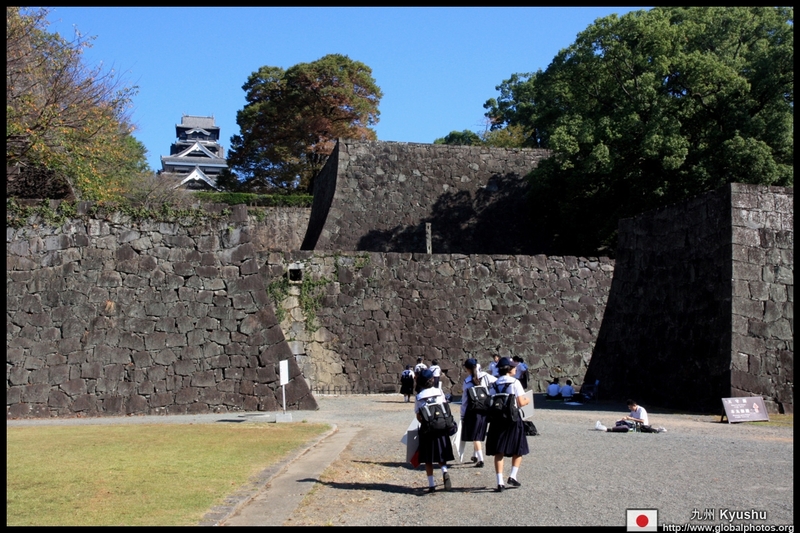 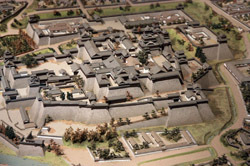 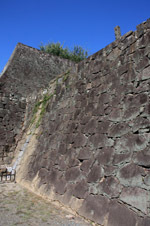 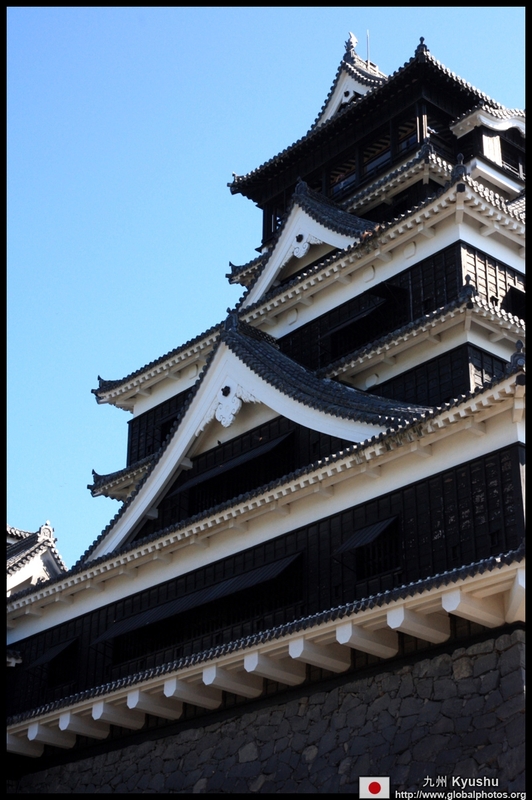 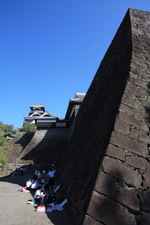 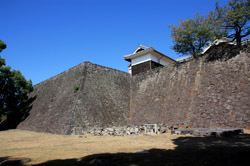 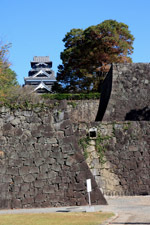 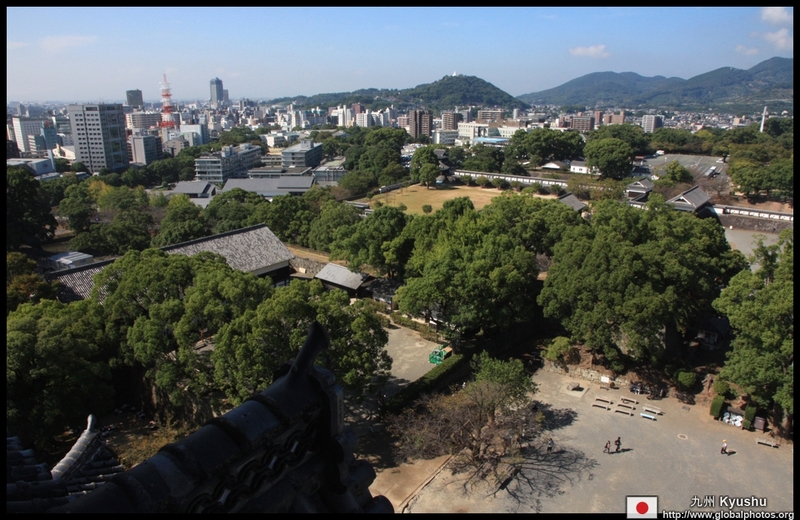 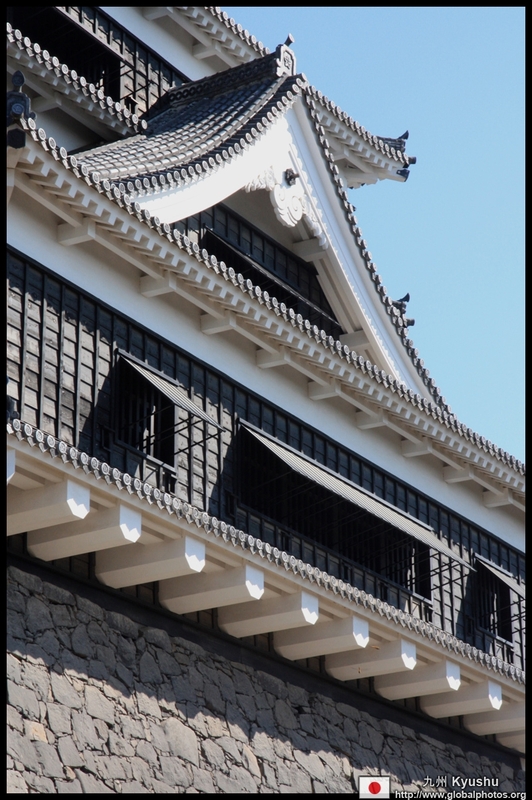 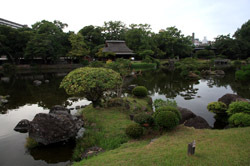 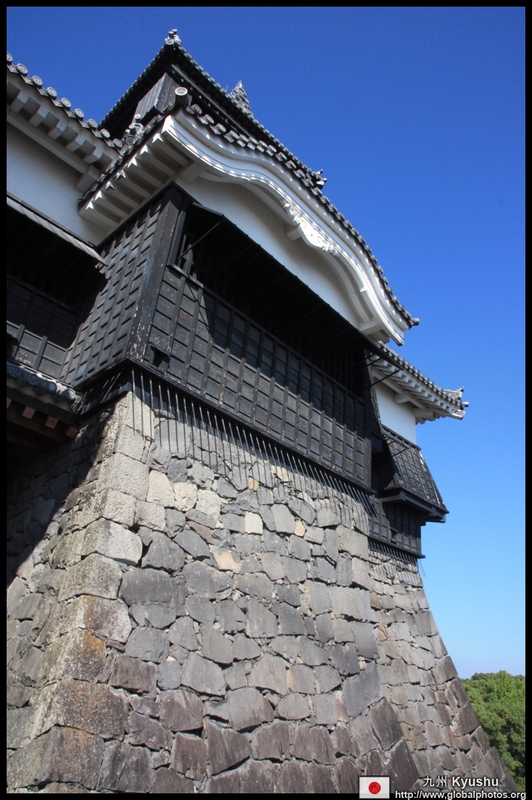 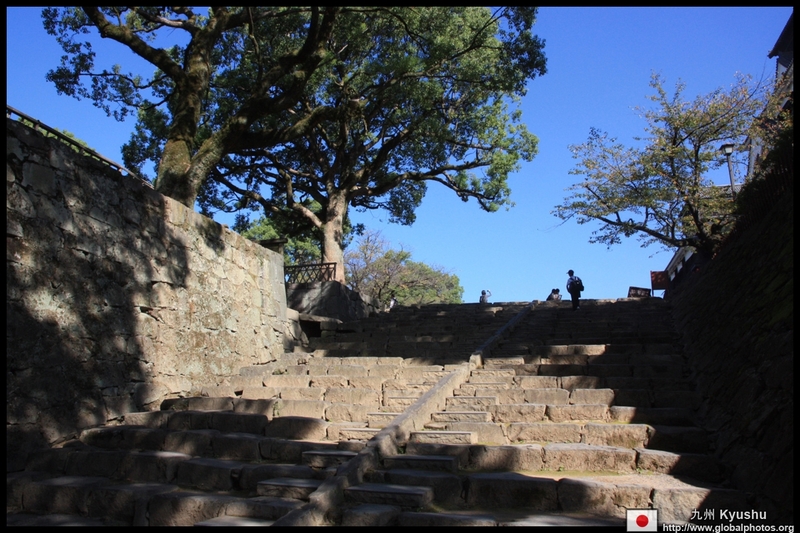 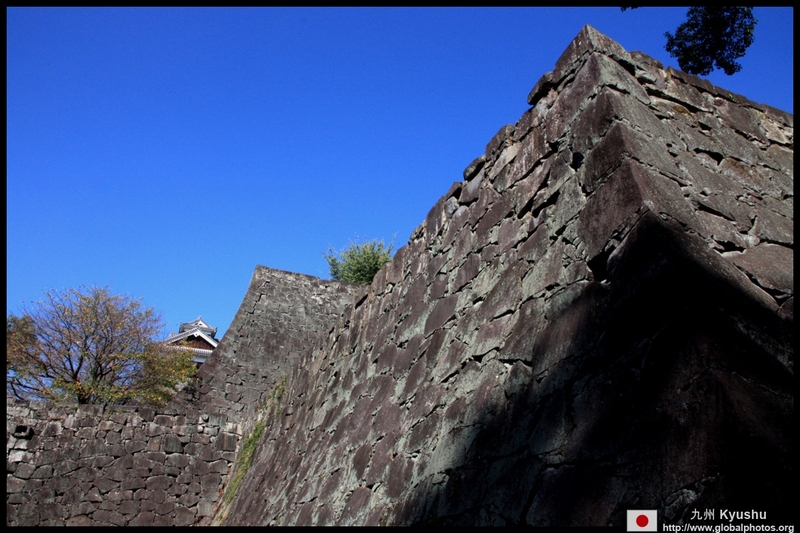 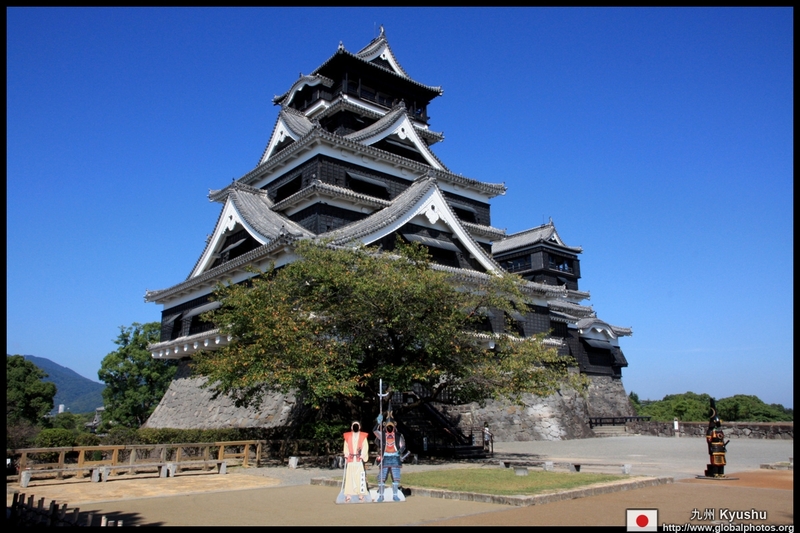 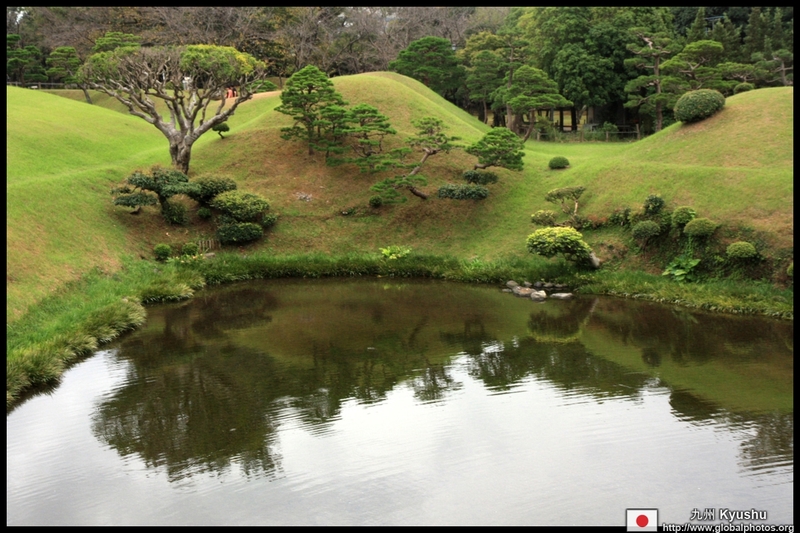 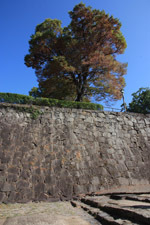 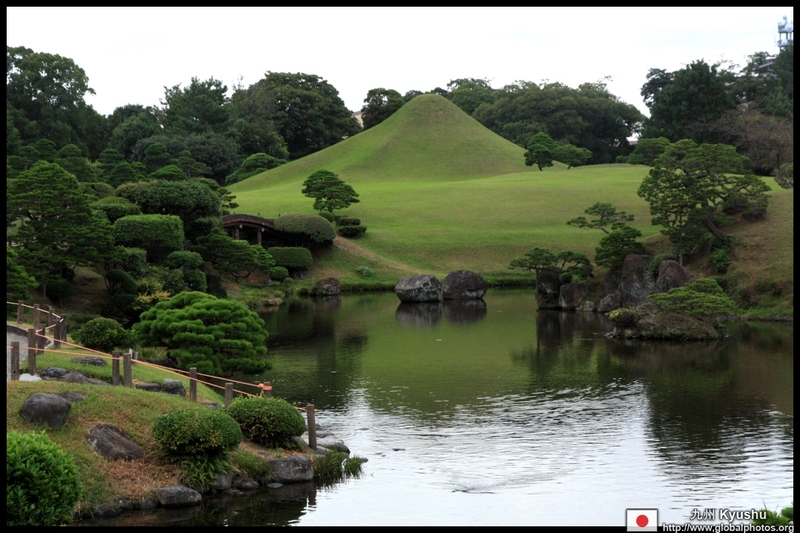 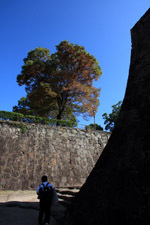 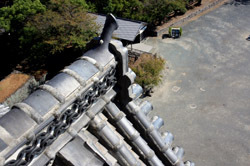 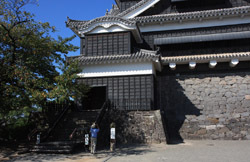 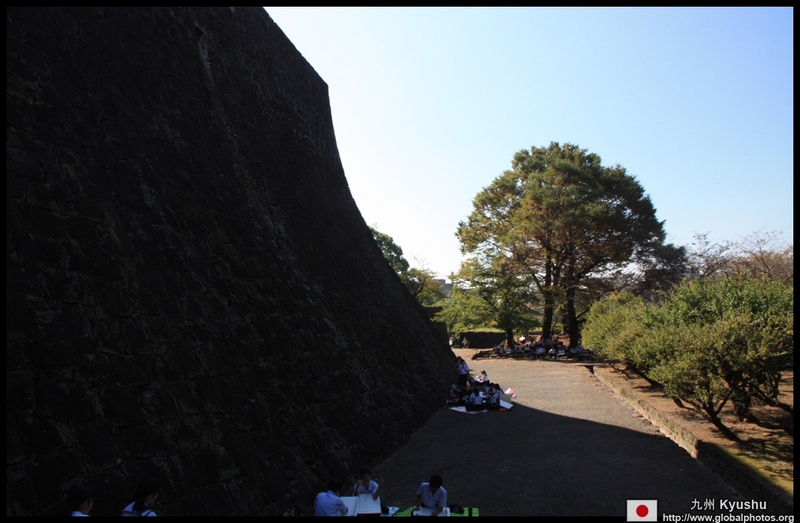 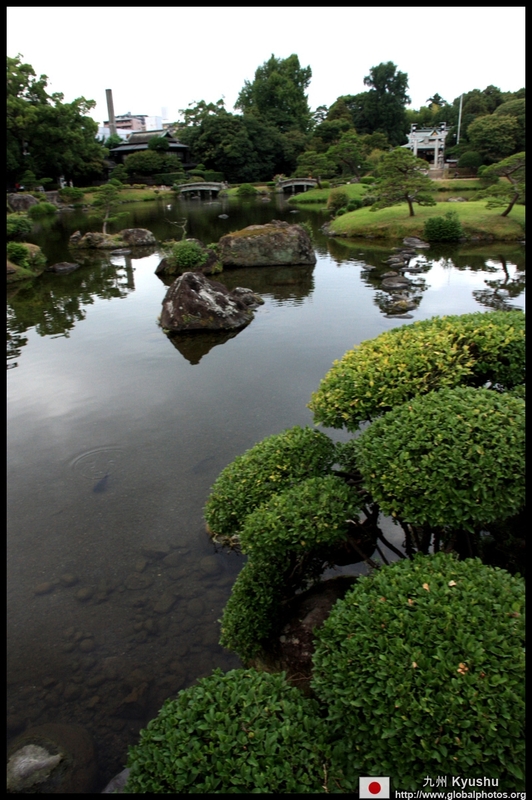 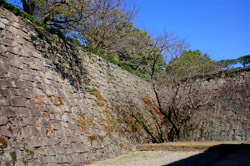 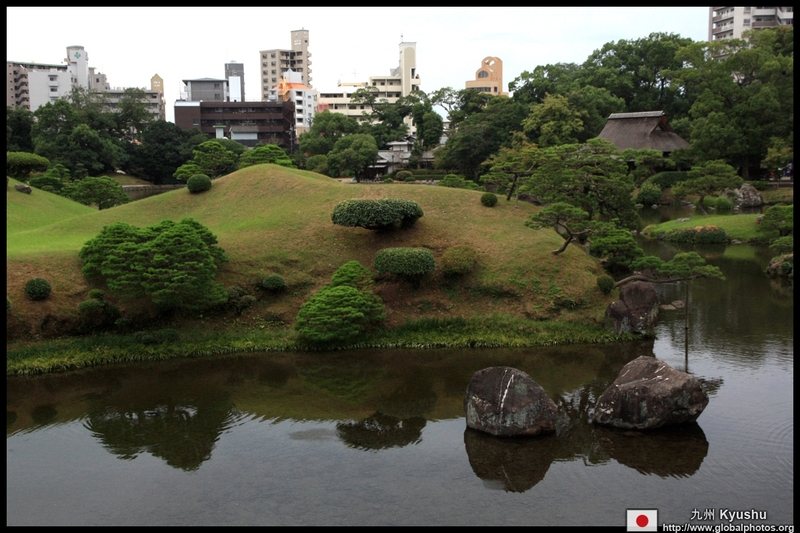 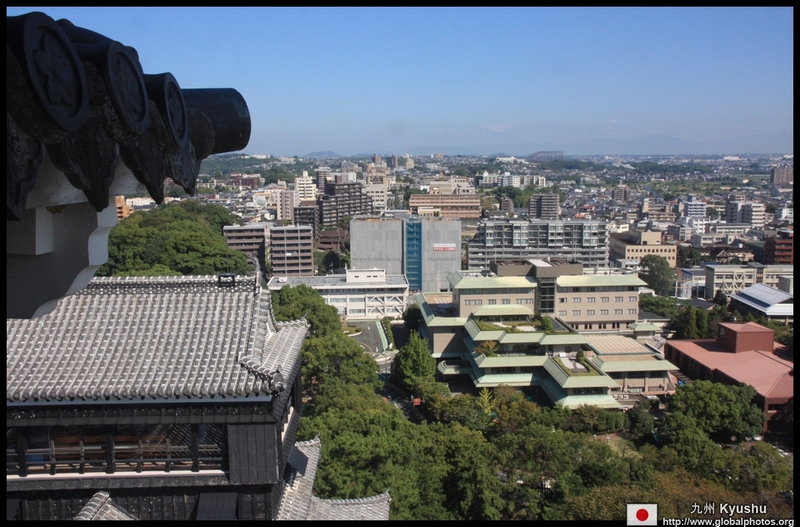 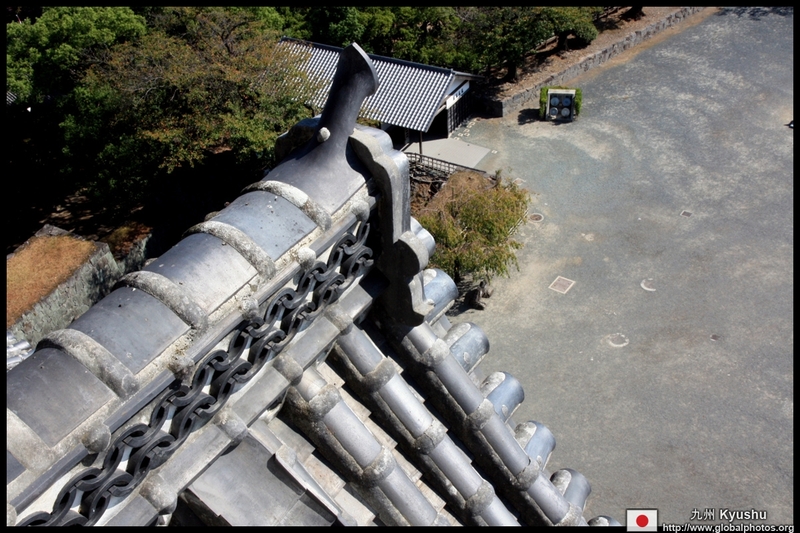 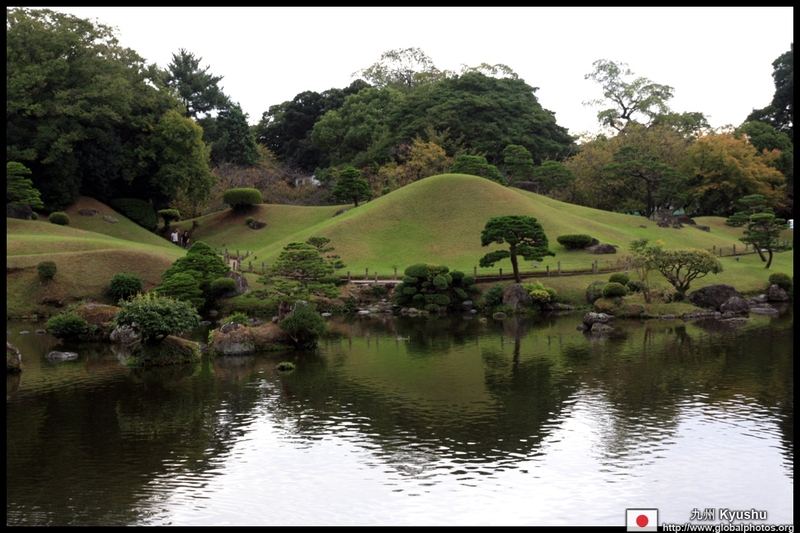 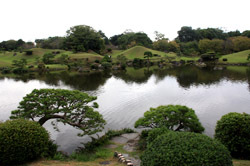 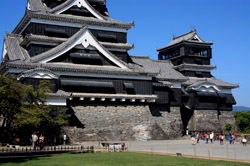 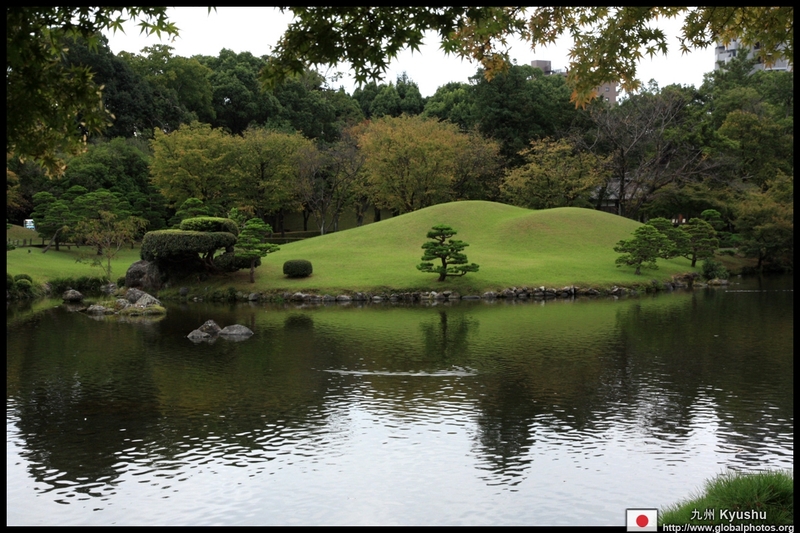 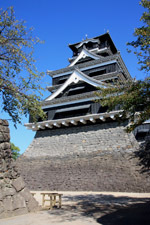 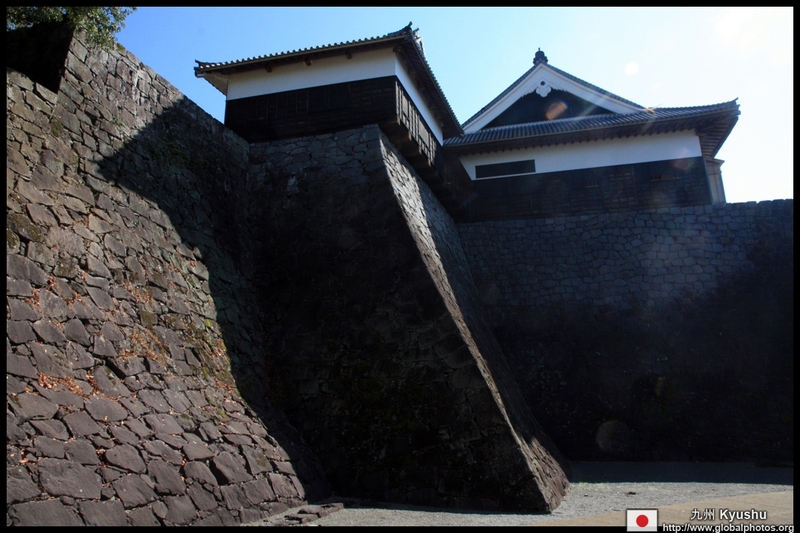 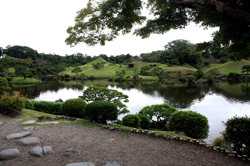 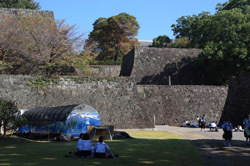 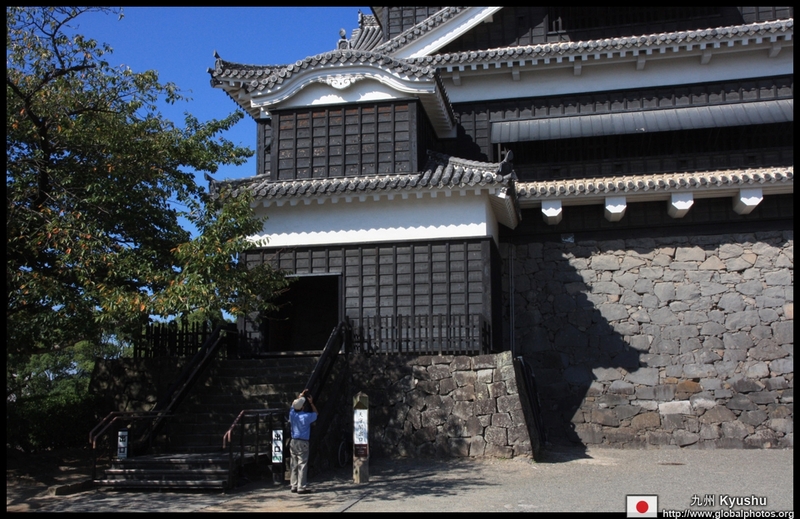 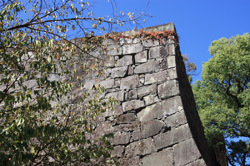 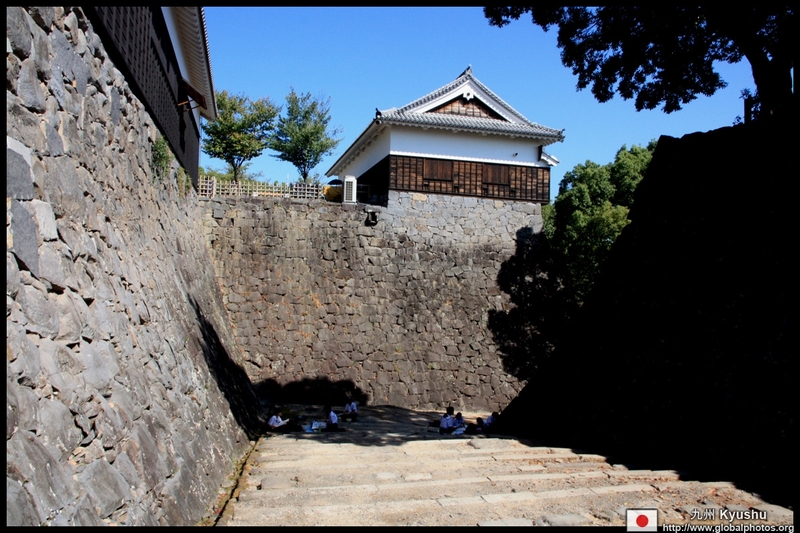 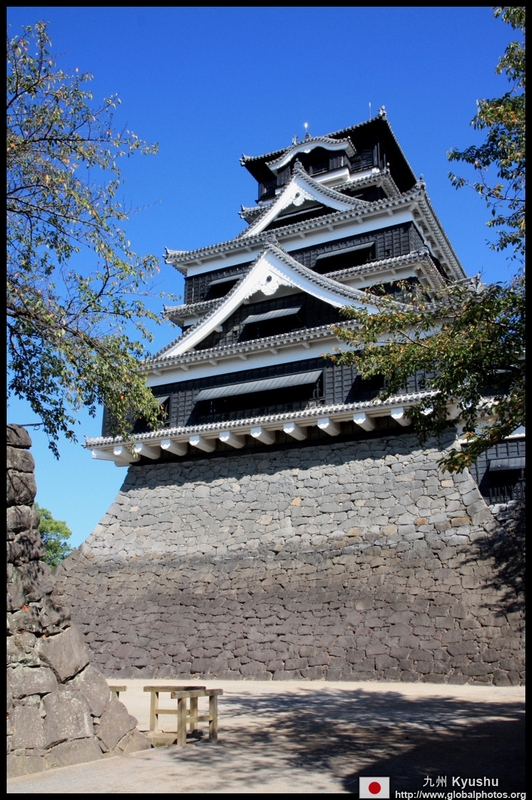 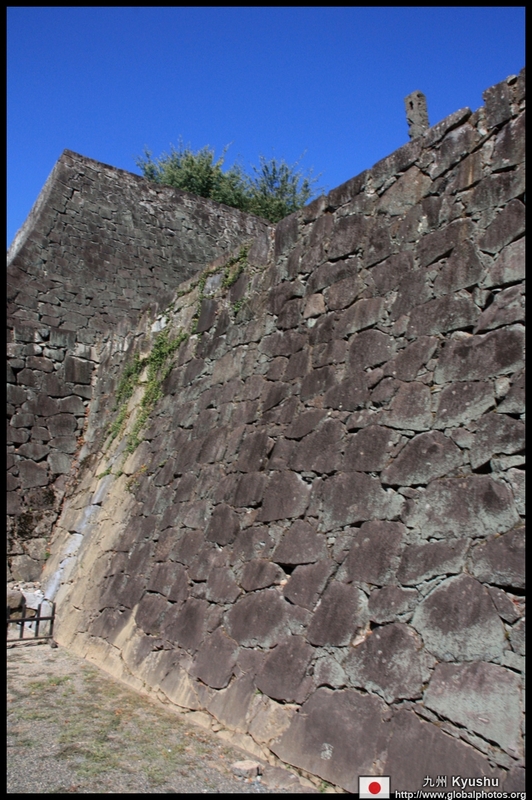 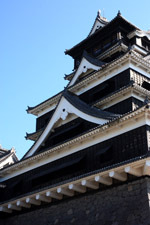 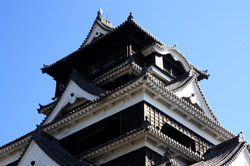 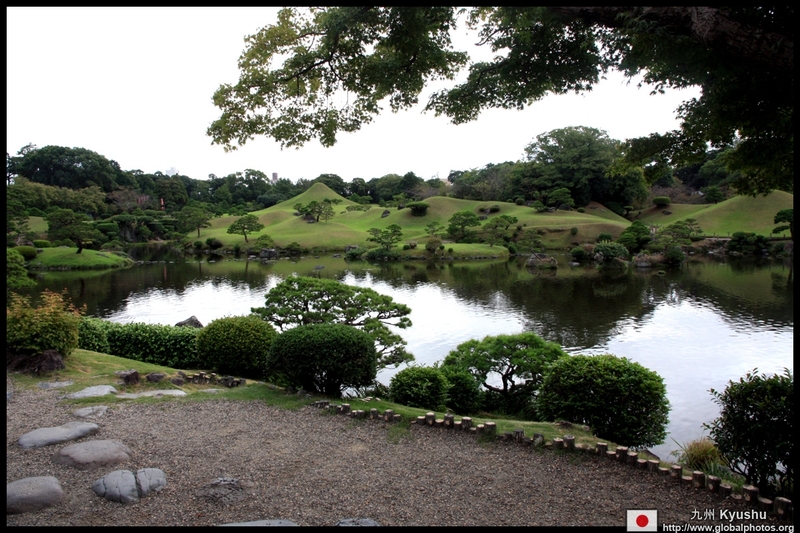 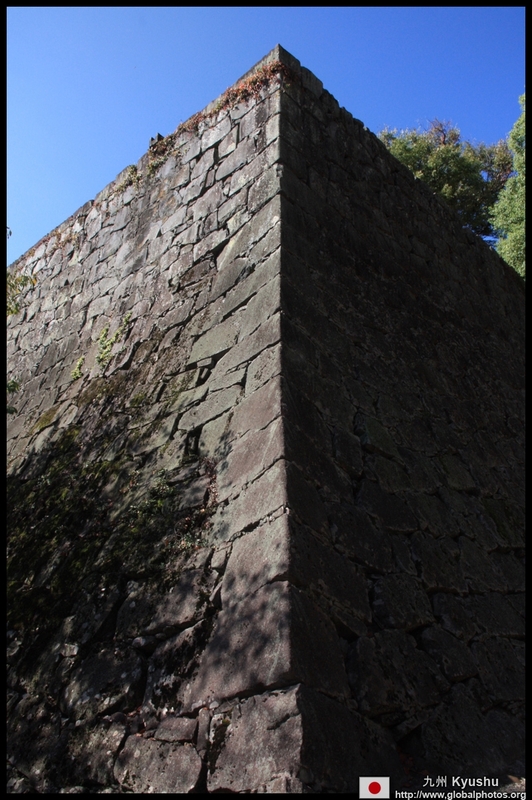 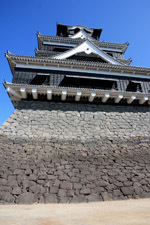 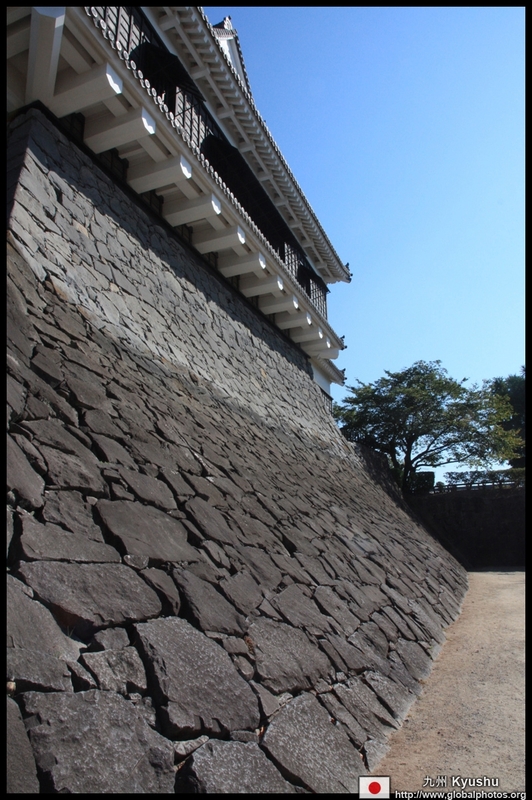 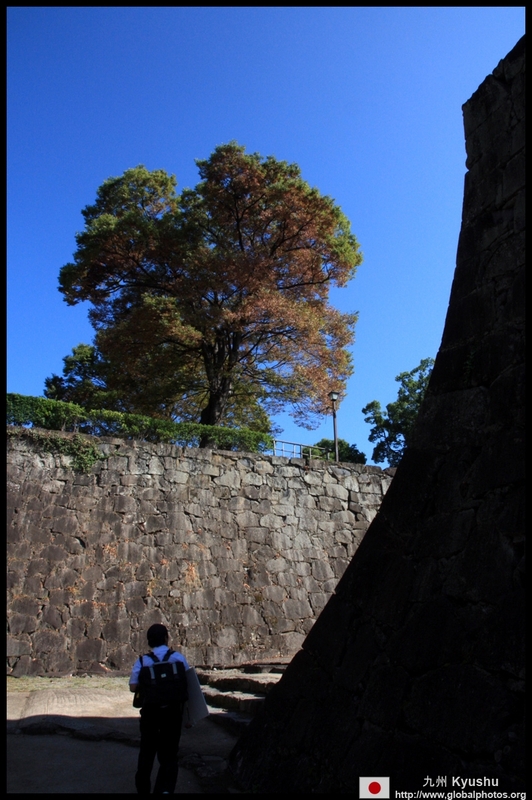 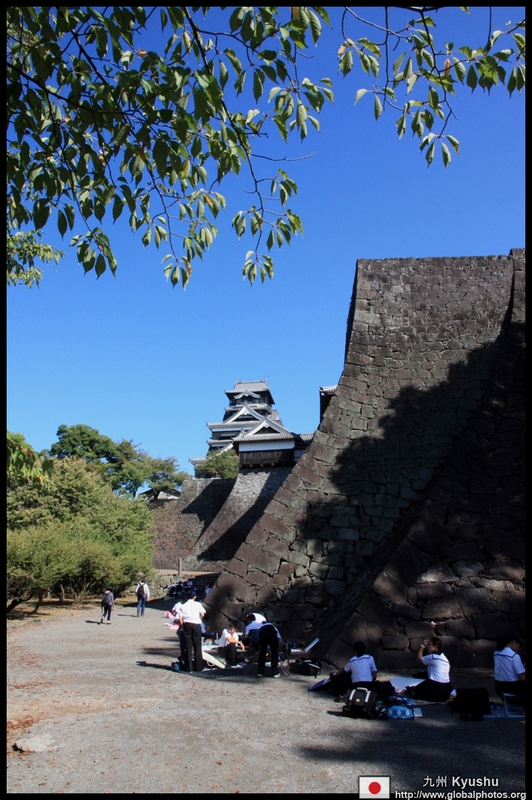 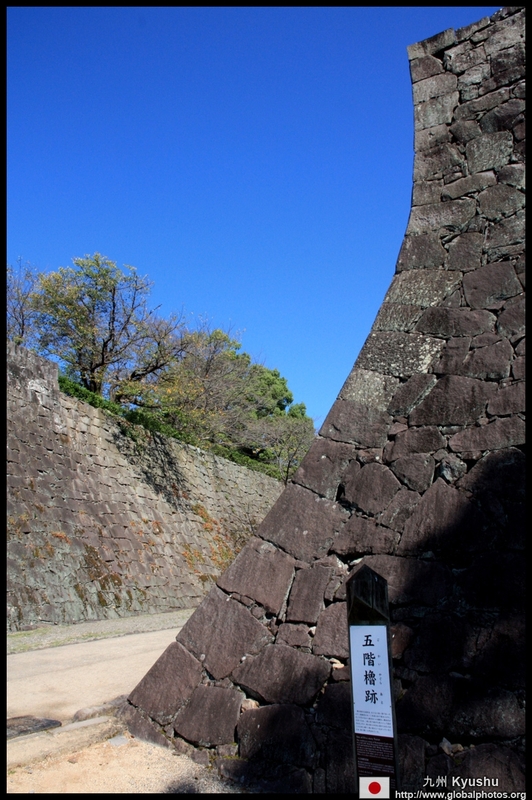 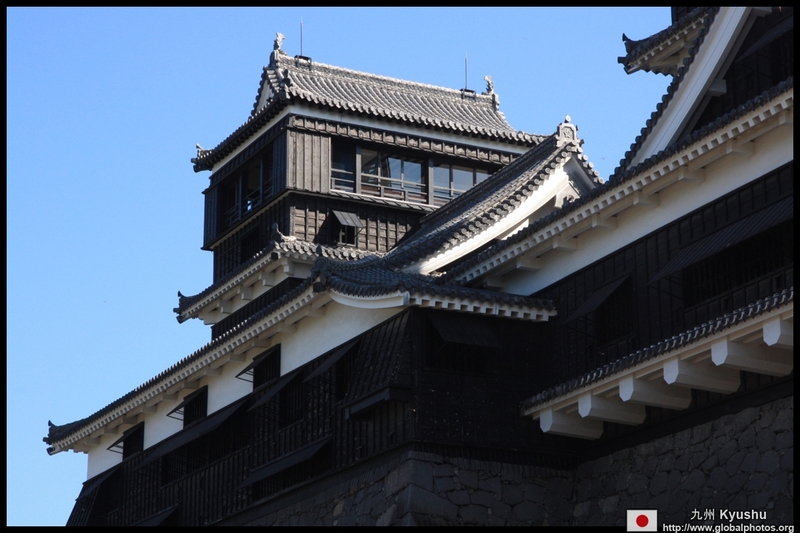 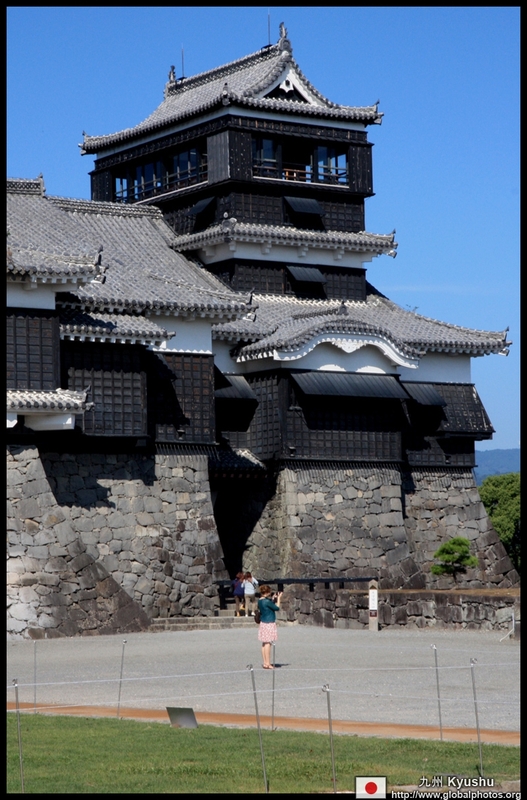 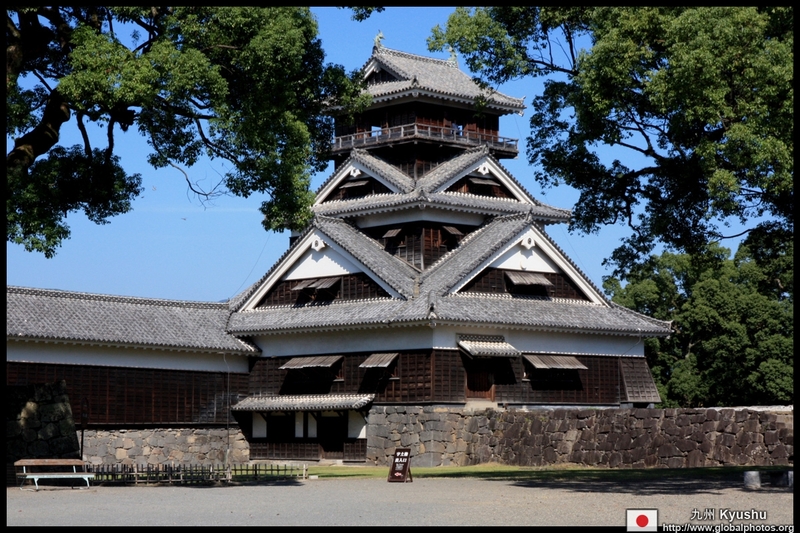 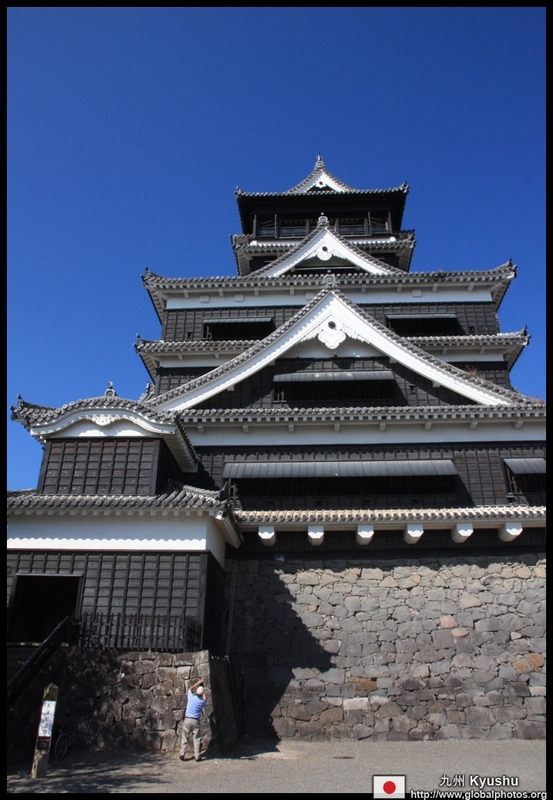 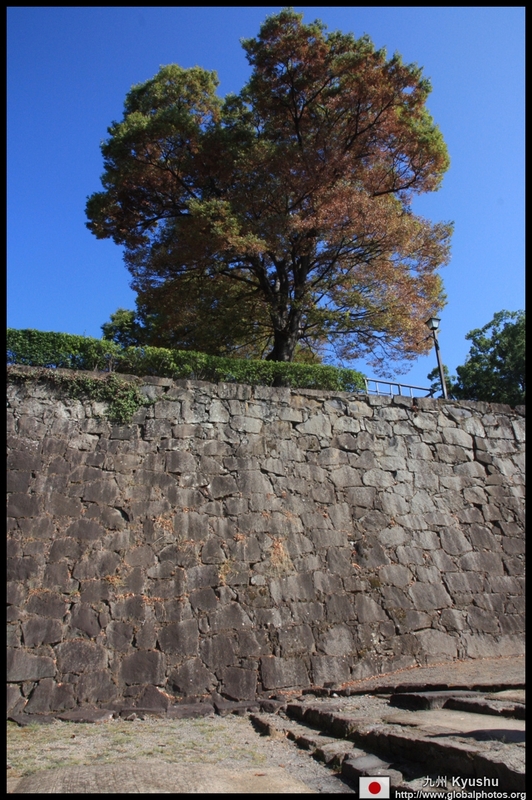 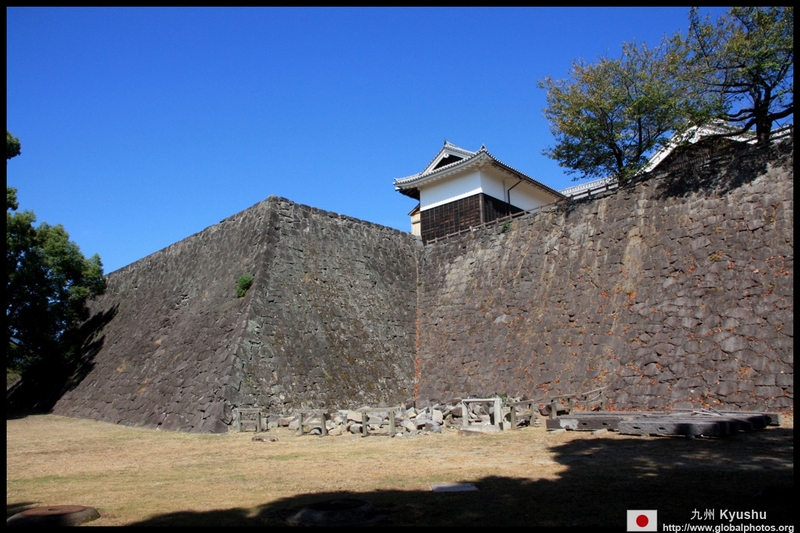 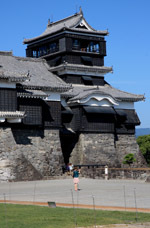 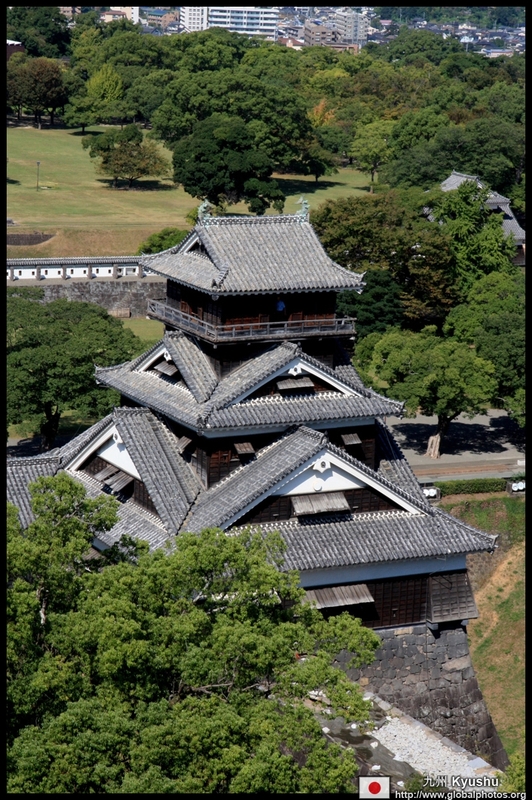 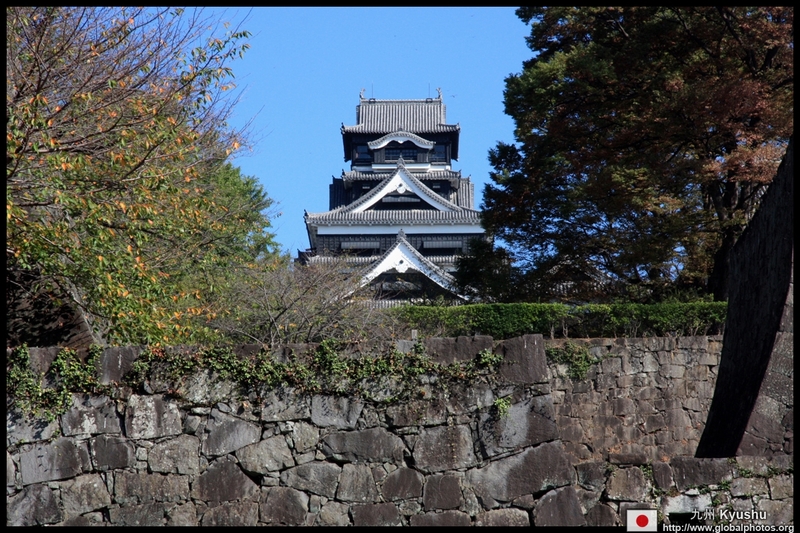 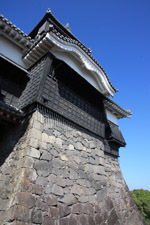 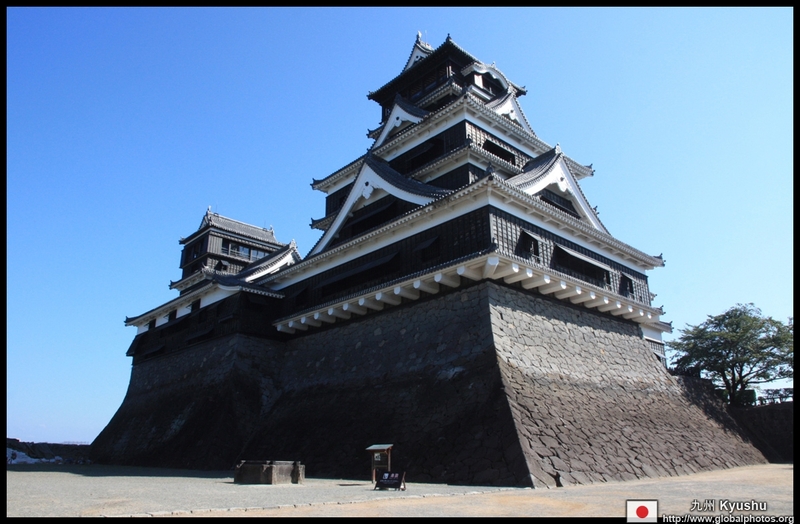 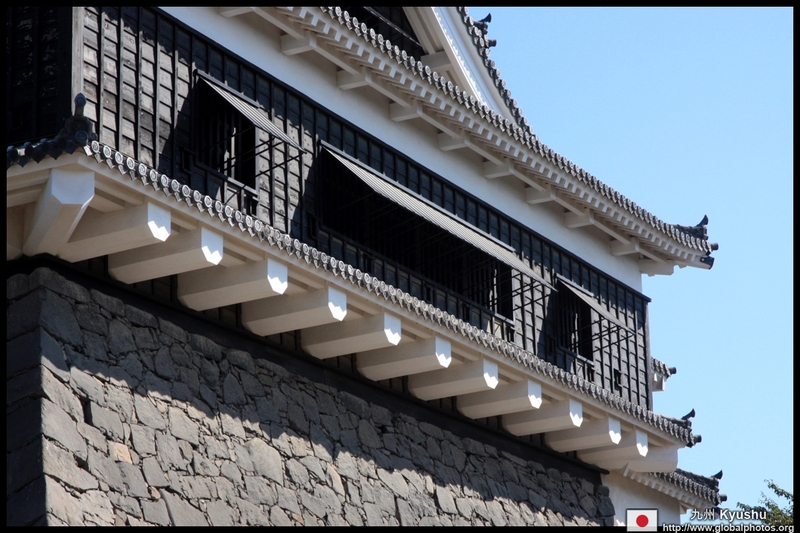 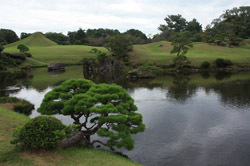 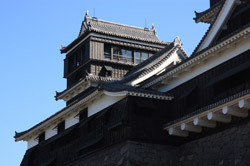 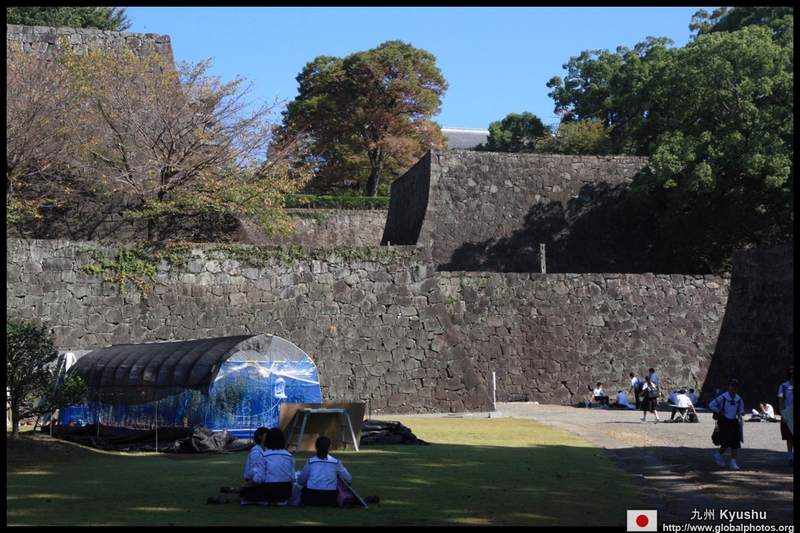 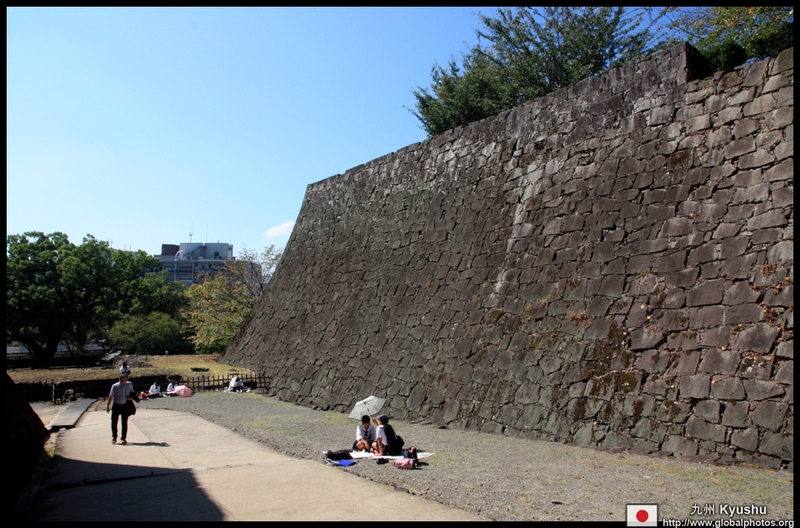 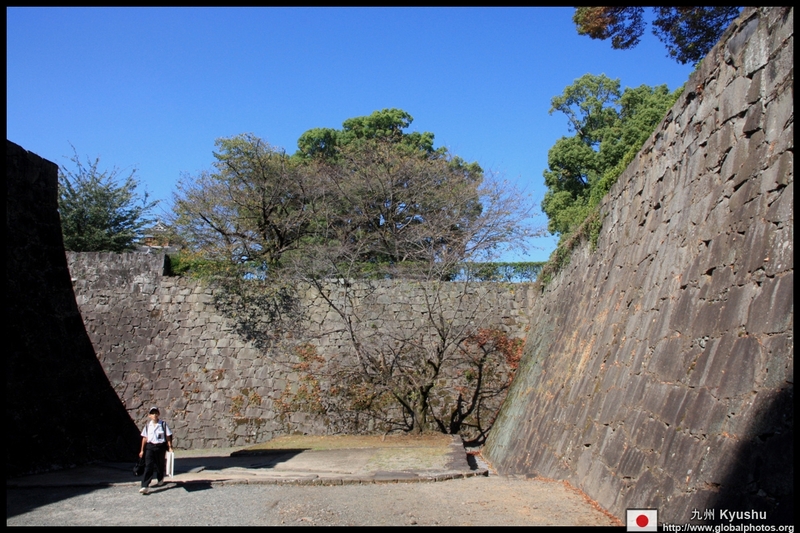 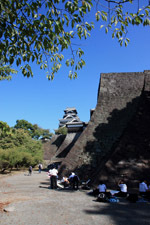 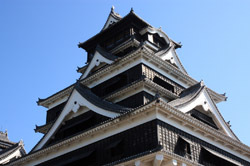 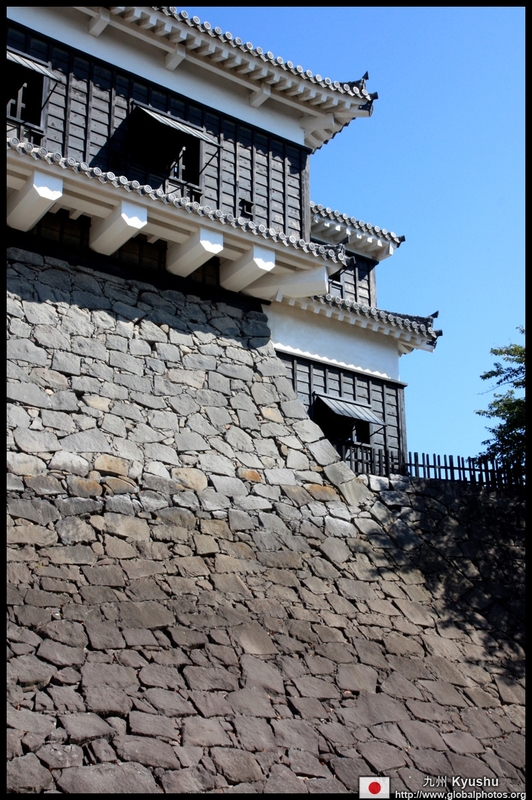 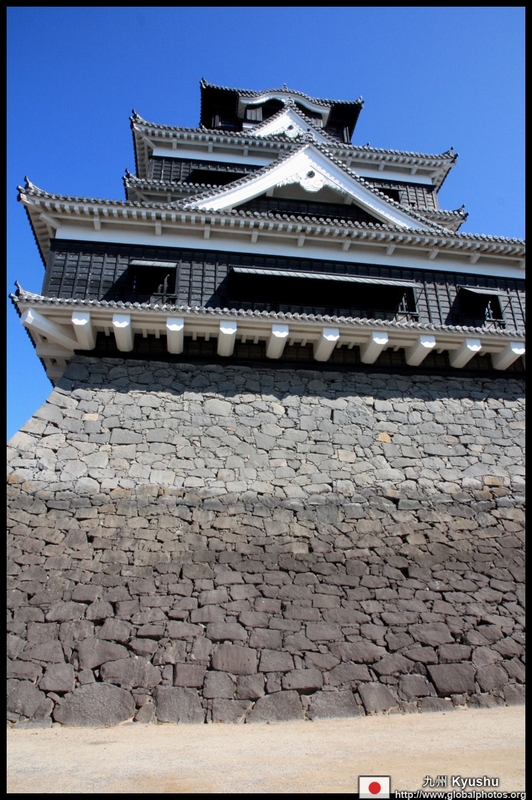 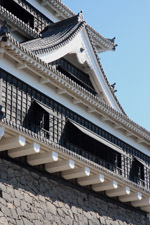 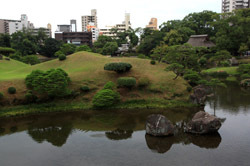 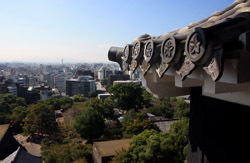 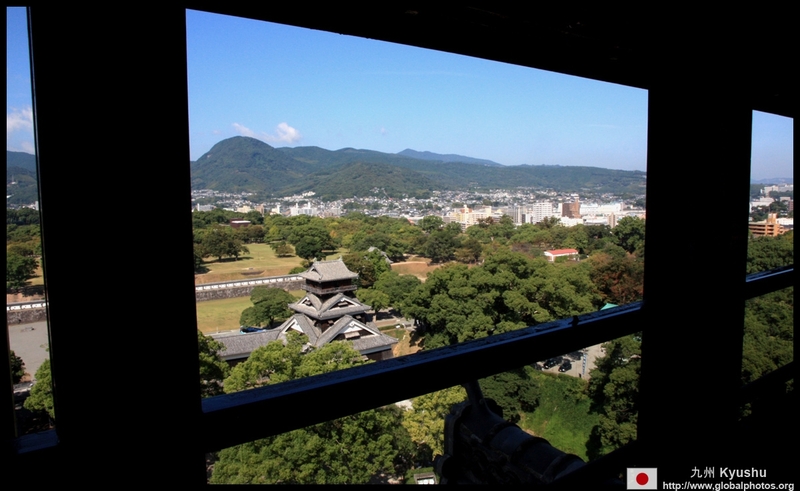 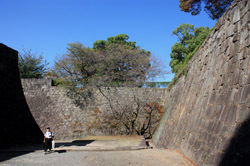 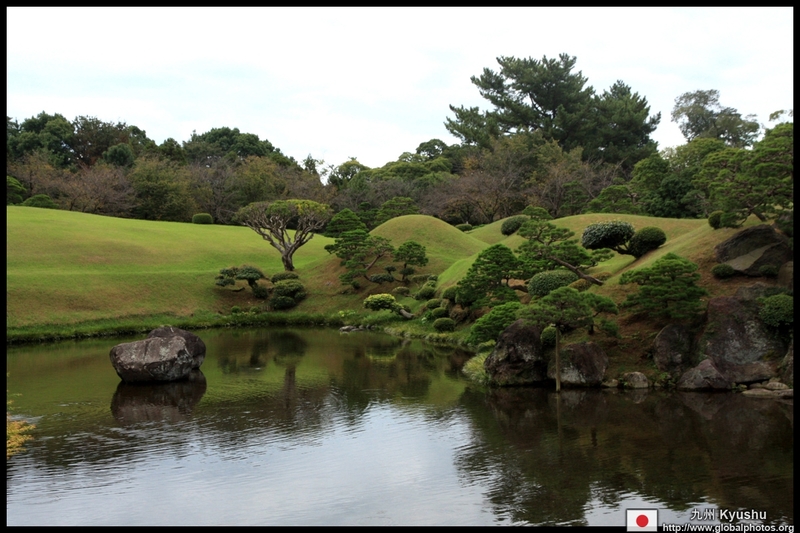 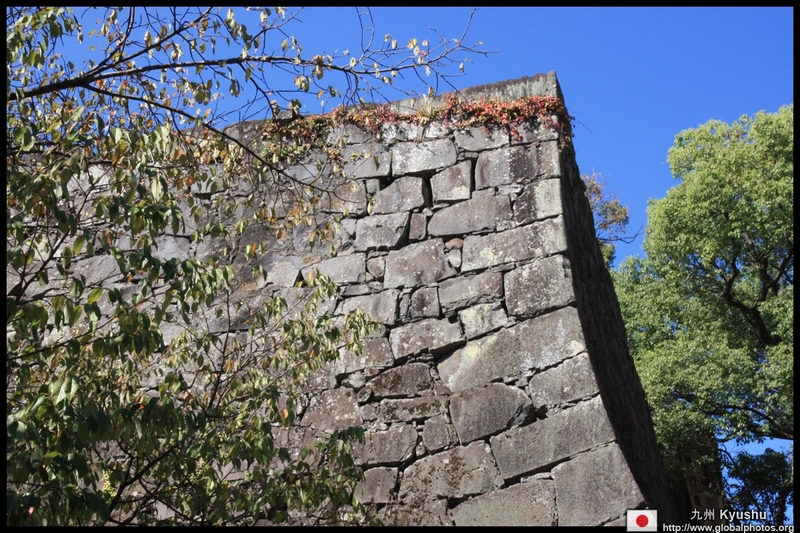 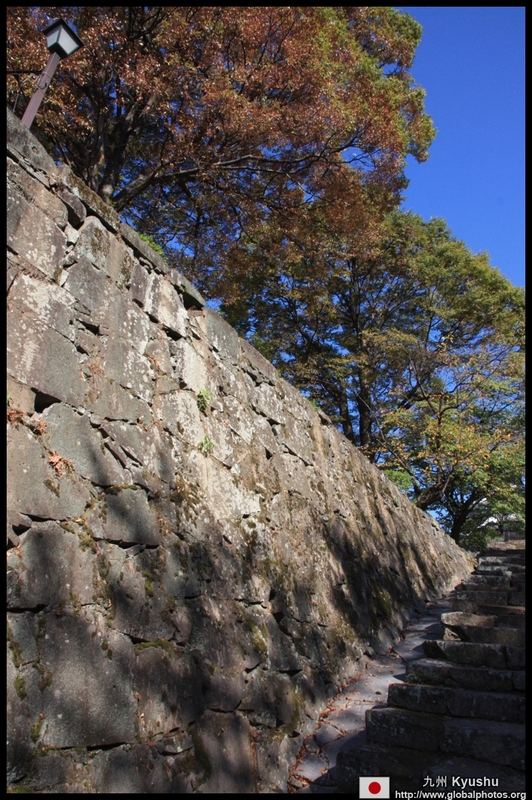 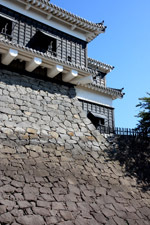 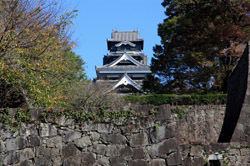 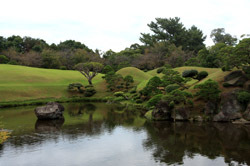 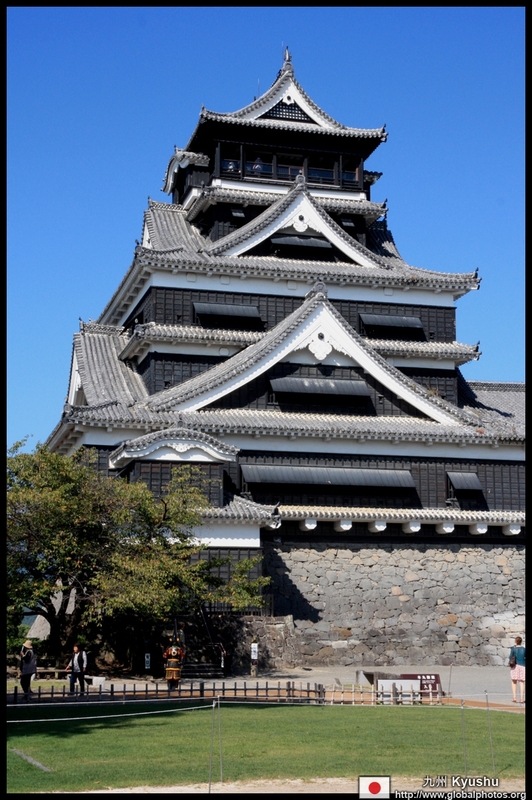 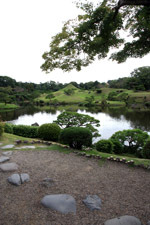 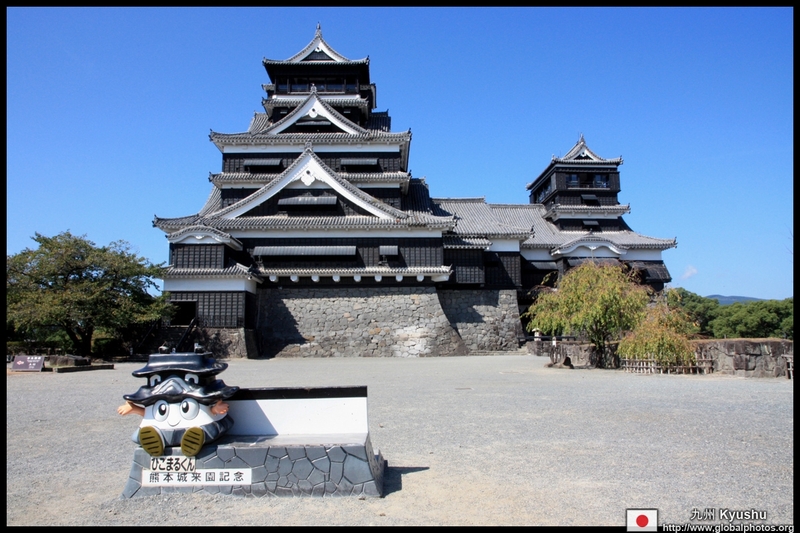 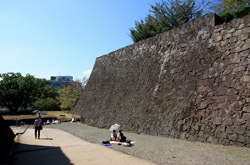 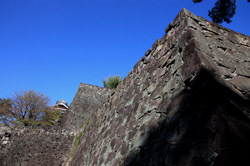 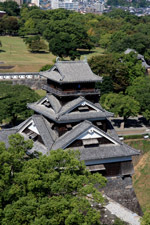 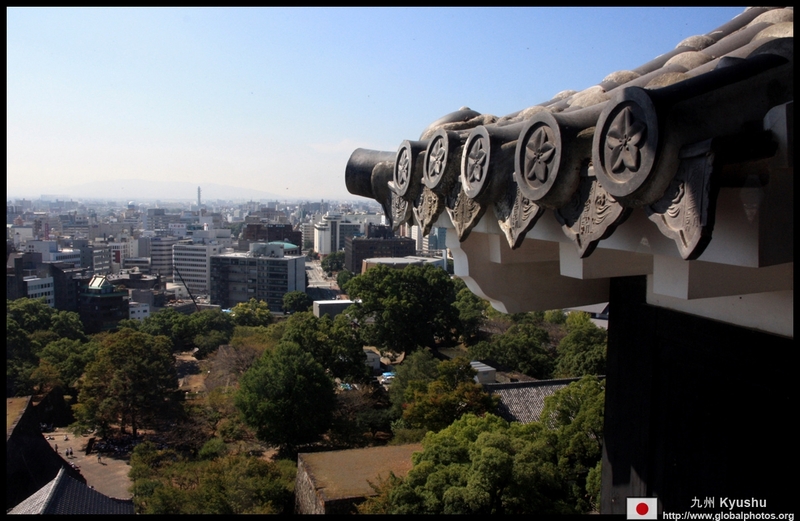 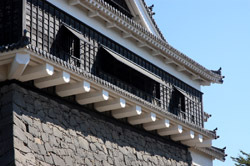 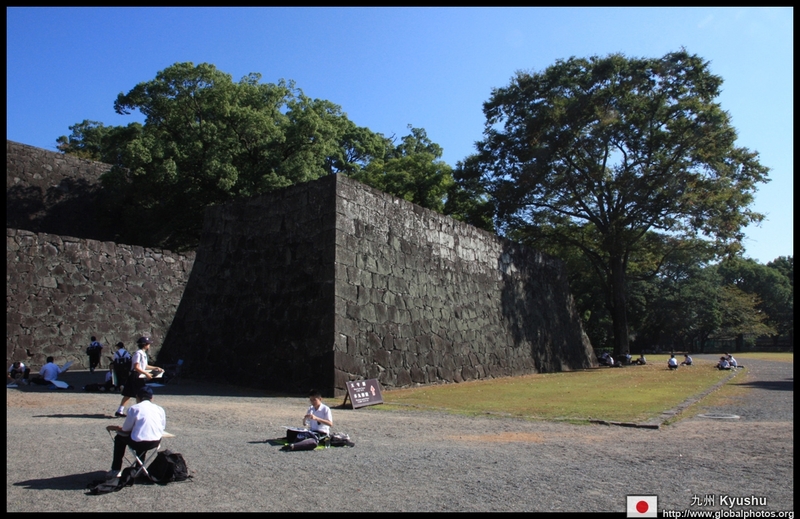 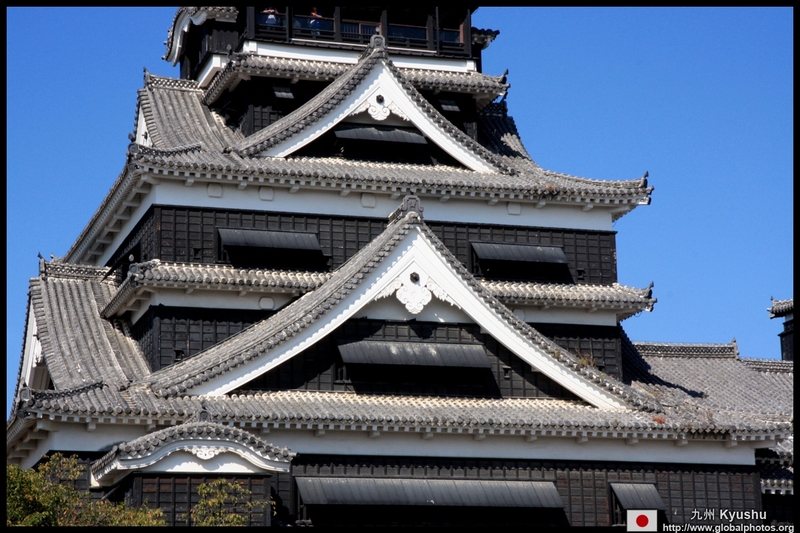 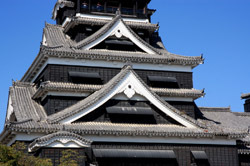 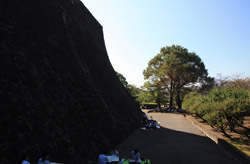 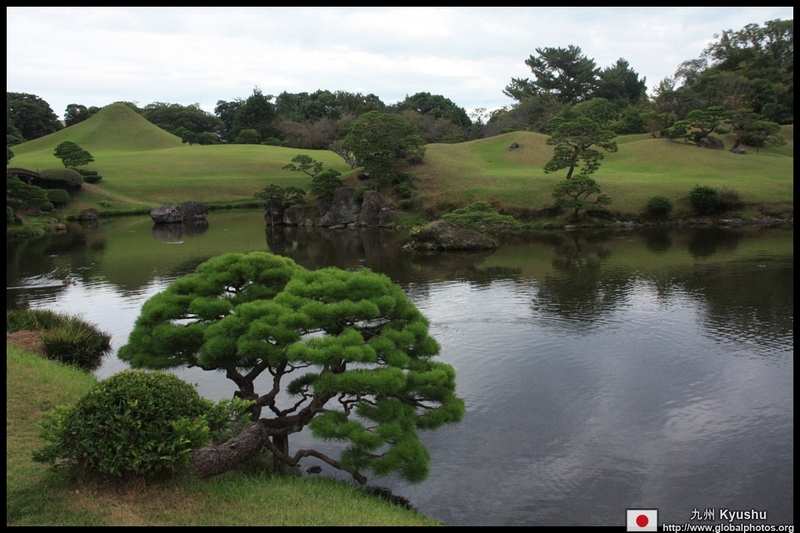 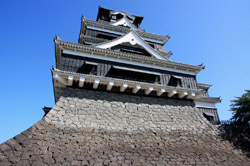 Kumamoto Castle was built in 1607 by a feudal lord. 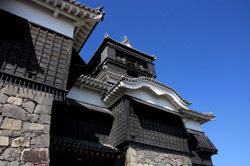 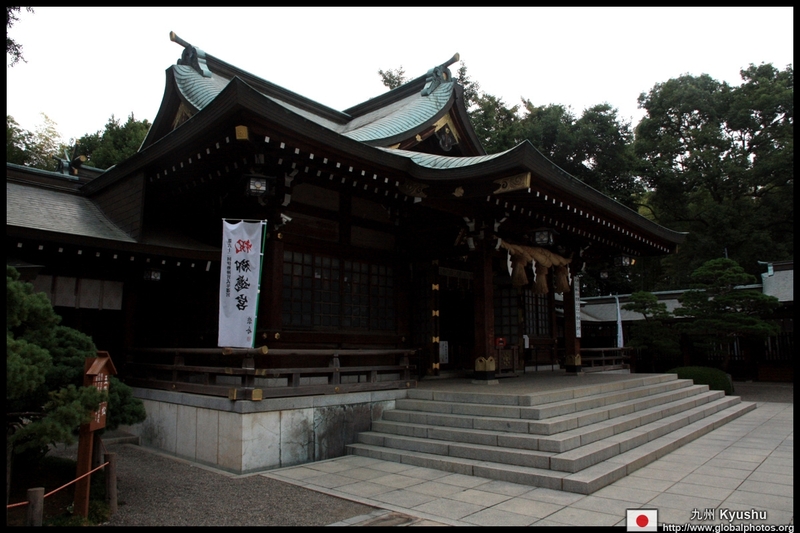 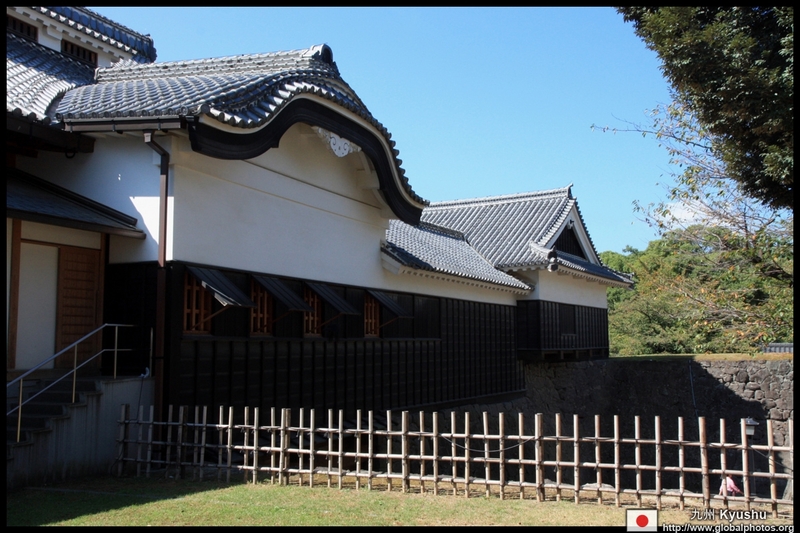 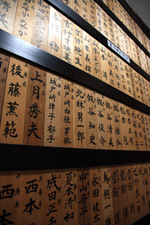 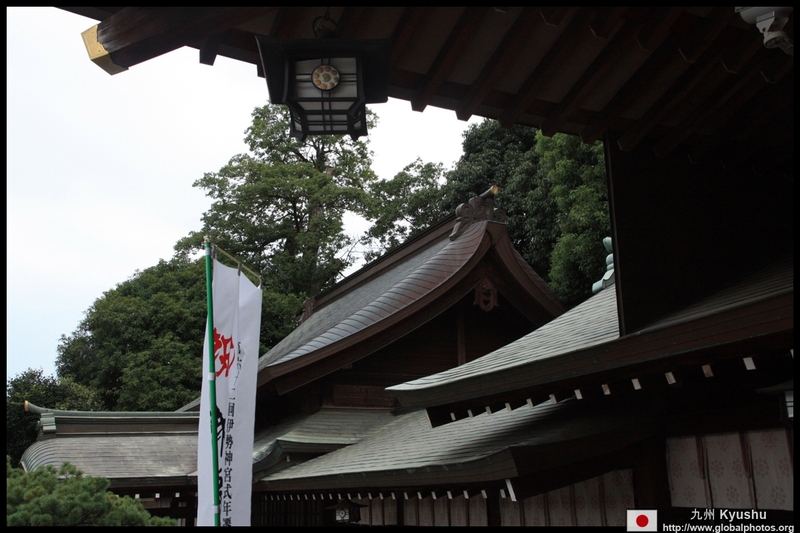 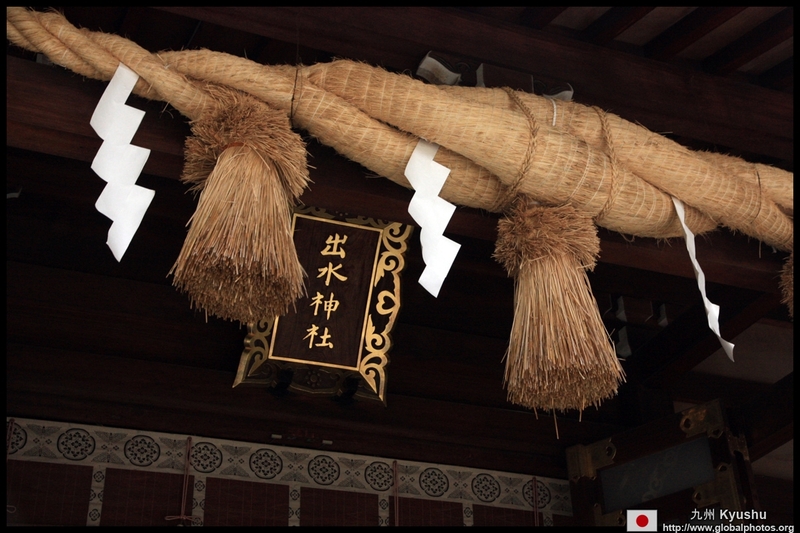 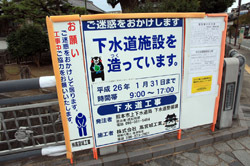 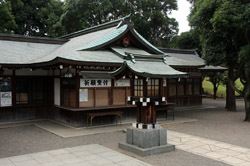 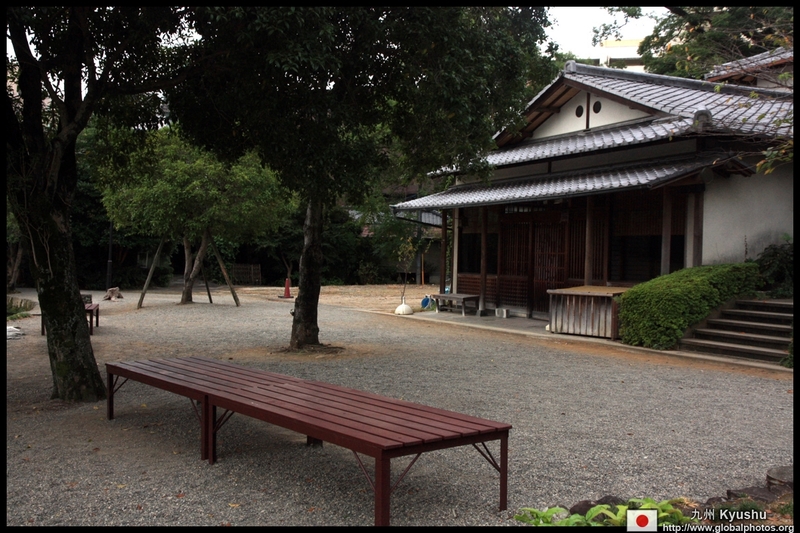 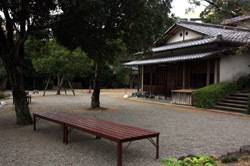 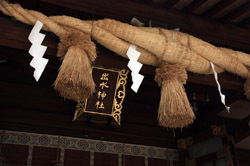 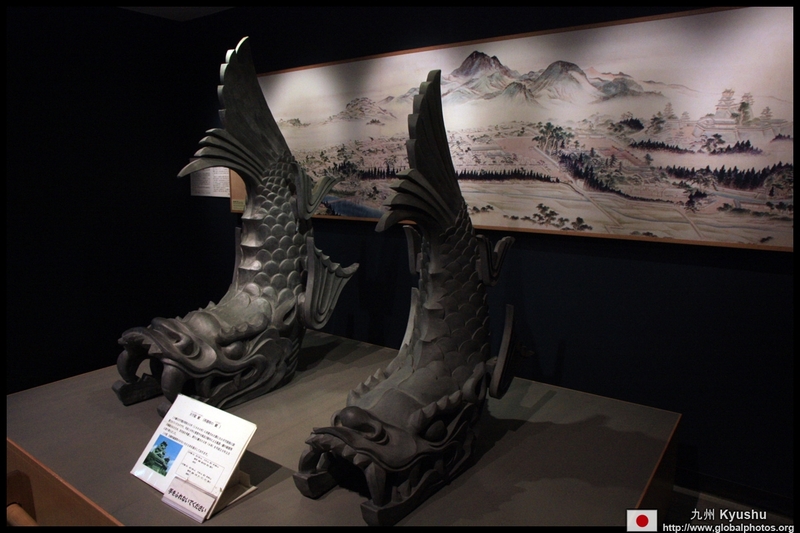 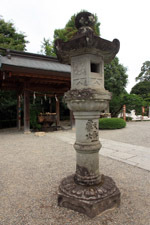 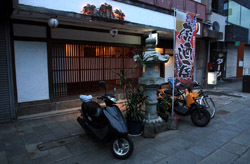 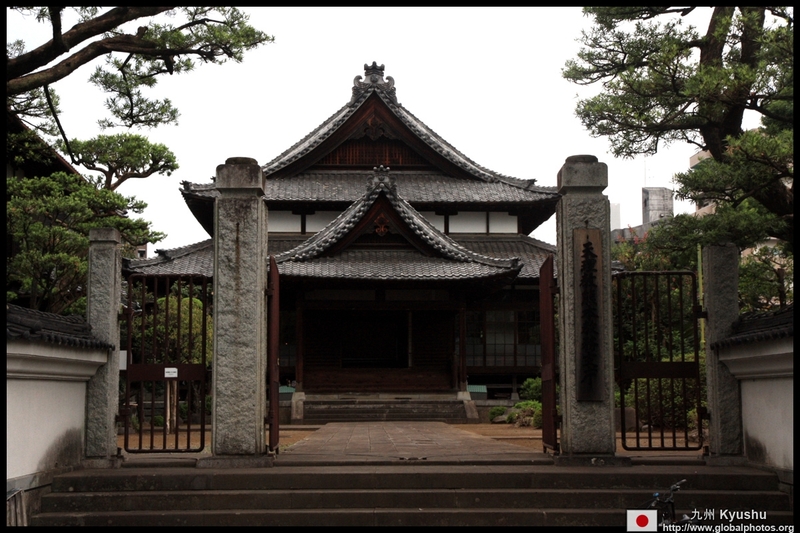 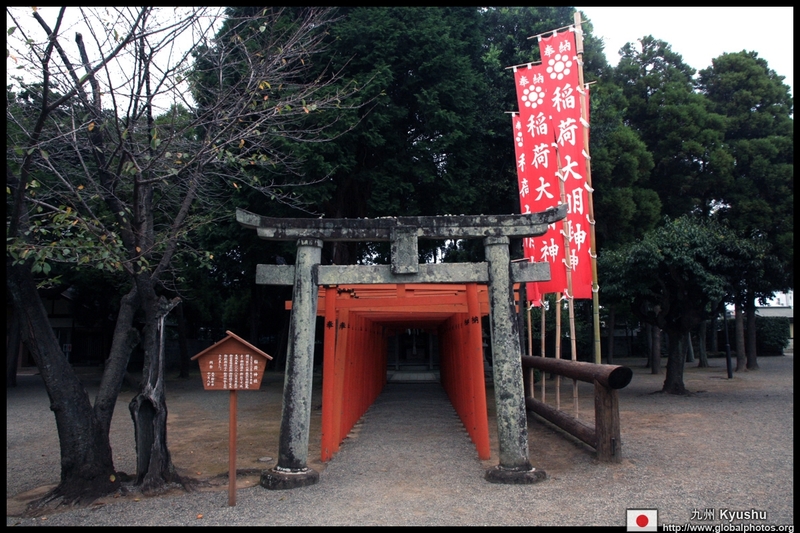 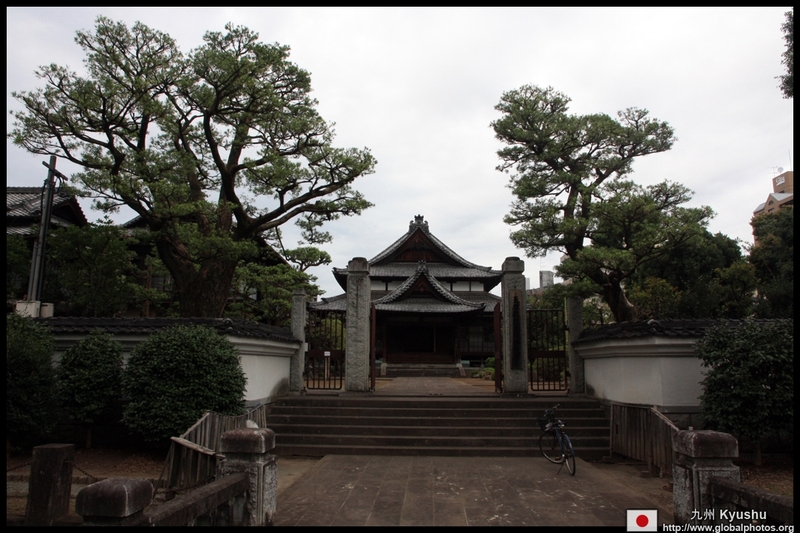 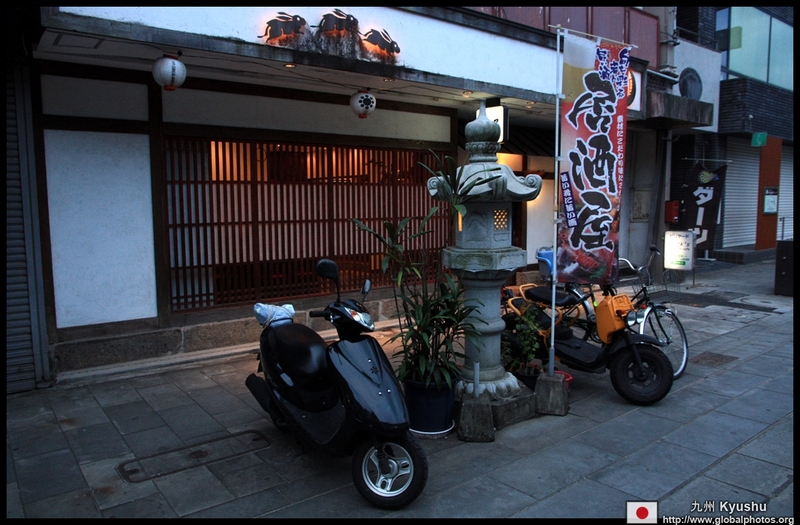 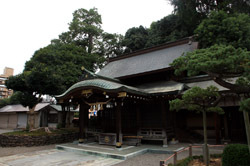 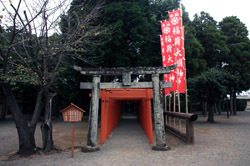 While much of it was burned down in the Satsuma Rebellion of 1877, parts have been restored in 1960 and now contain a museum. 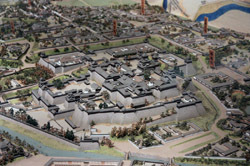 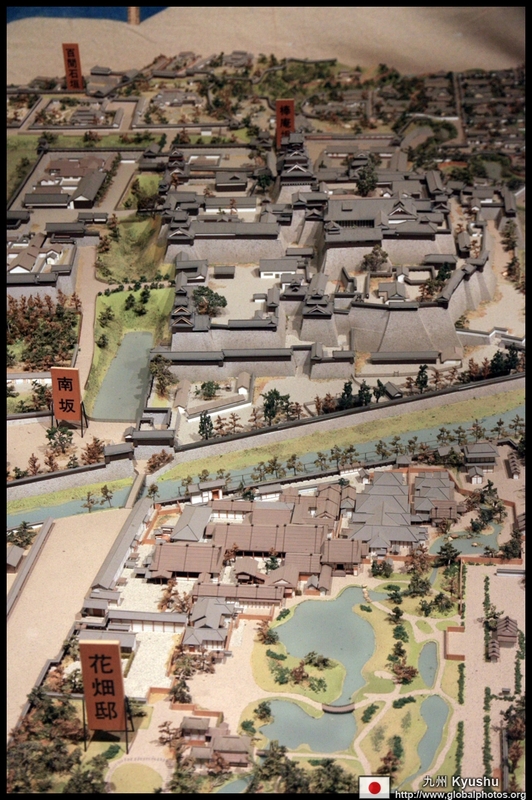 Inside, exhibits depict the old castle town and the castle's features. 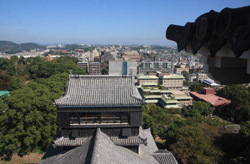 A lovely observation deck awaits at the top with views on all 4 sides. 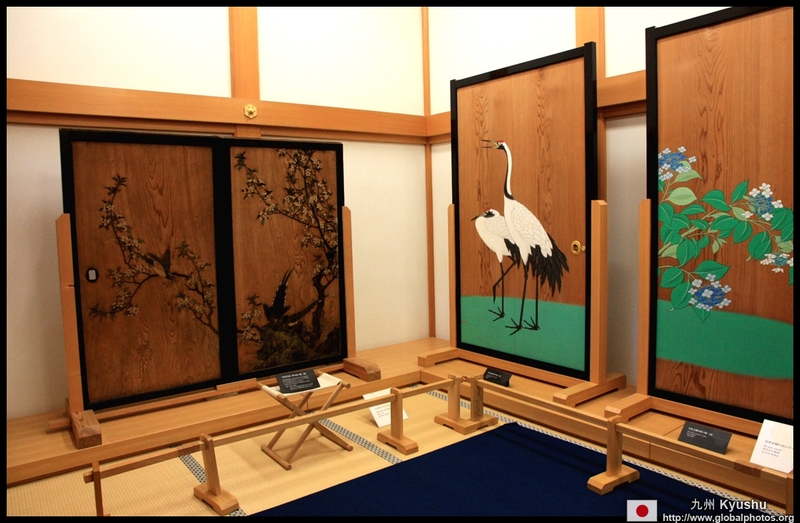 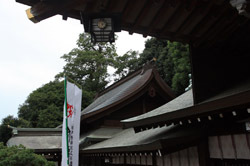 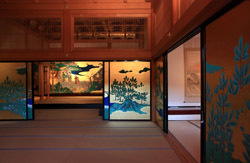 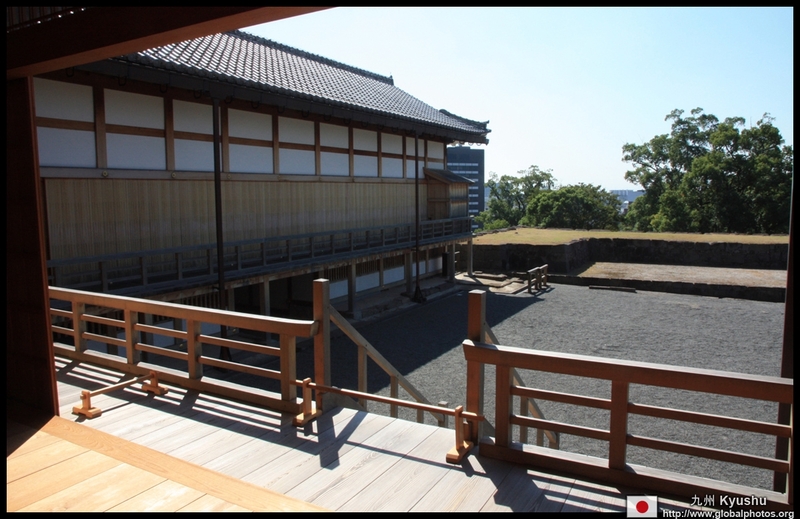 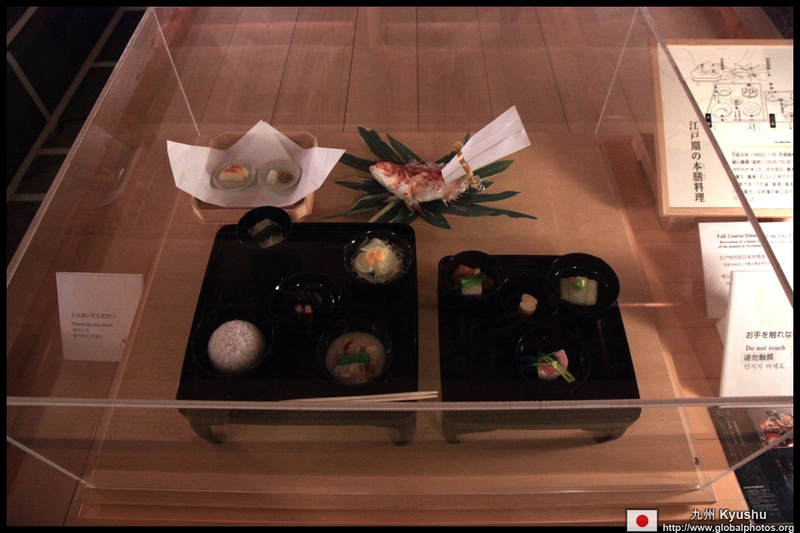 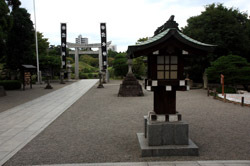 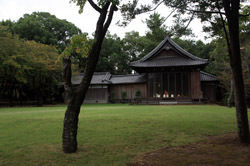 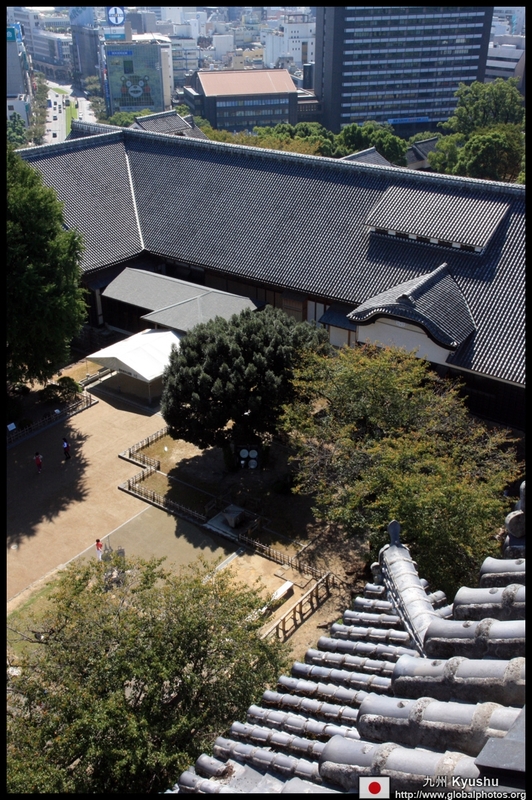 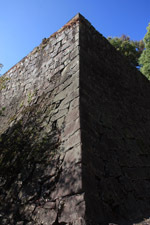 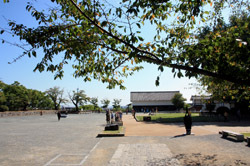 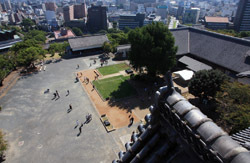 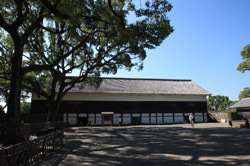 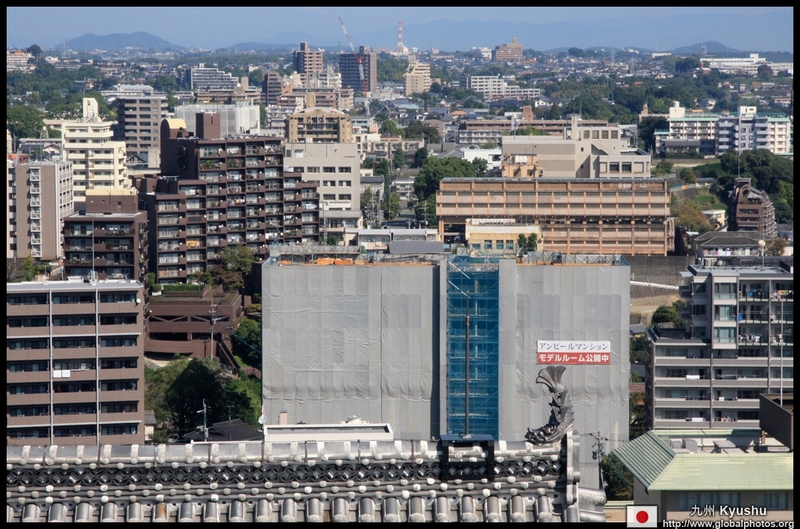 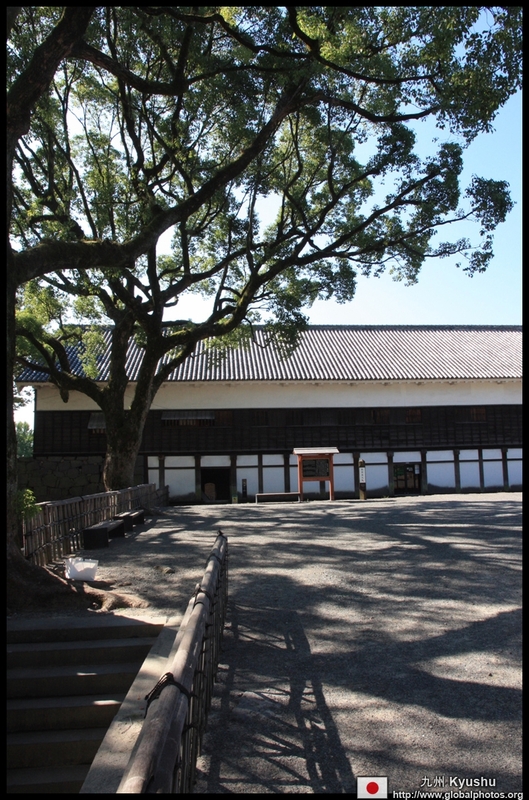 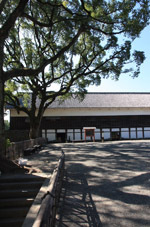 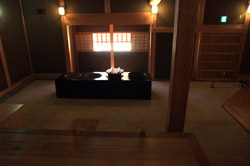 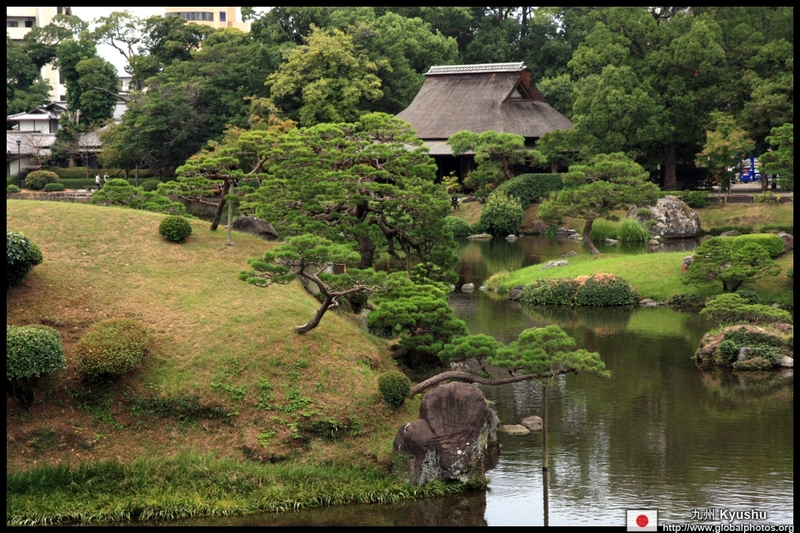 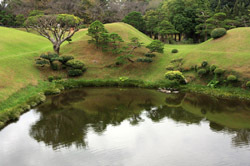 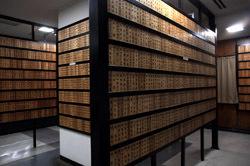 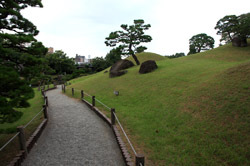 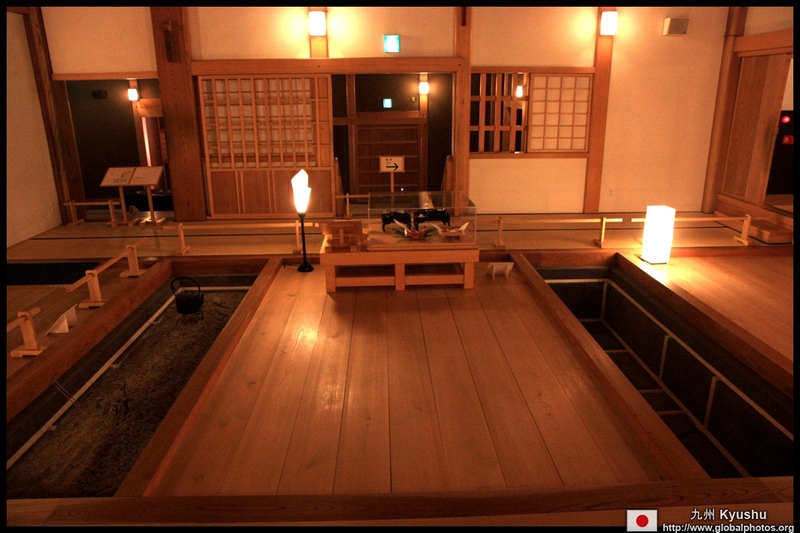 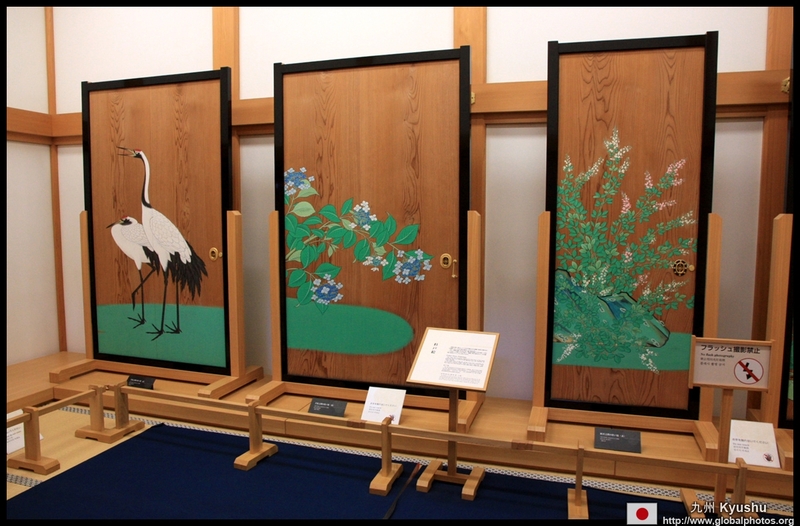 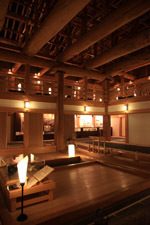 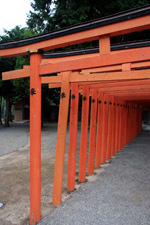 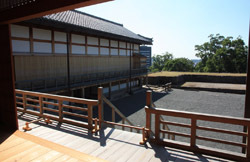 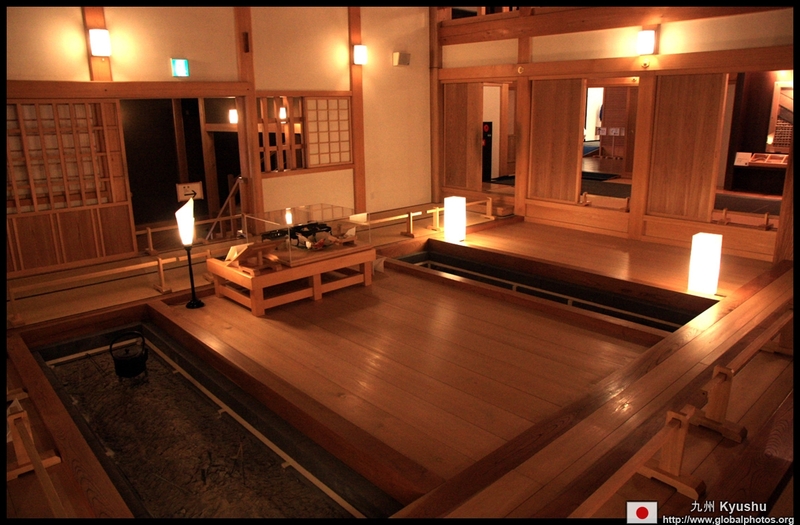 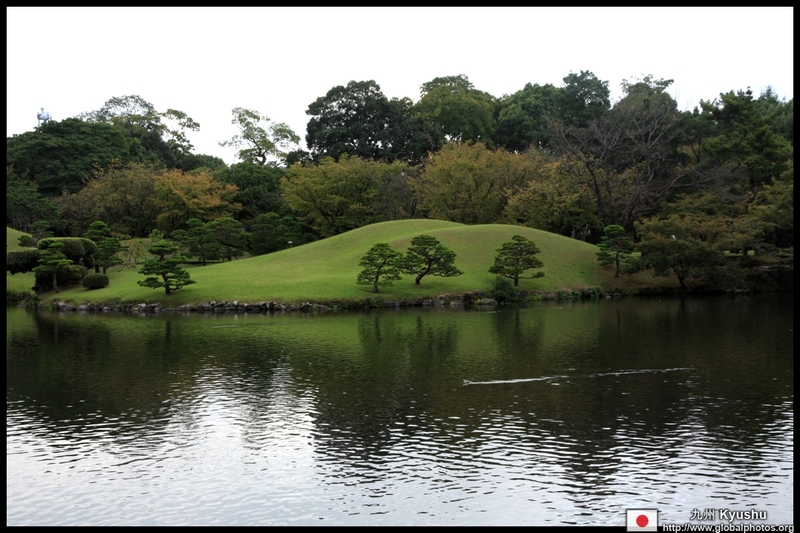 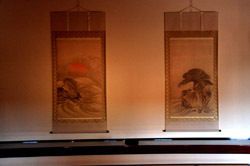 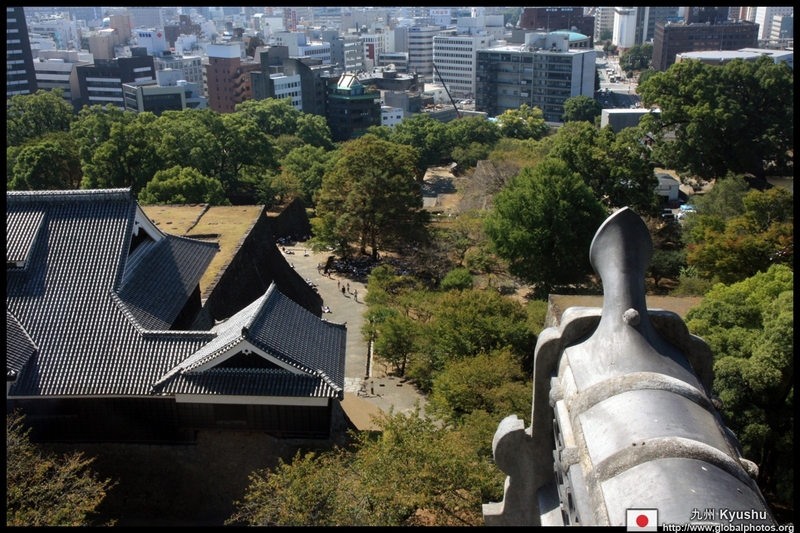 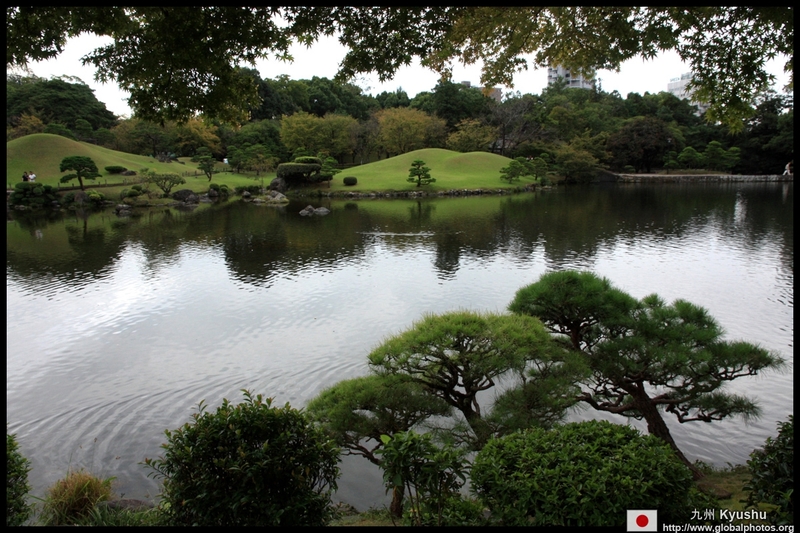 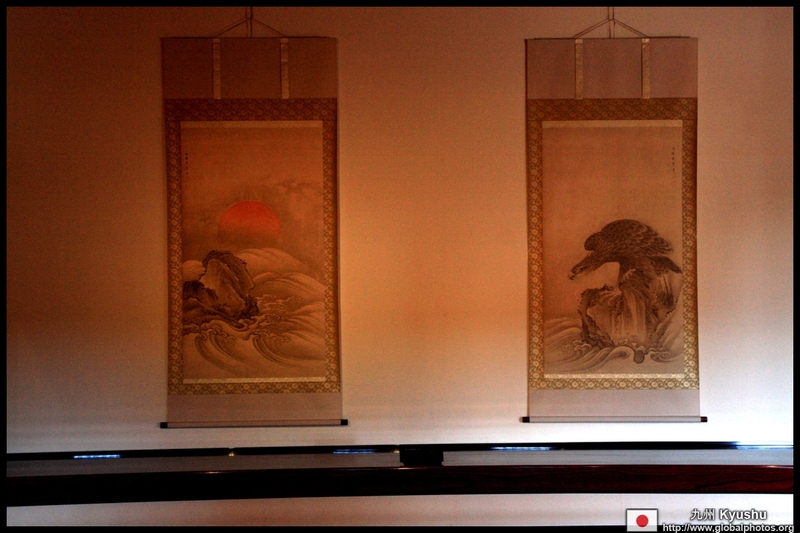 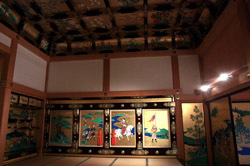 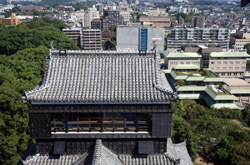 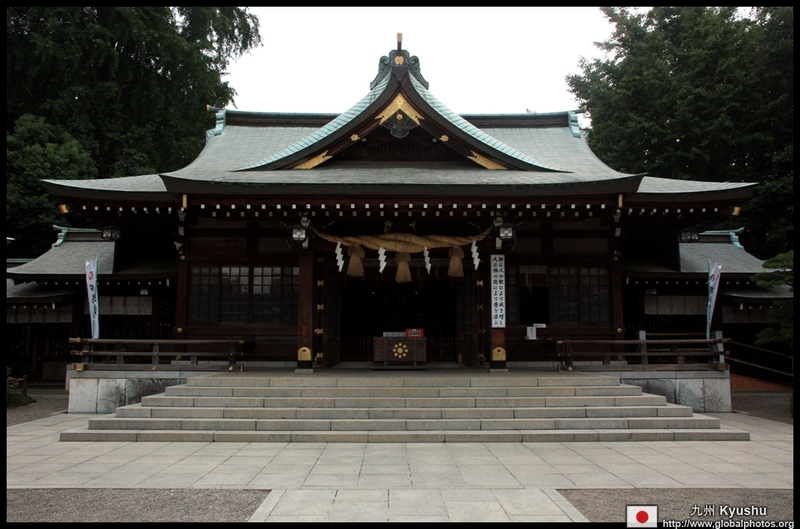 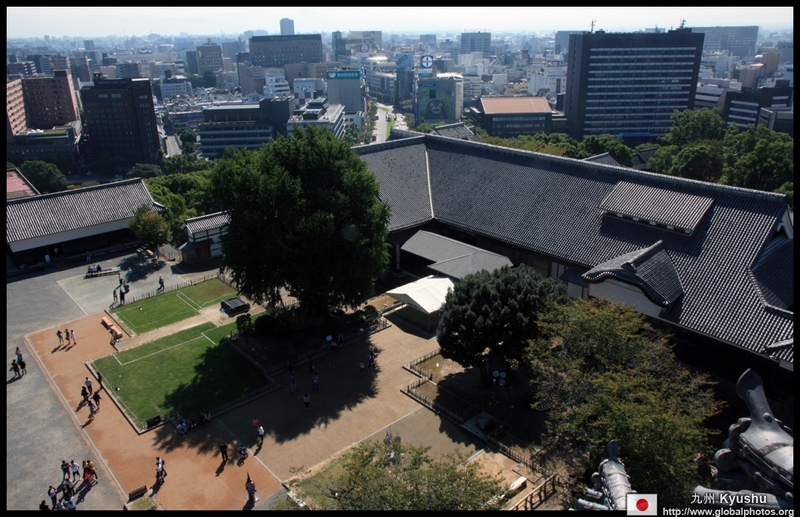 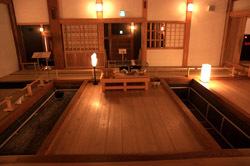 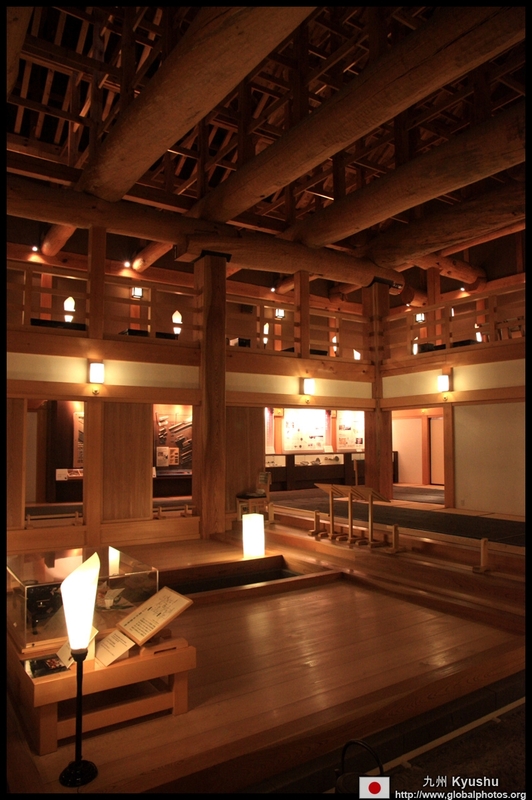 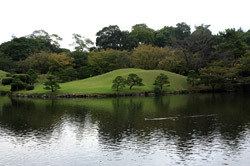 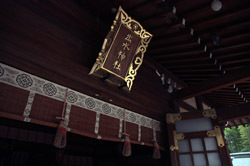 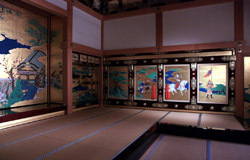 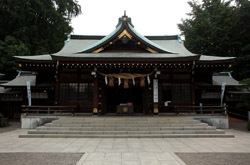 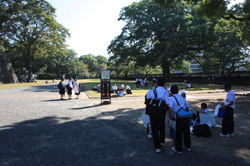 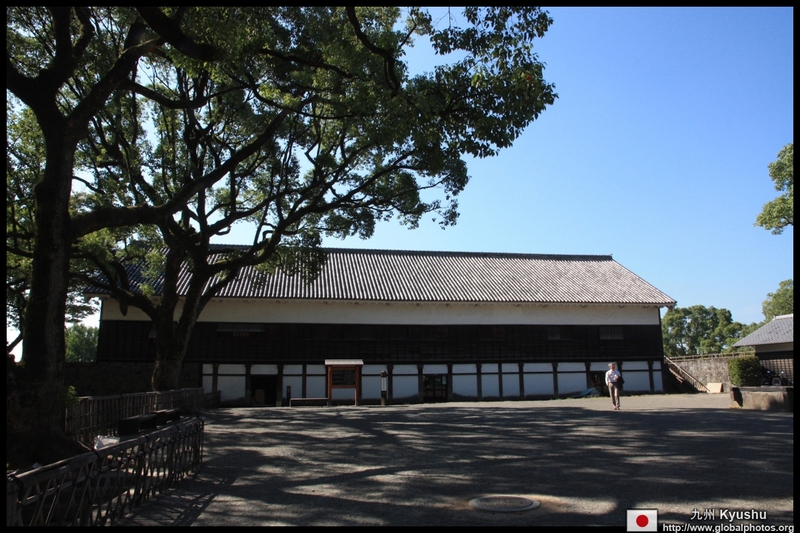 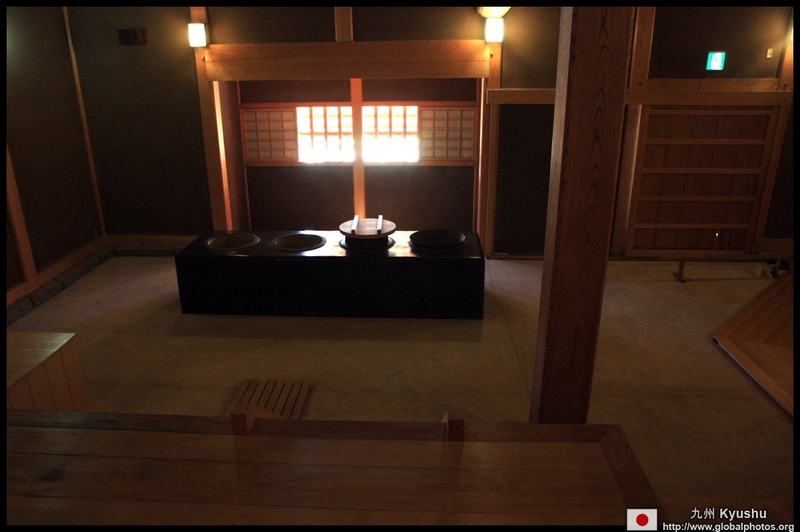 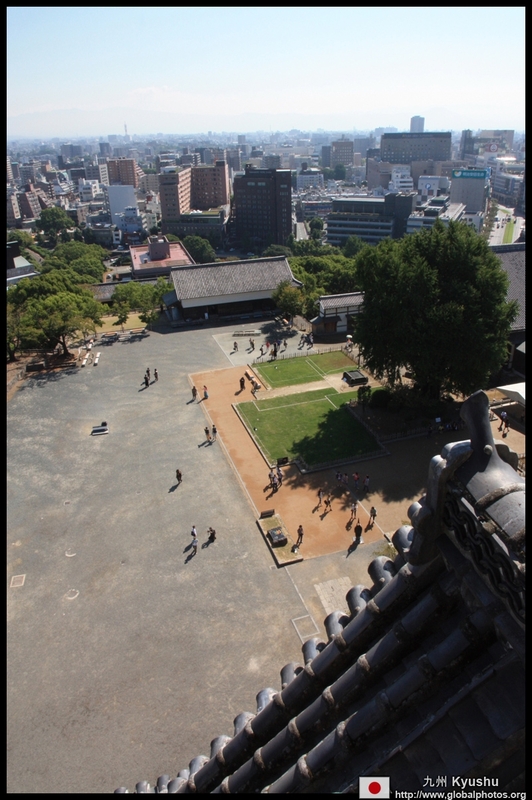 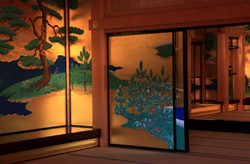 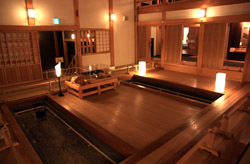 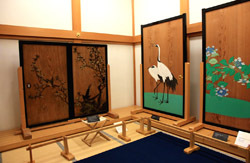 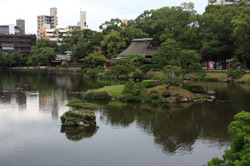 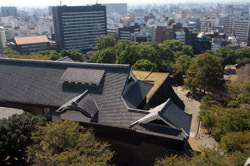 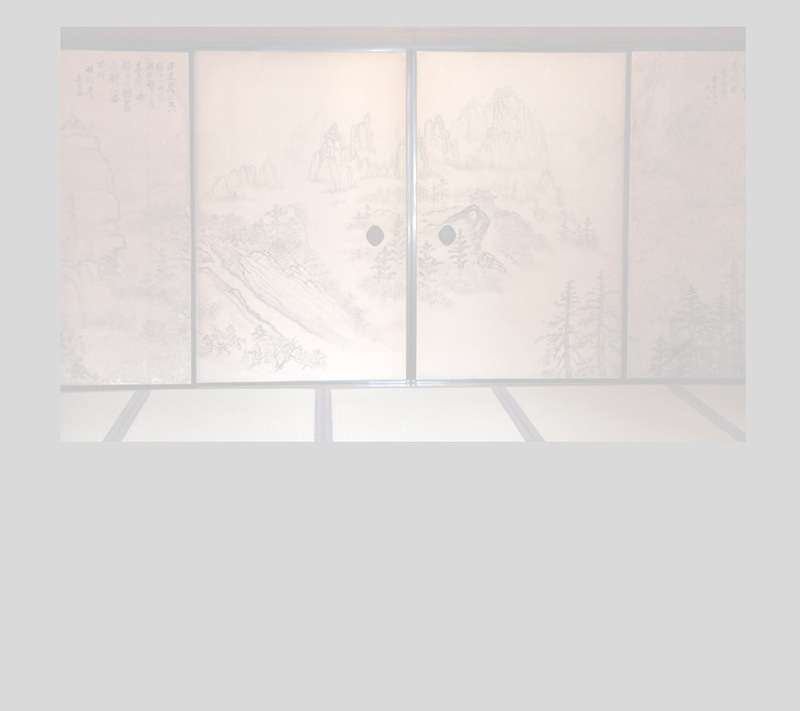 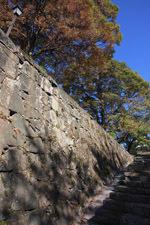 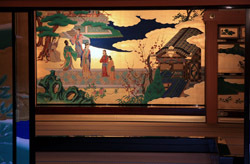 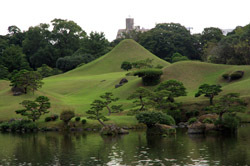 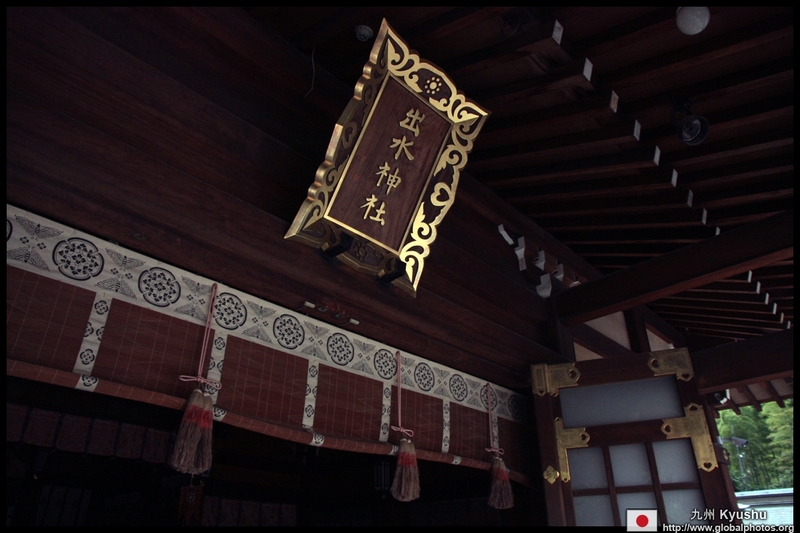 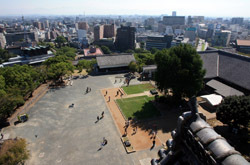 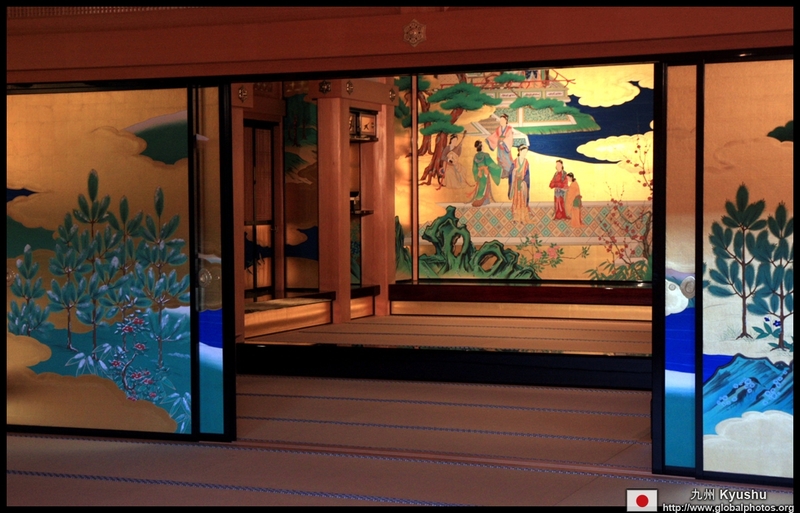 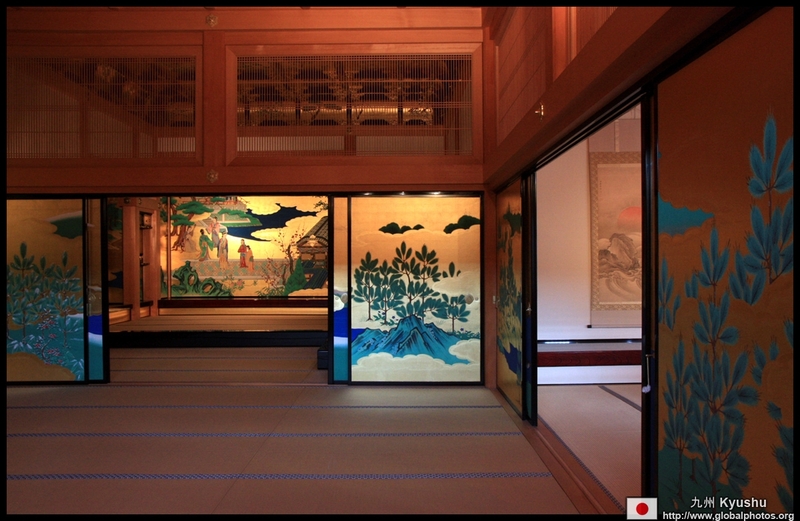 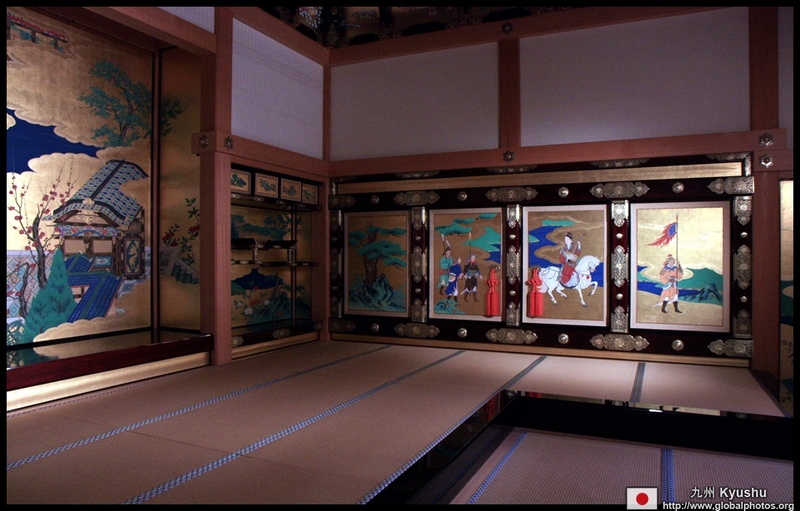 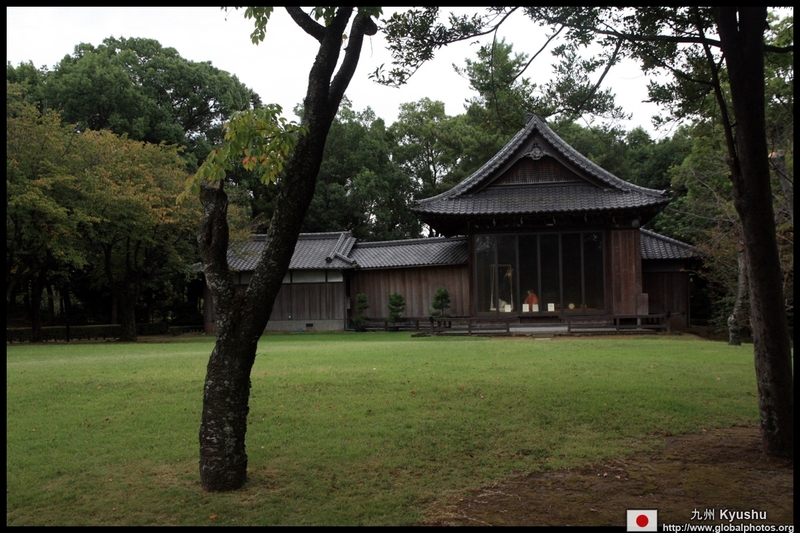 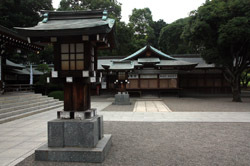 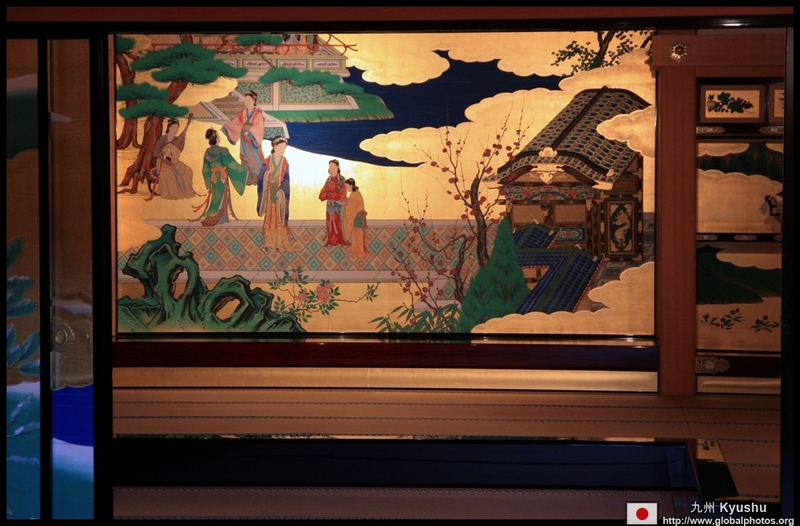 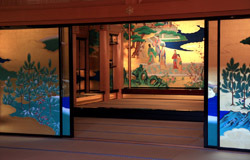 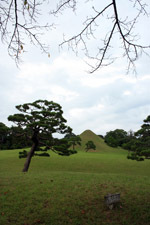 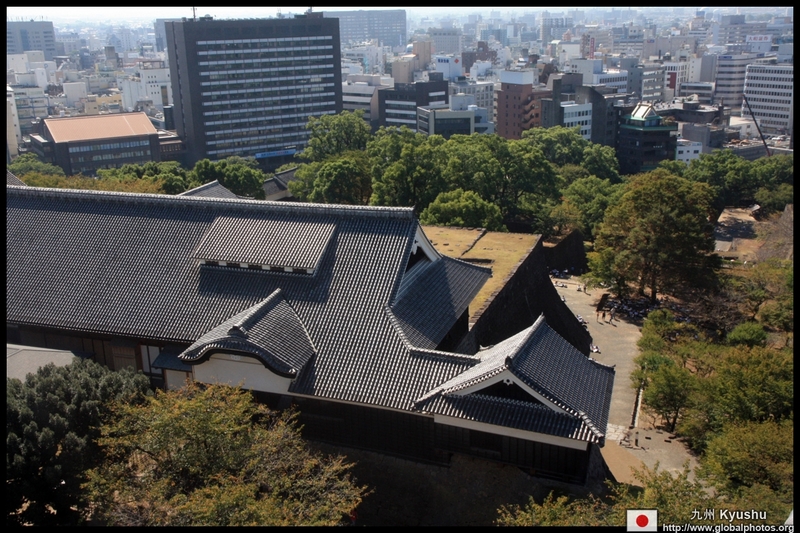 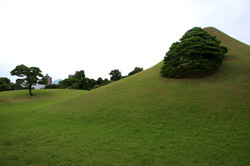 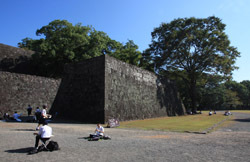 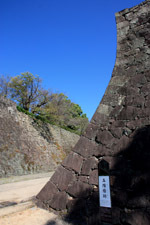 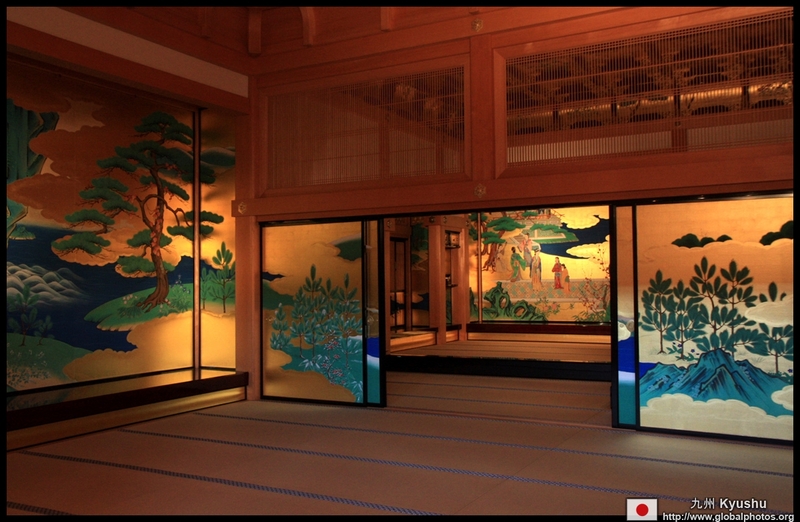 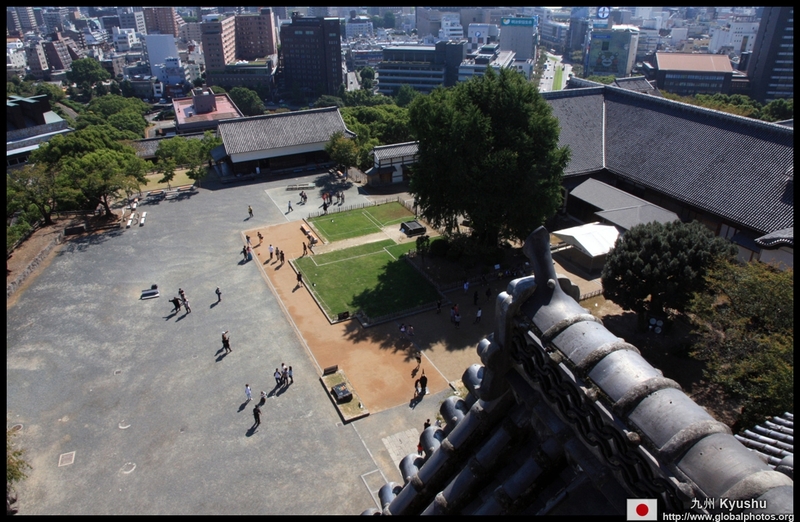 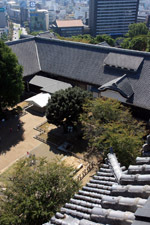 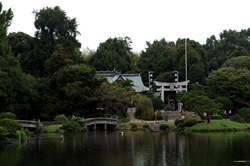 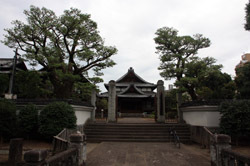 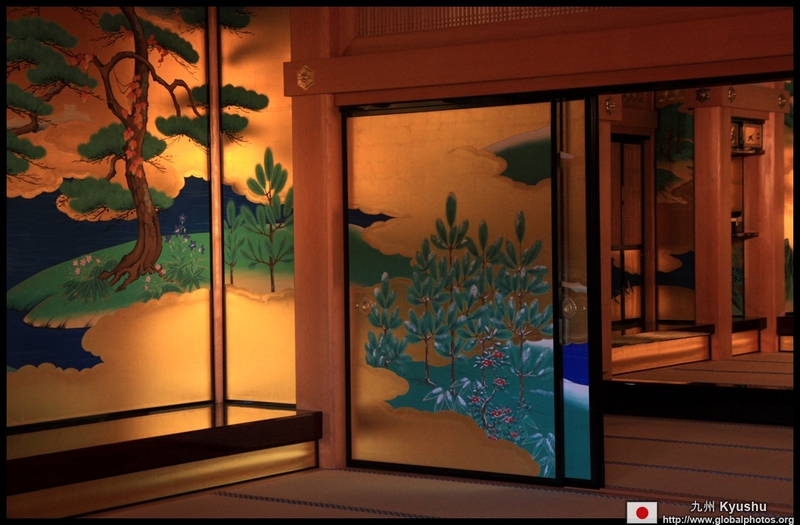 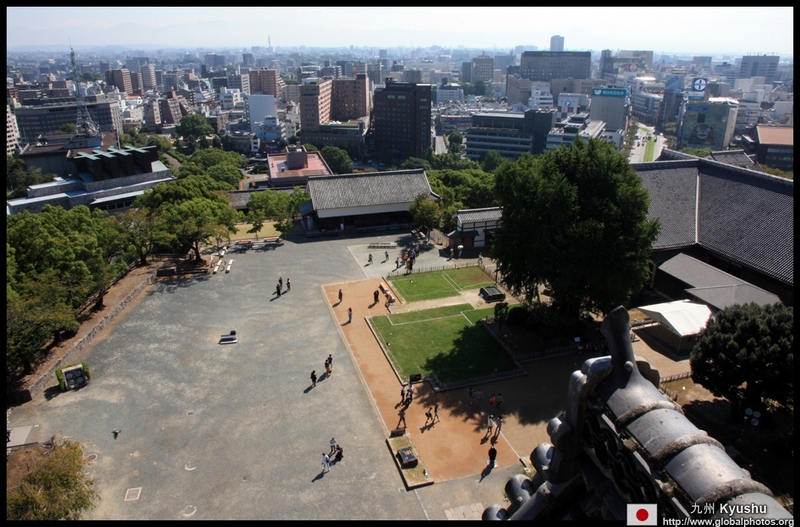 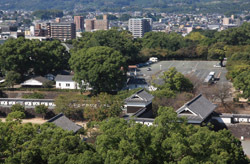 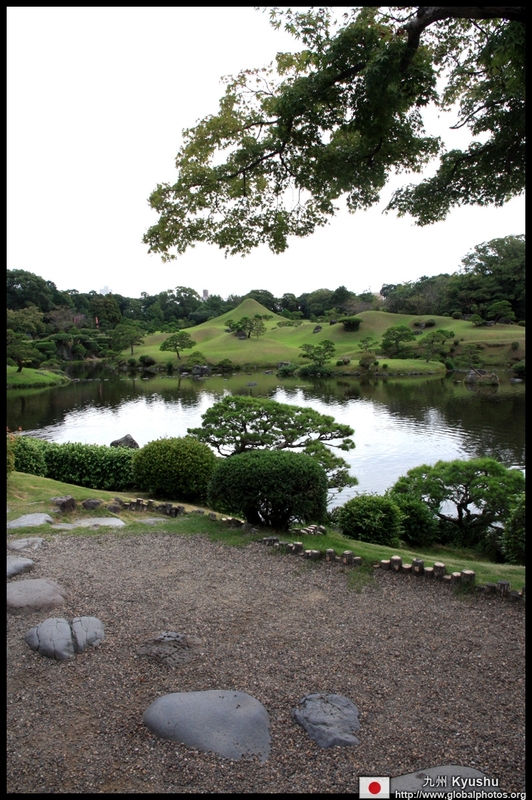 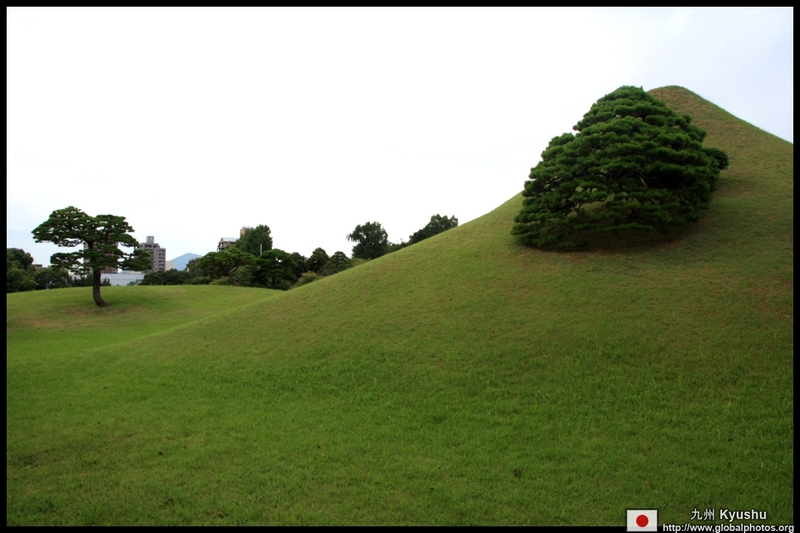 The lord's inner palace, the Honmaru Goten Palace, was reconstructed in 2007. 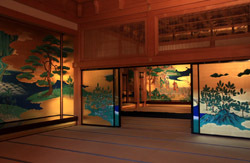 Visitors need to remove their shoes to explore its sparkling new rooms. 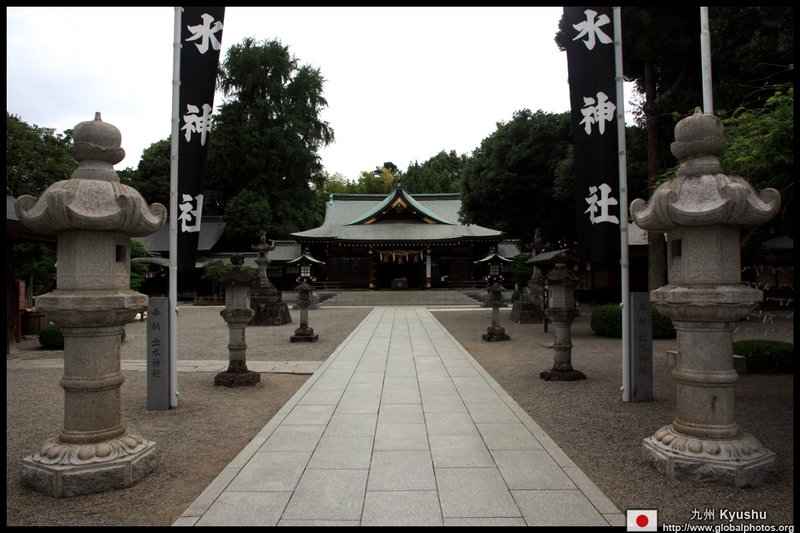 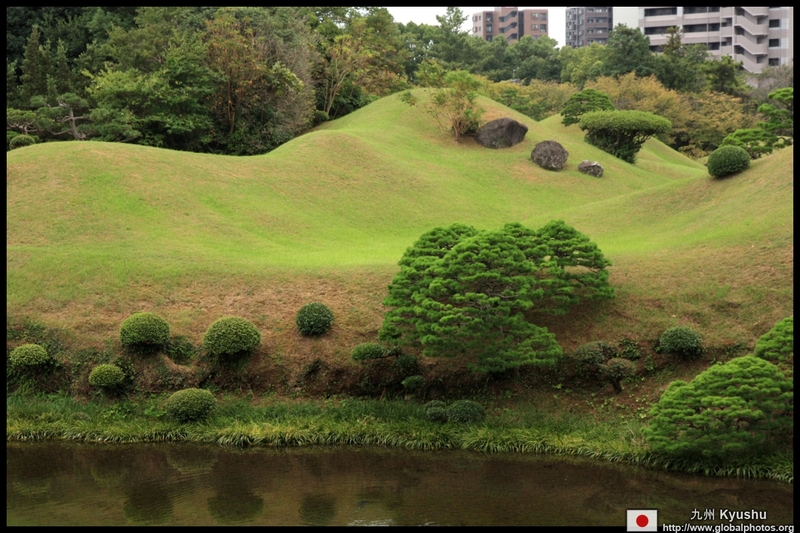 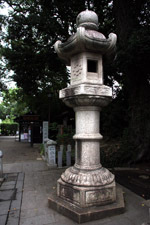 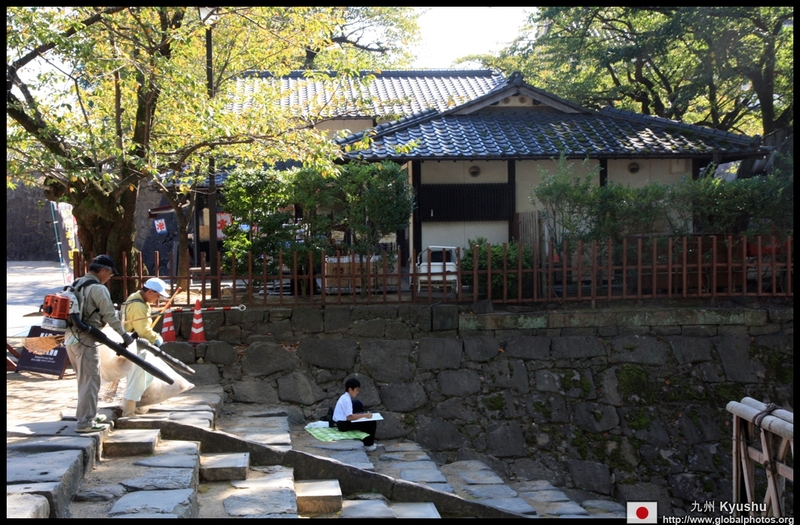 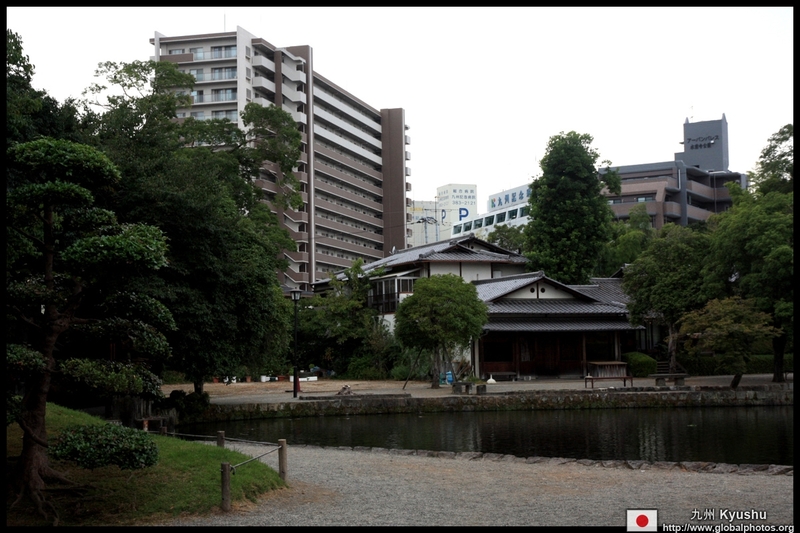 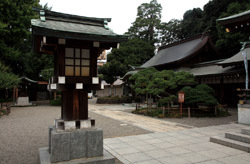 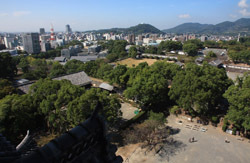 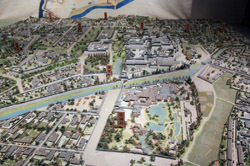 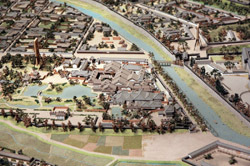 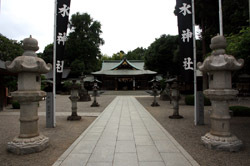 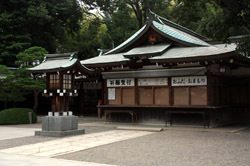 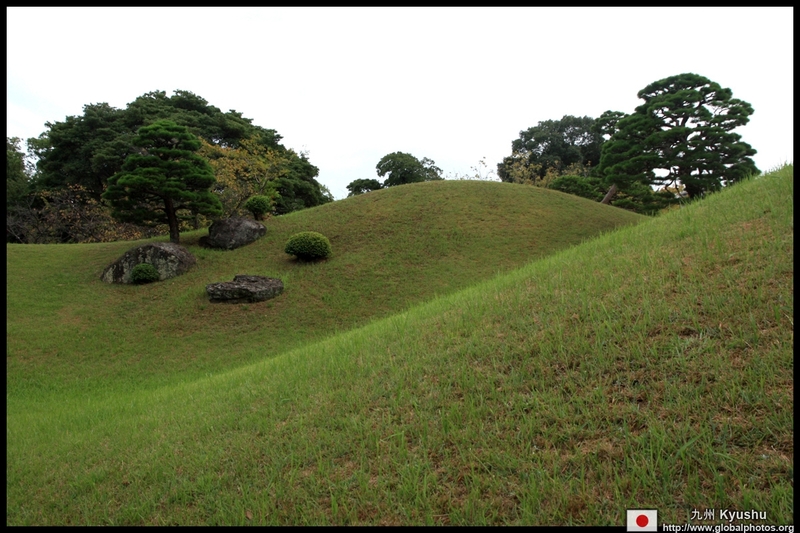 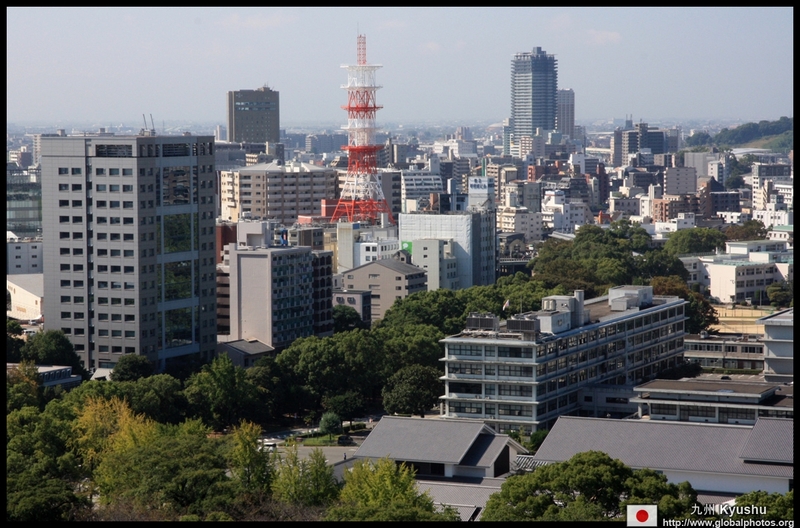 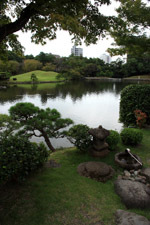 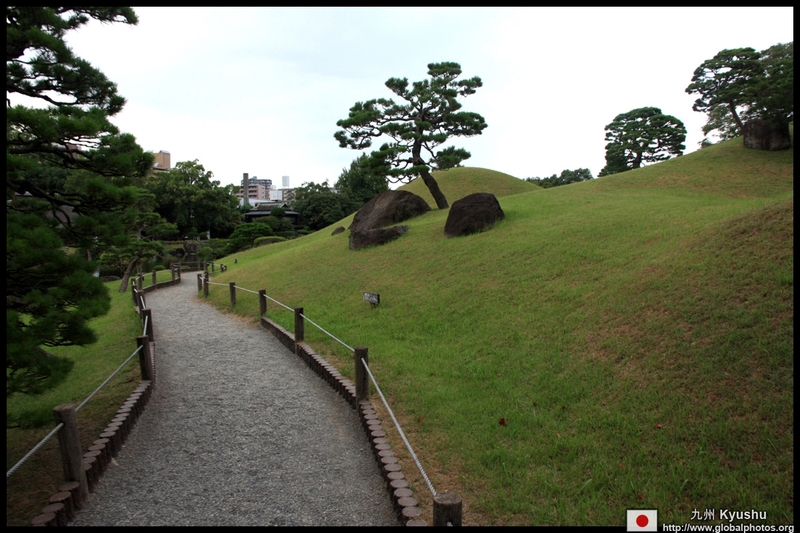 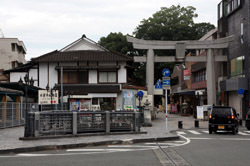 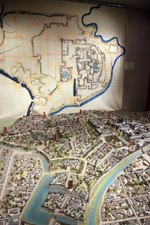 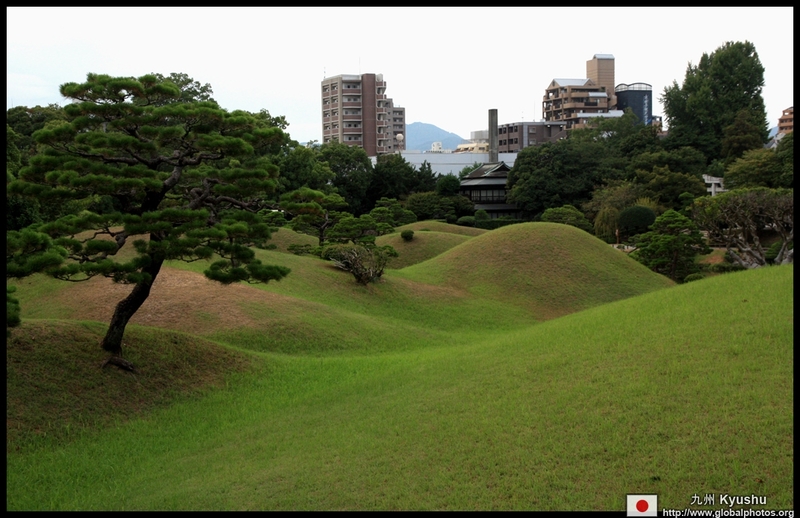 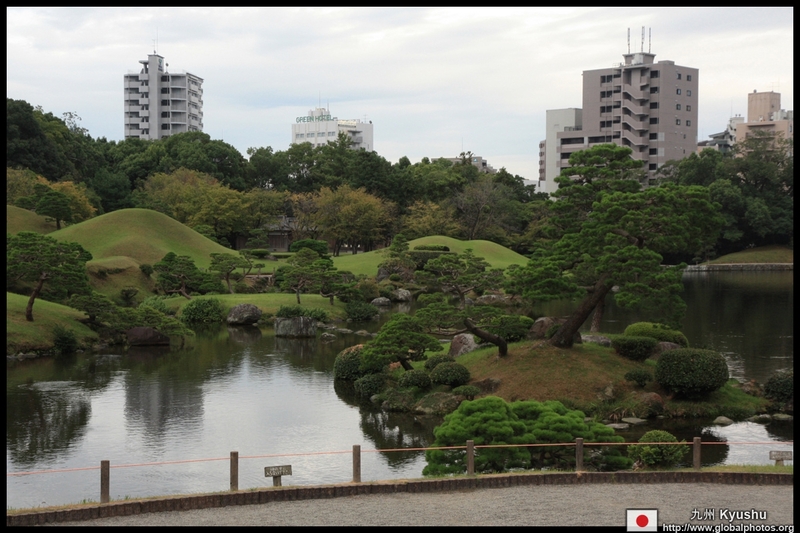 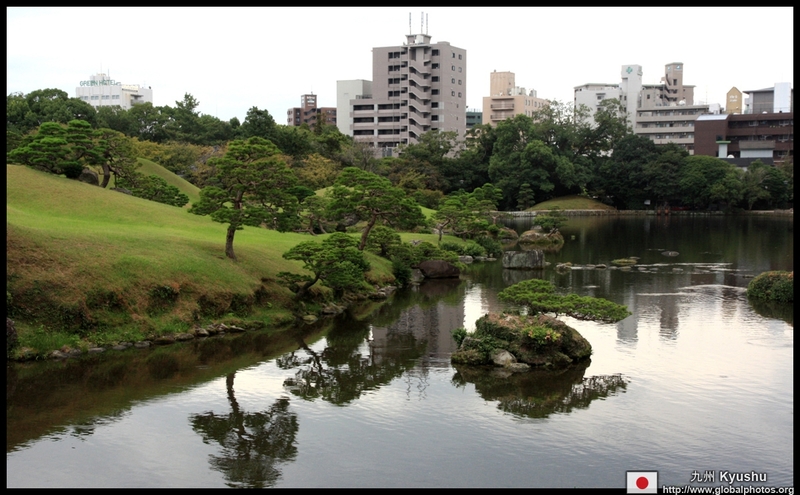 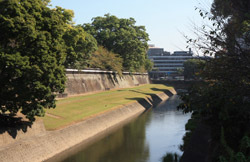 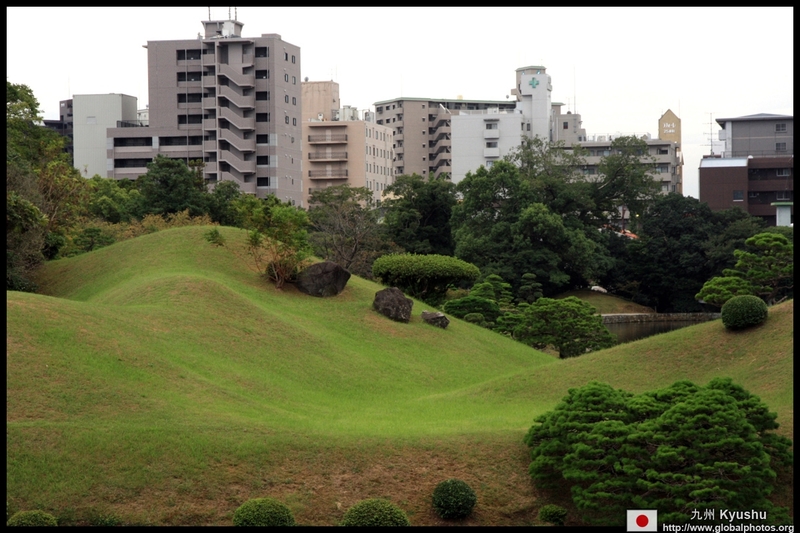 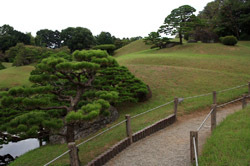 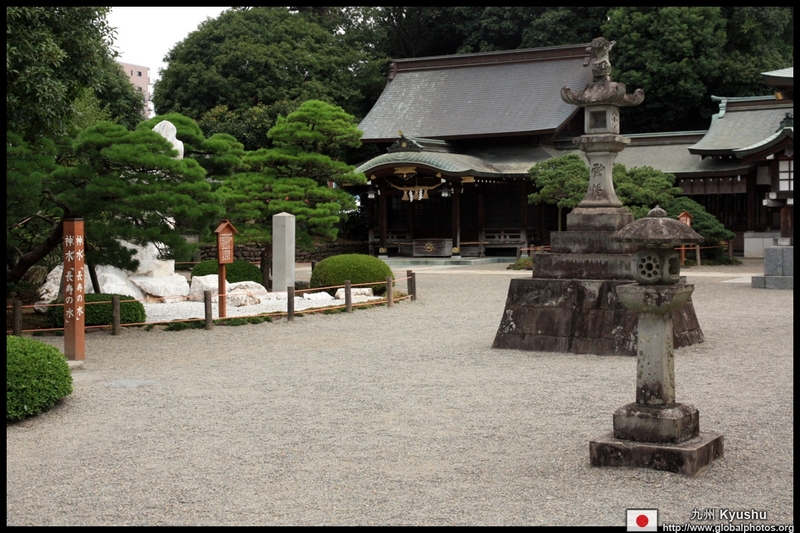 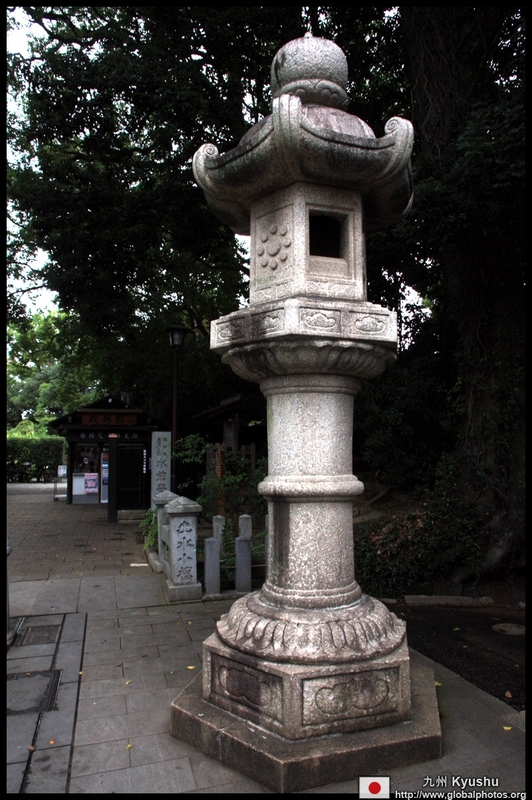 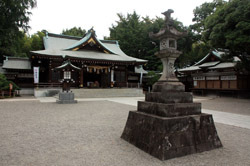 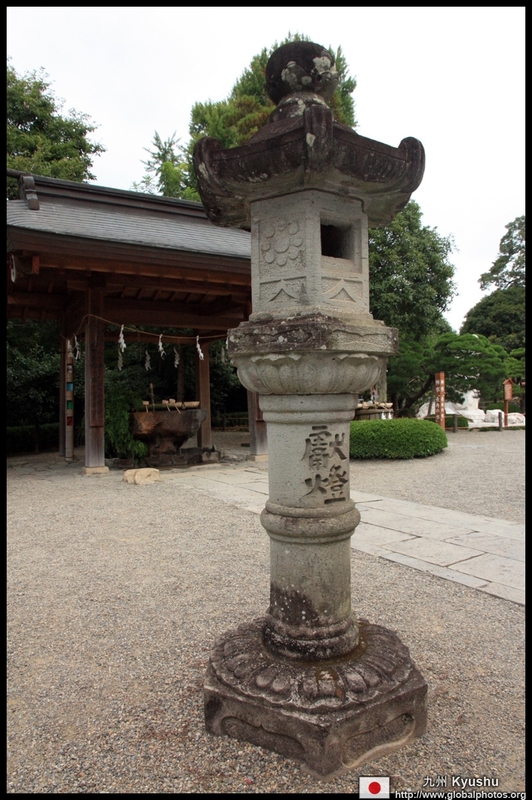 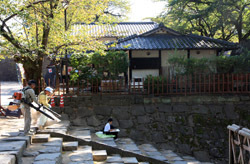 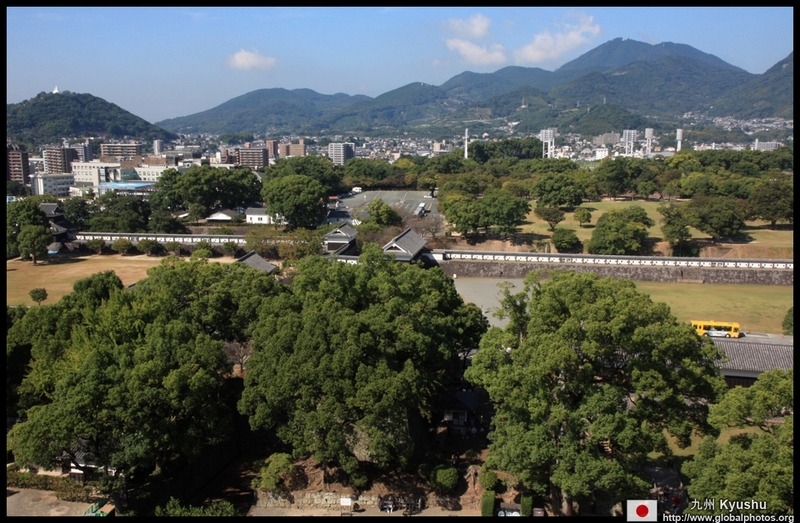 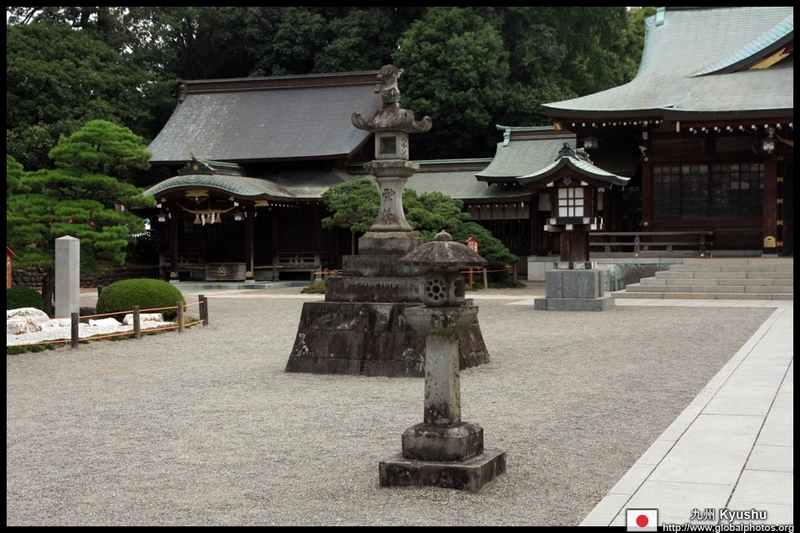 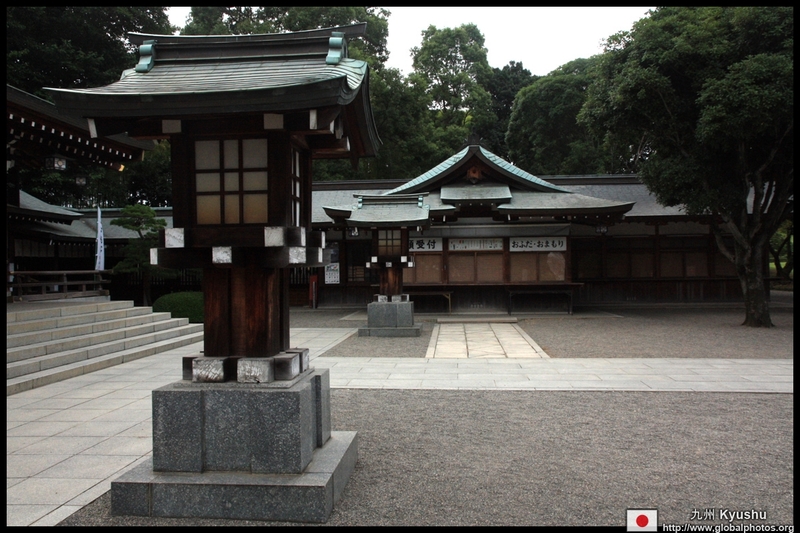 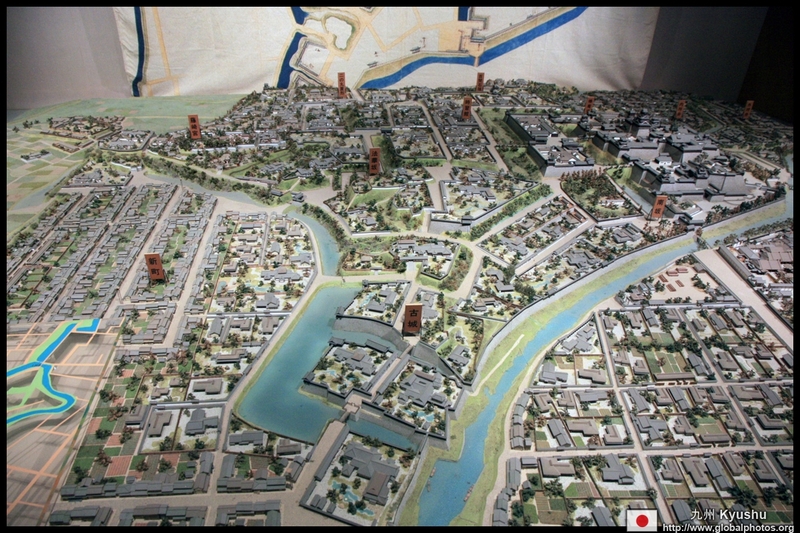 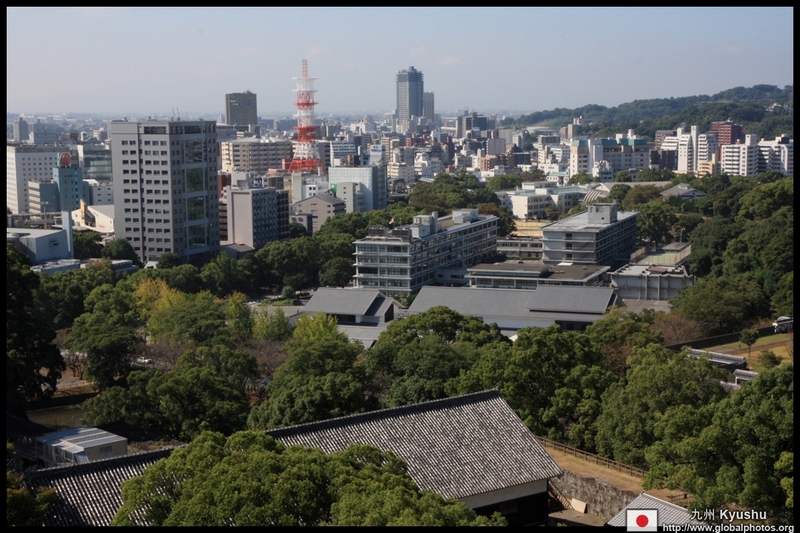 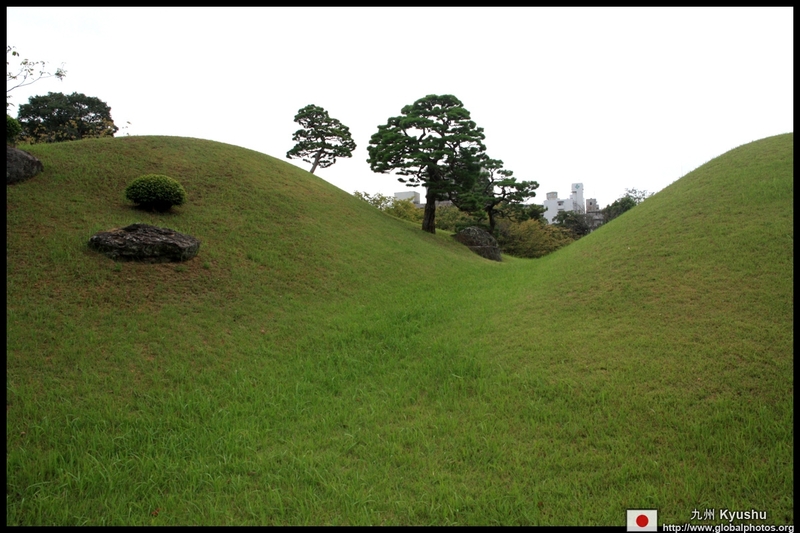 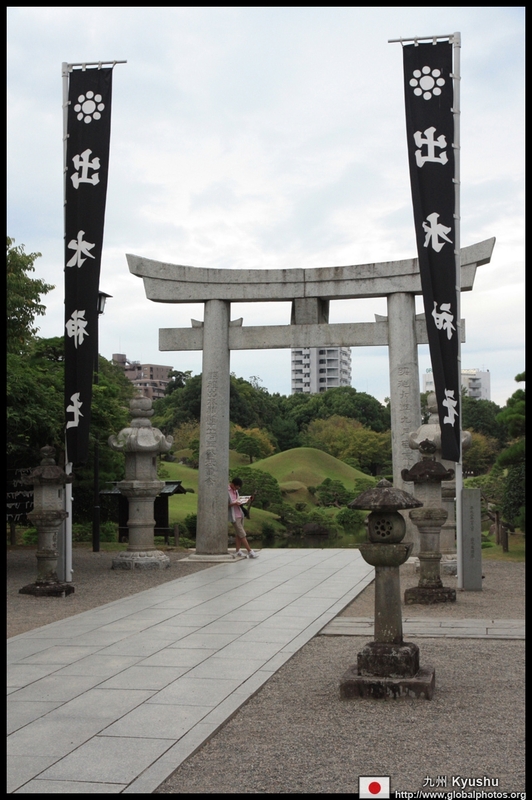 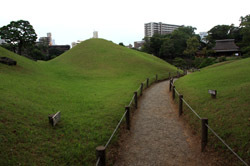 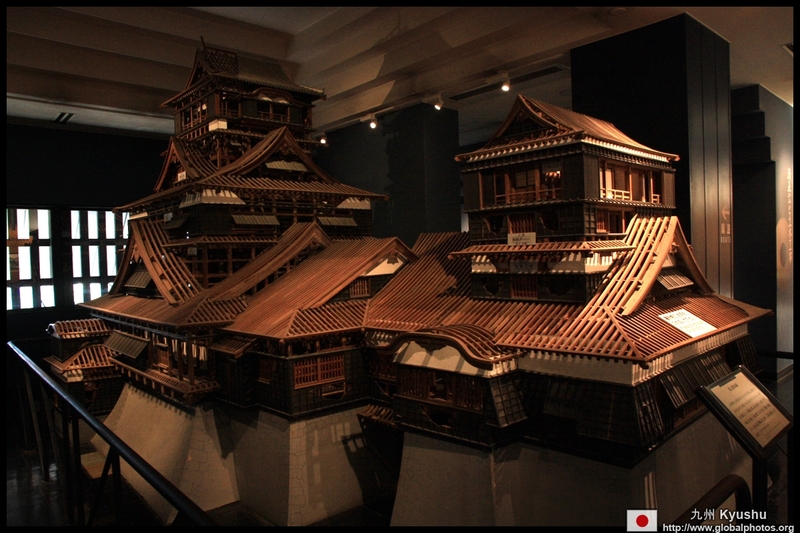 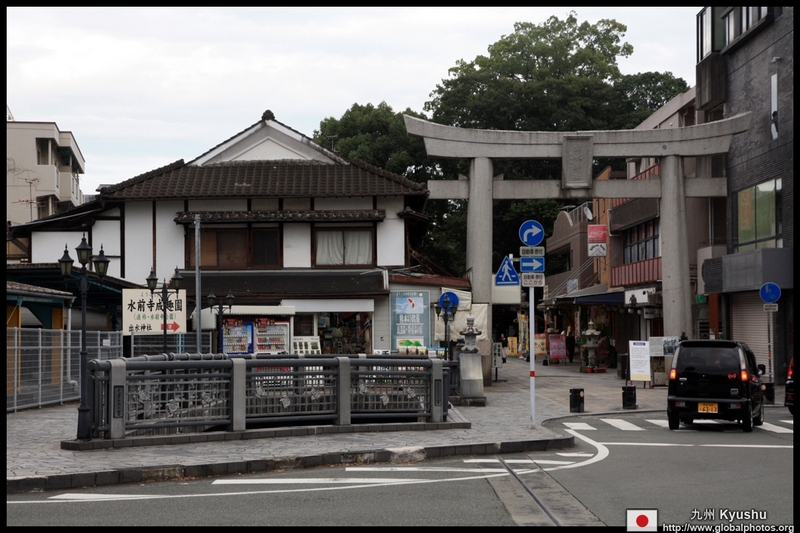 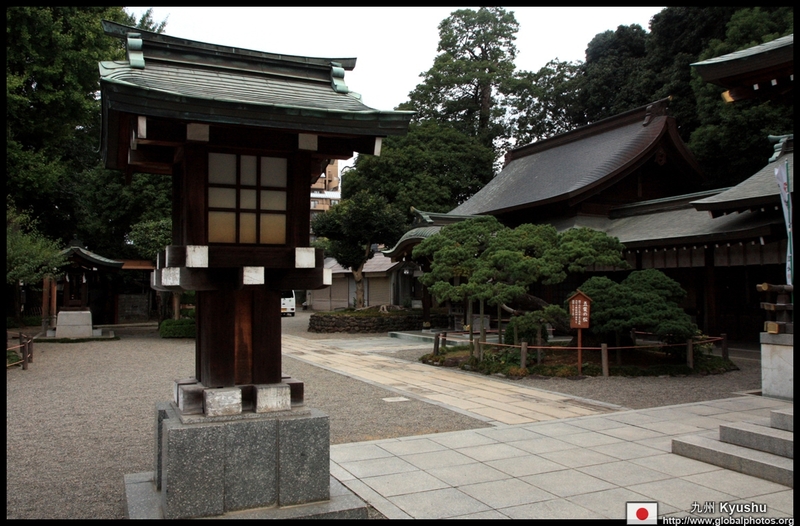 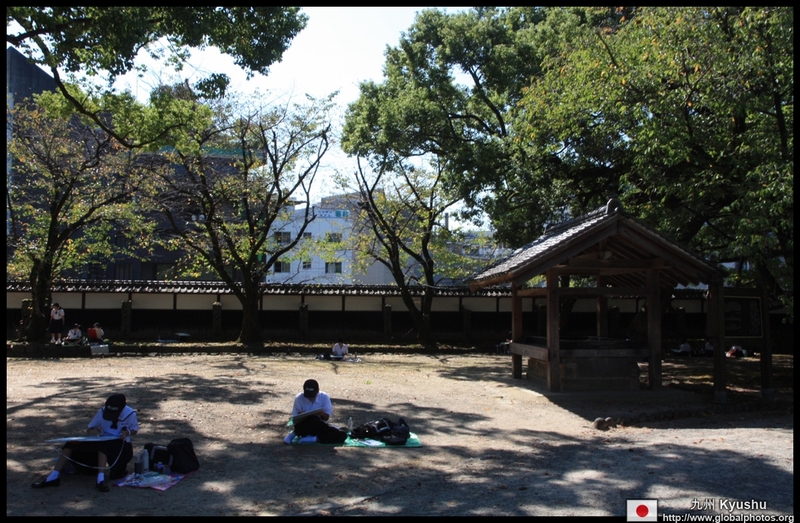 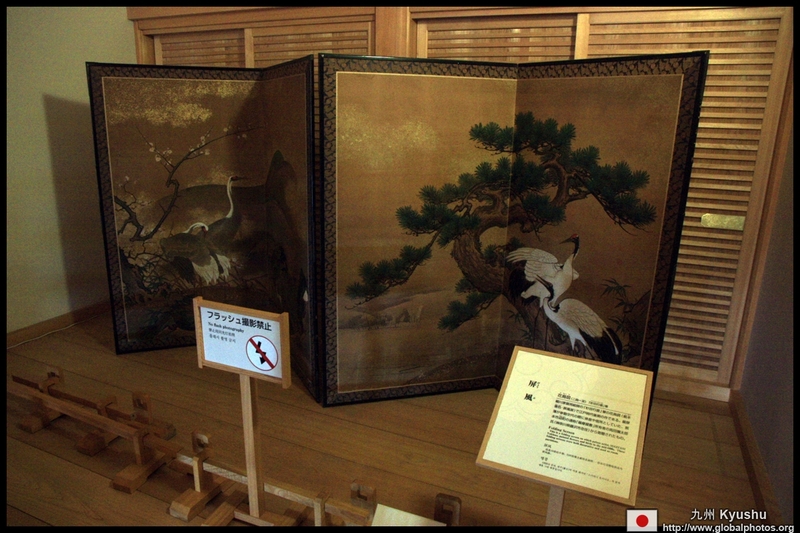 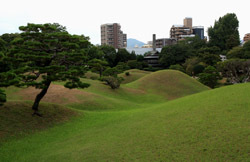 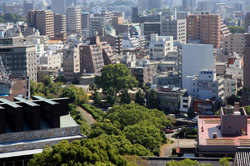 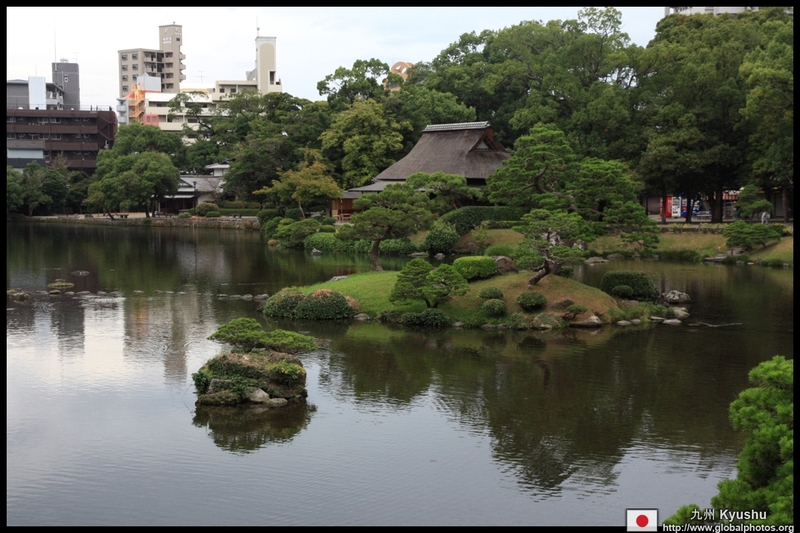 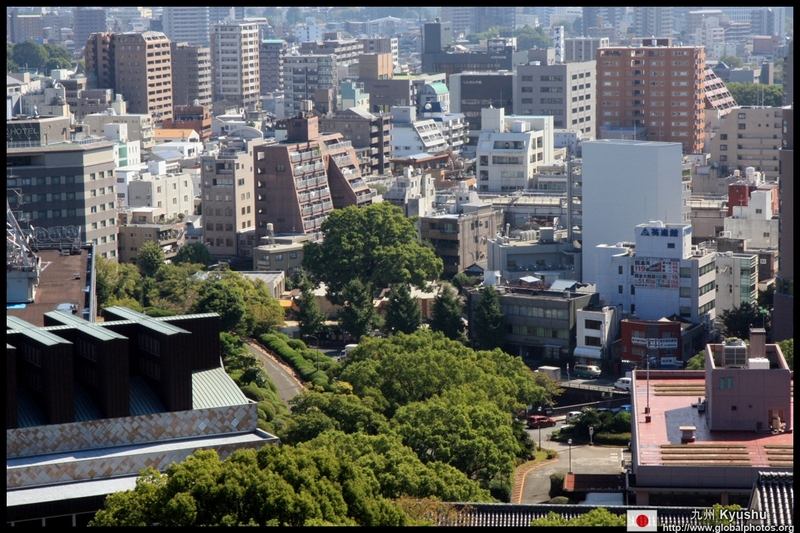 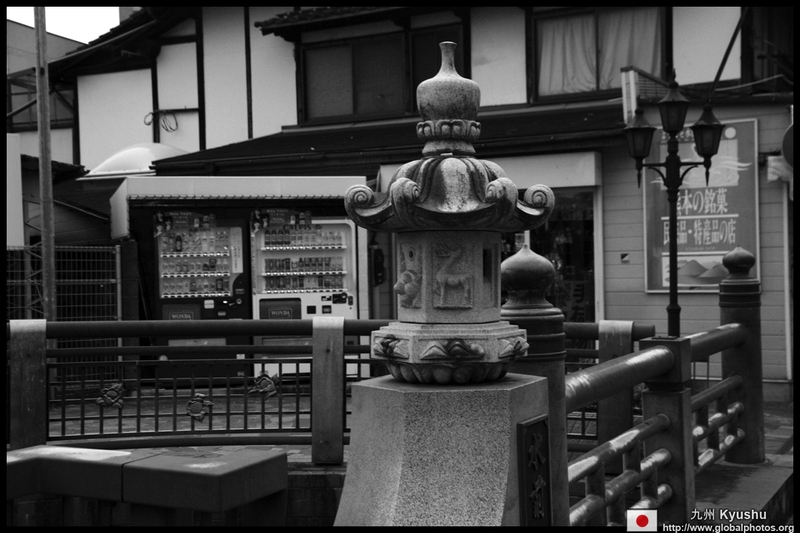 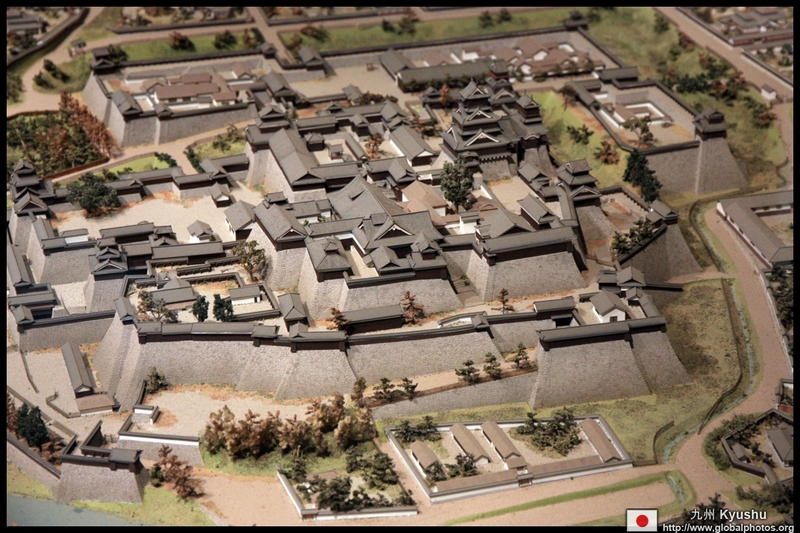 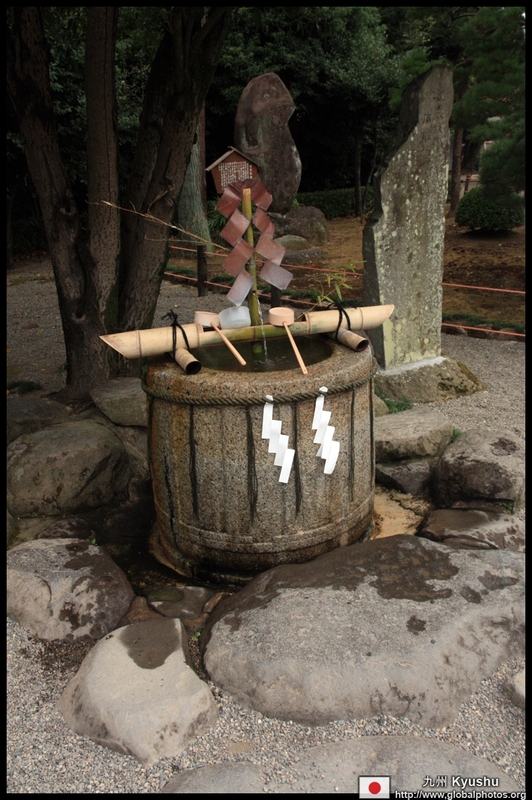 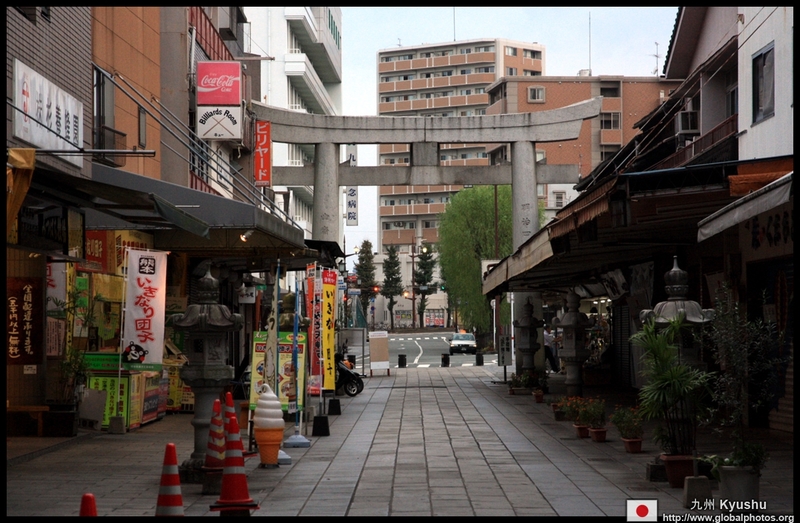 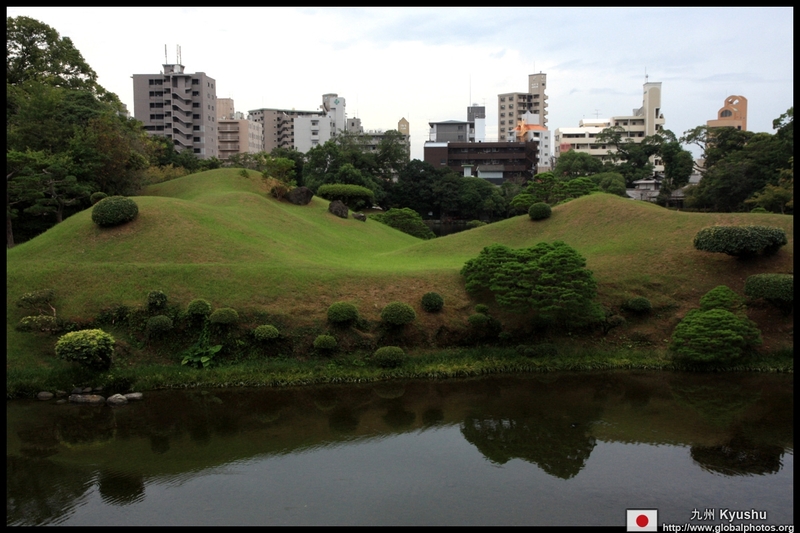 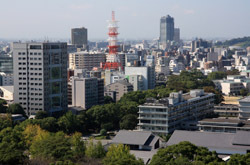 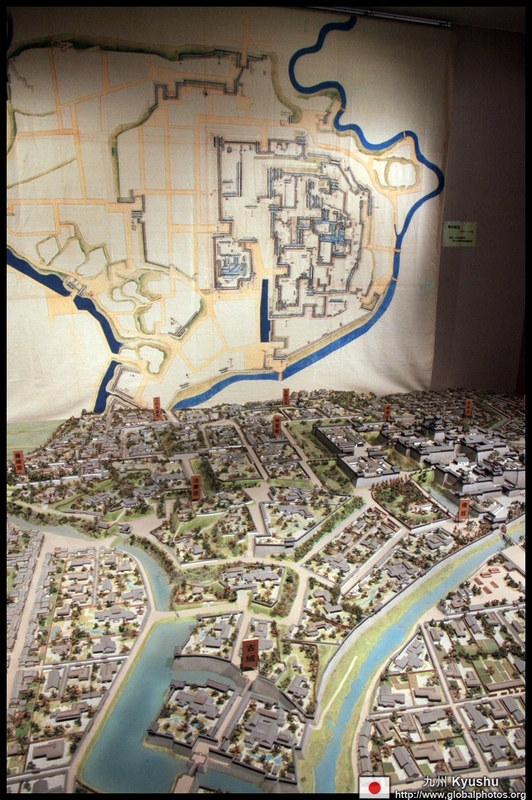 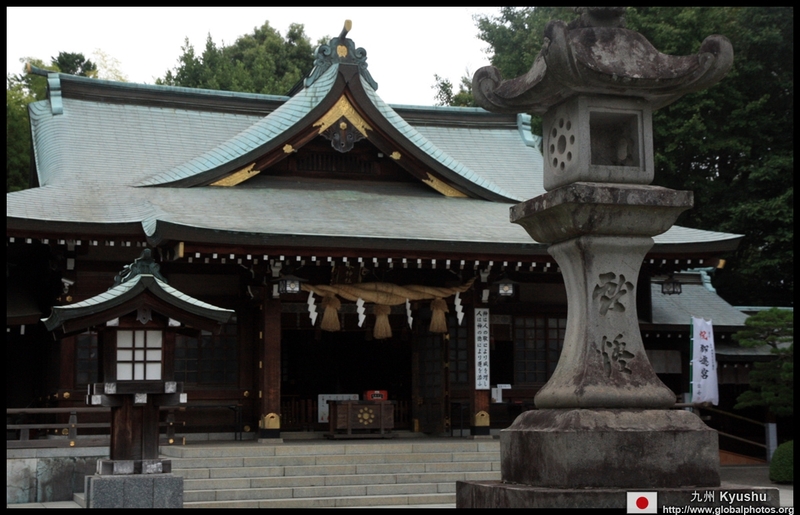 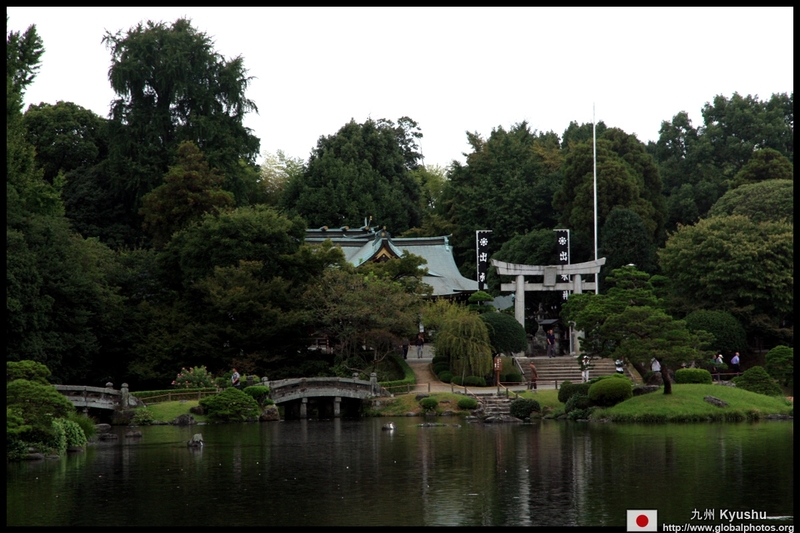 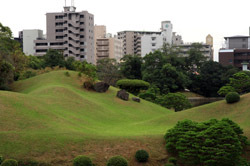 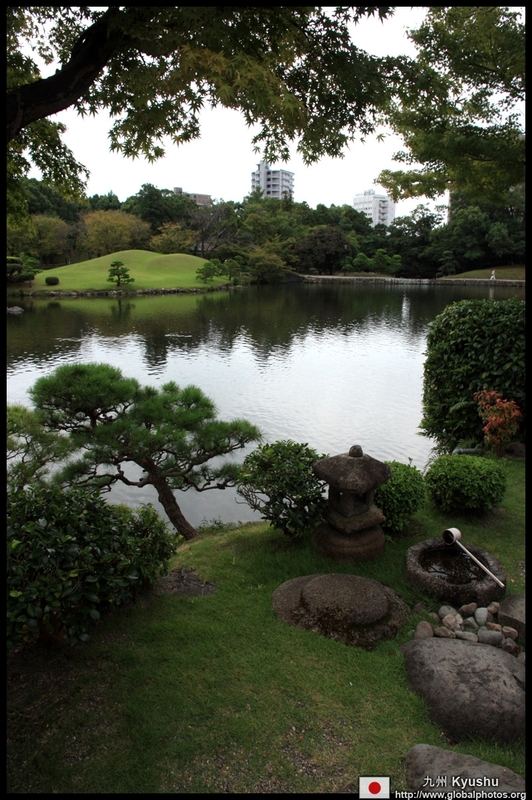 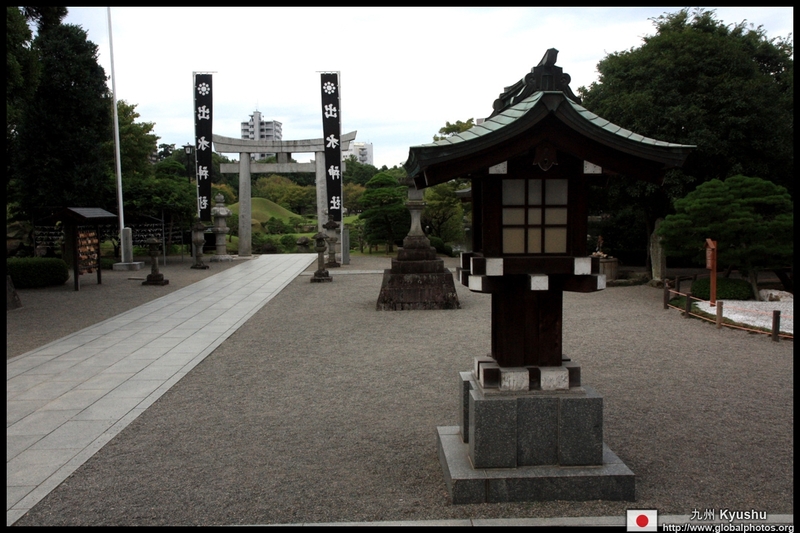 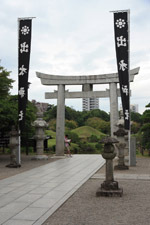 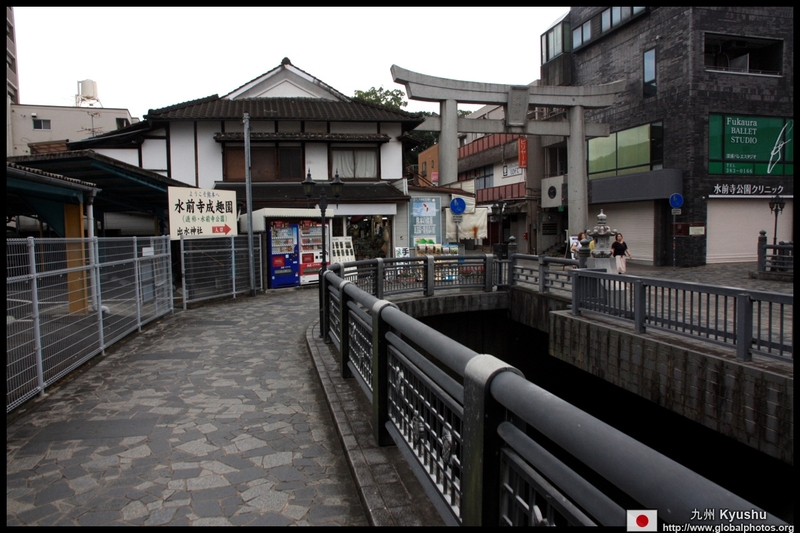 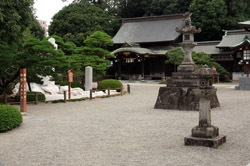 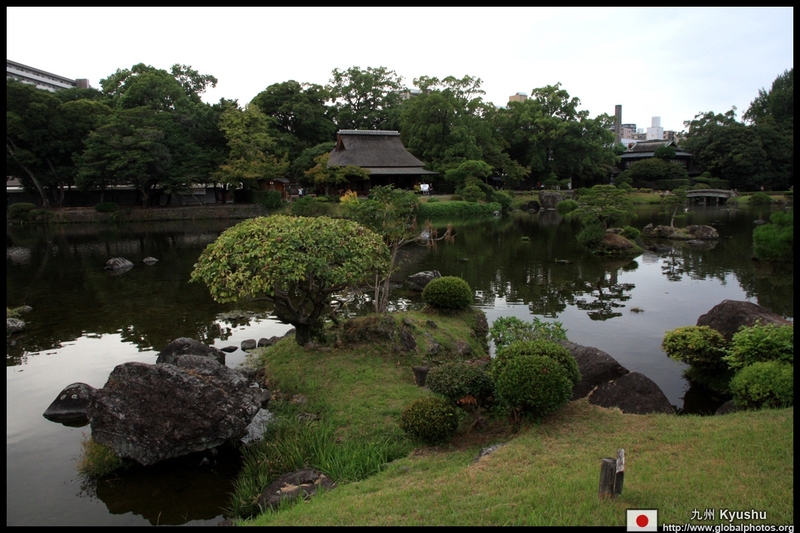 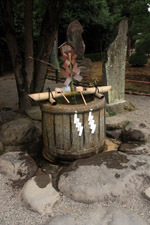 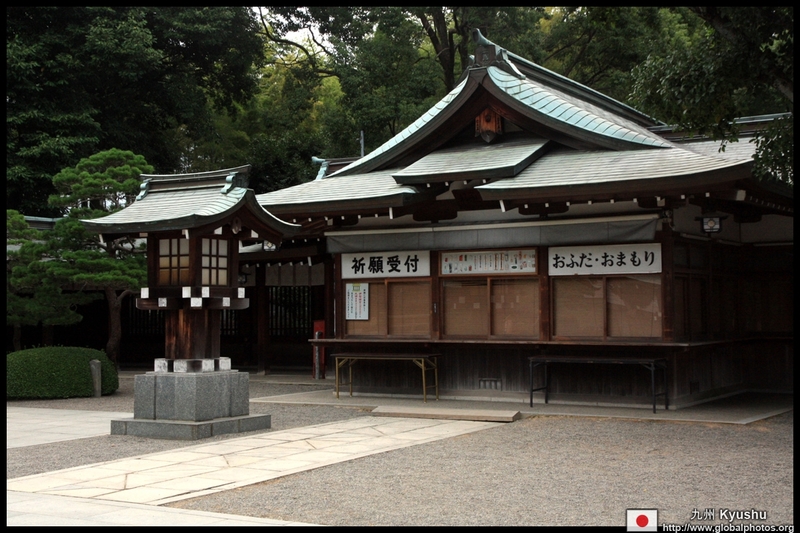 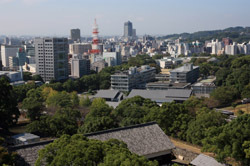 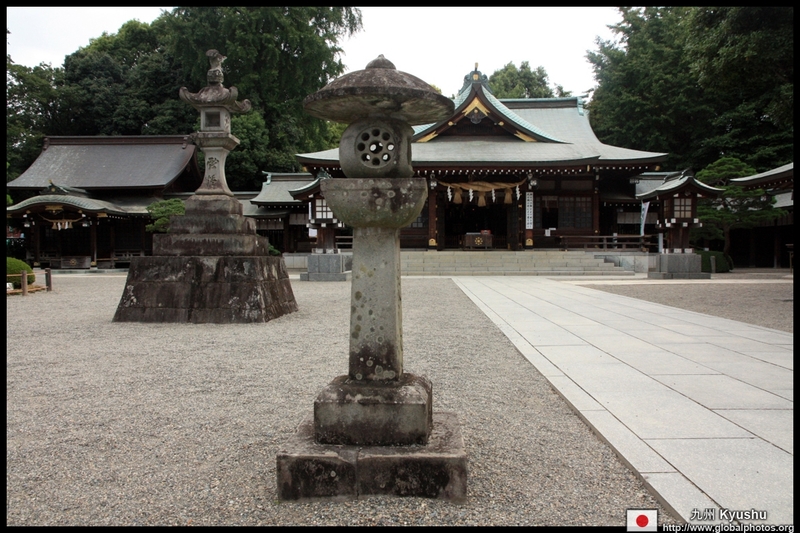 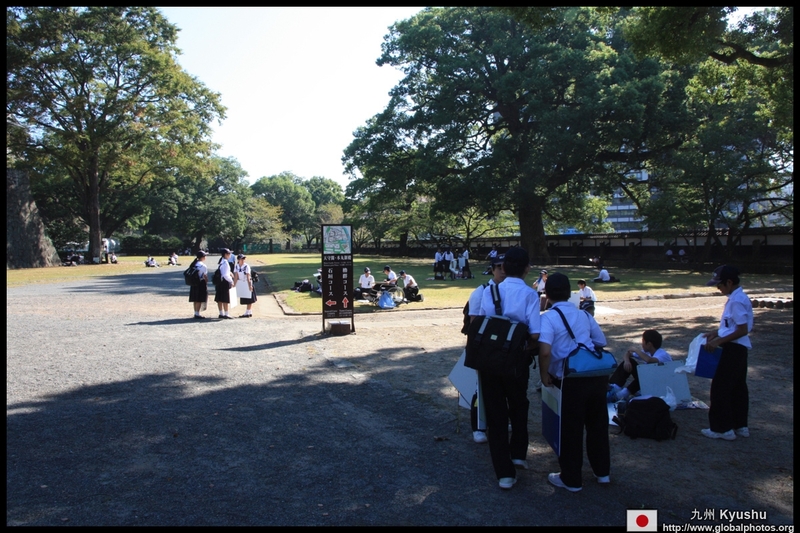 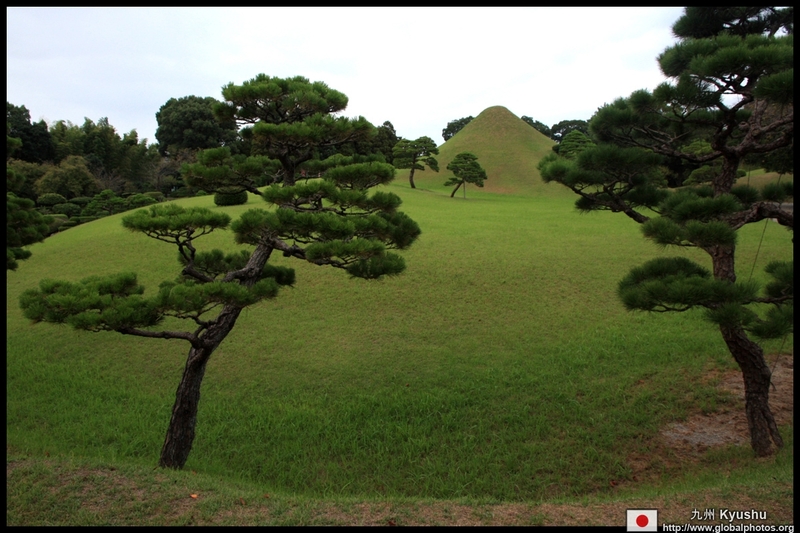 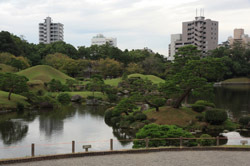 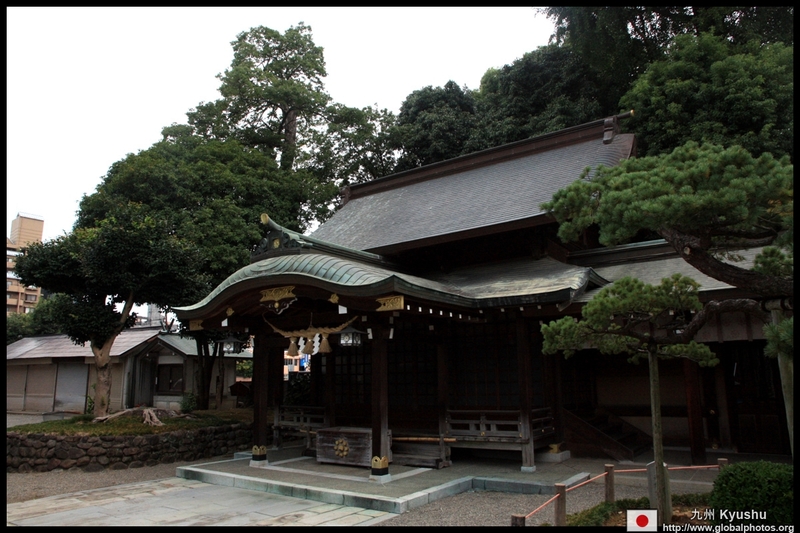 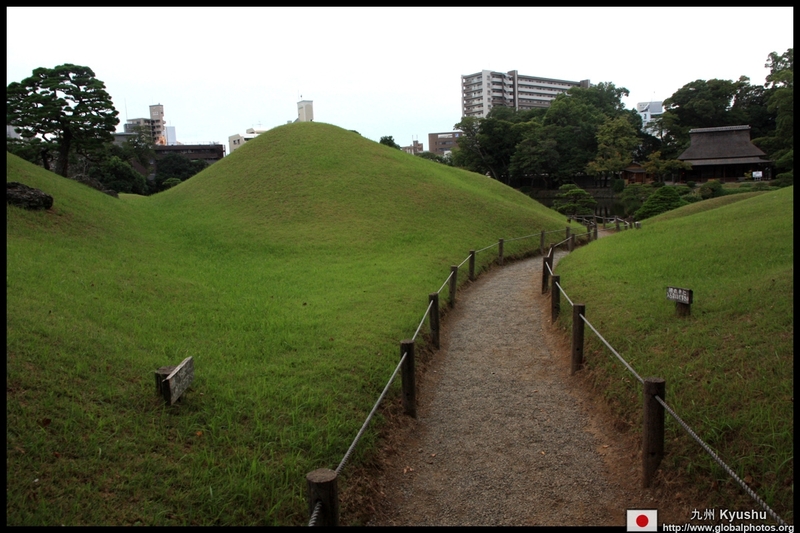 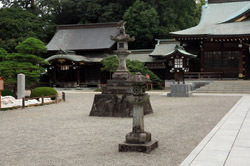 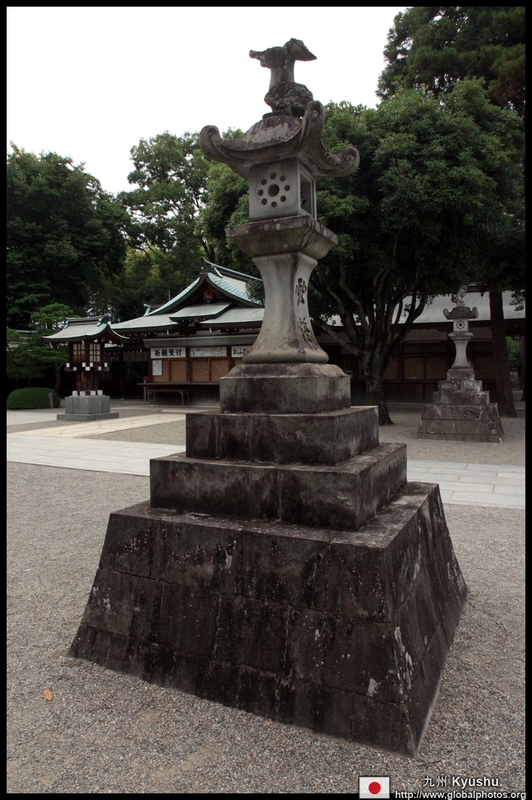 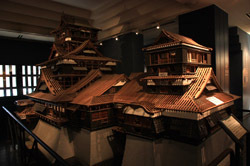 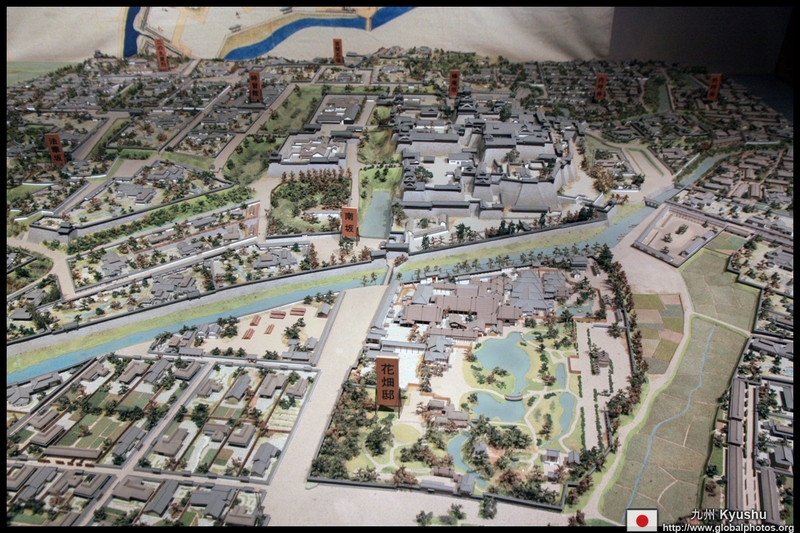 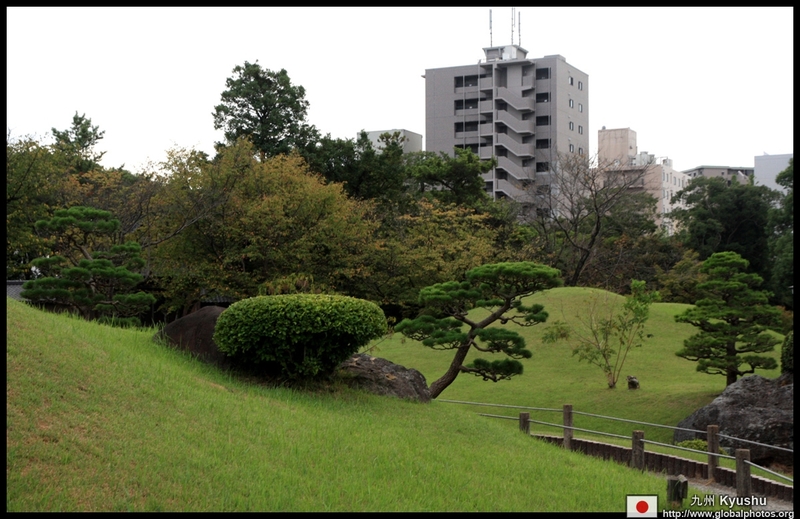 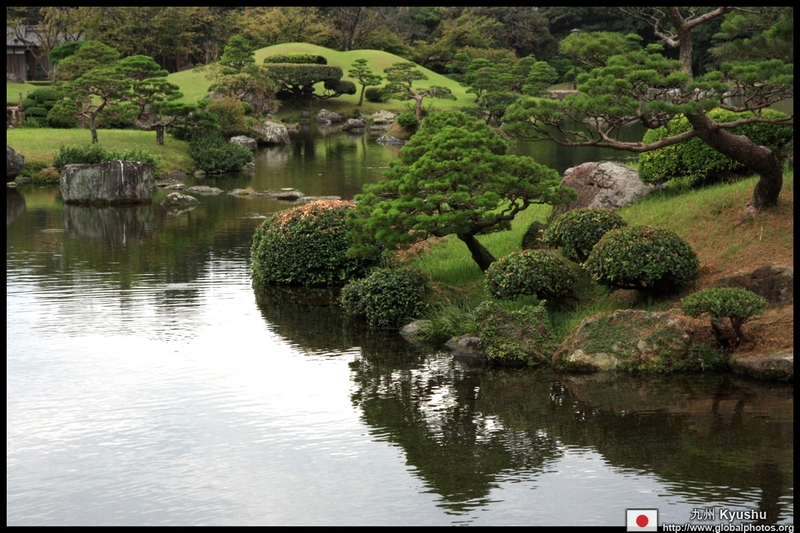 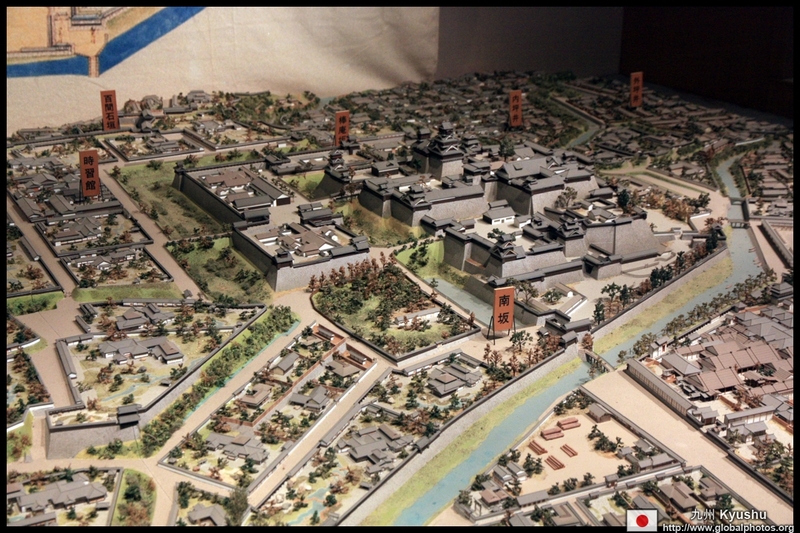 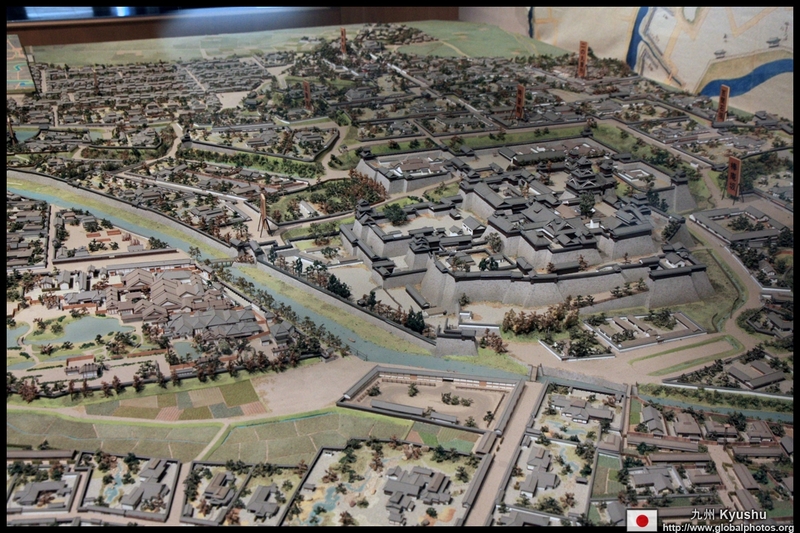 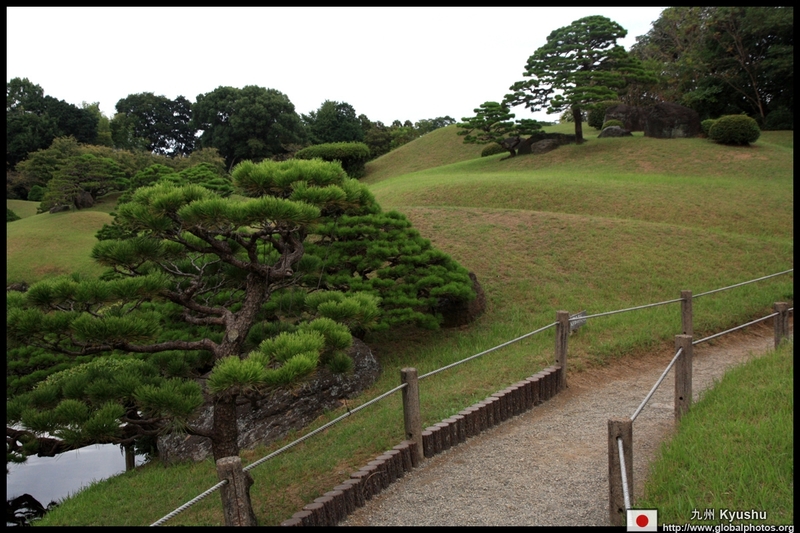 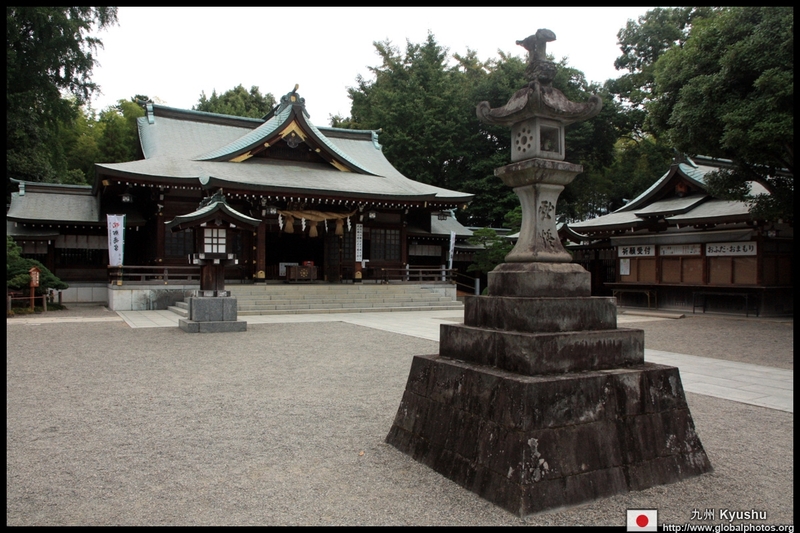 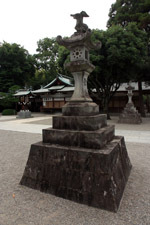 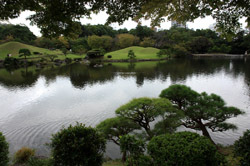 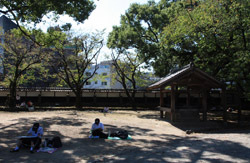 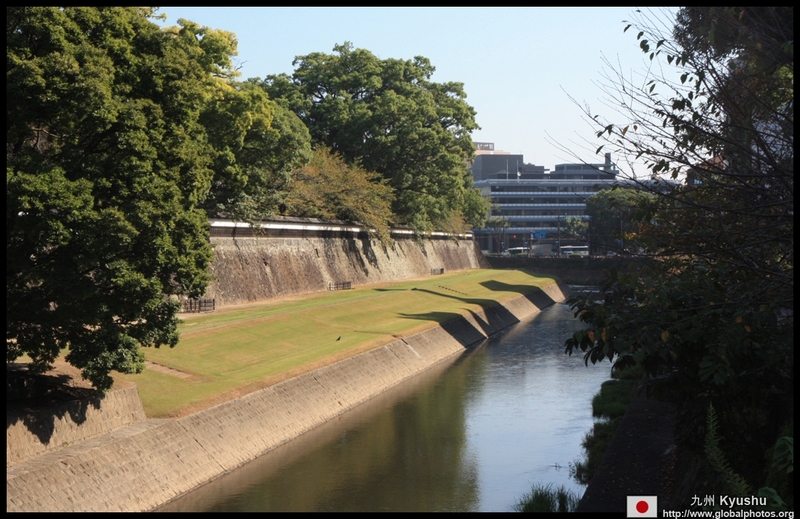 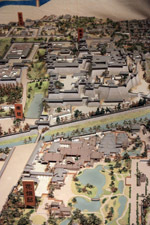 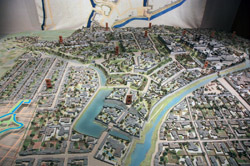 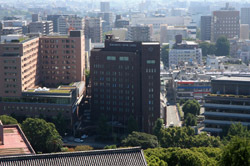 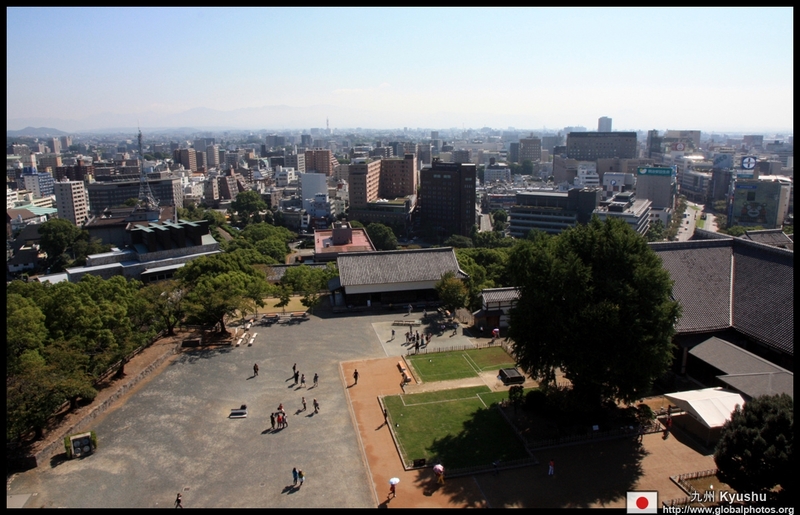 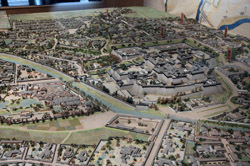 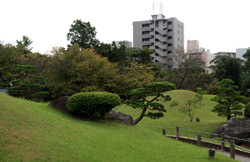 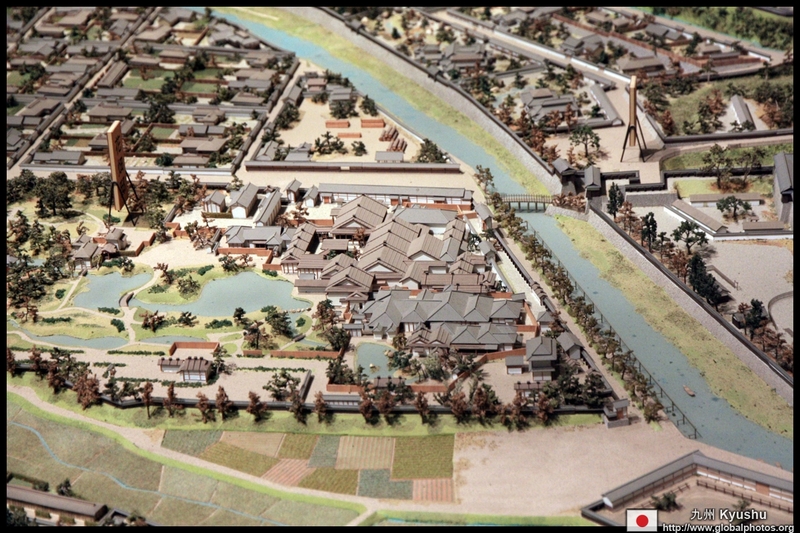 Suizenji was laid out in 1632 and features models of major Japanese scenes such as Mount Fuji and the old Tokaido Road. 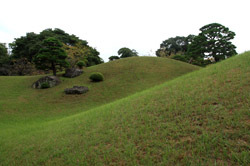 The rolling hills spread out over quite a vast area of almost 65 hectares. 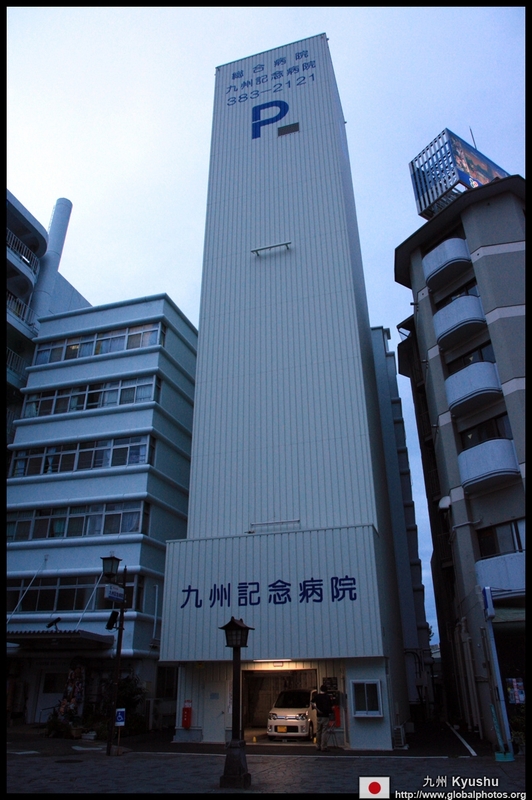 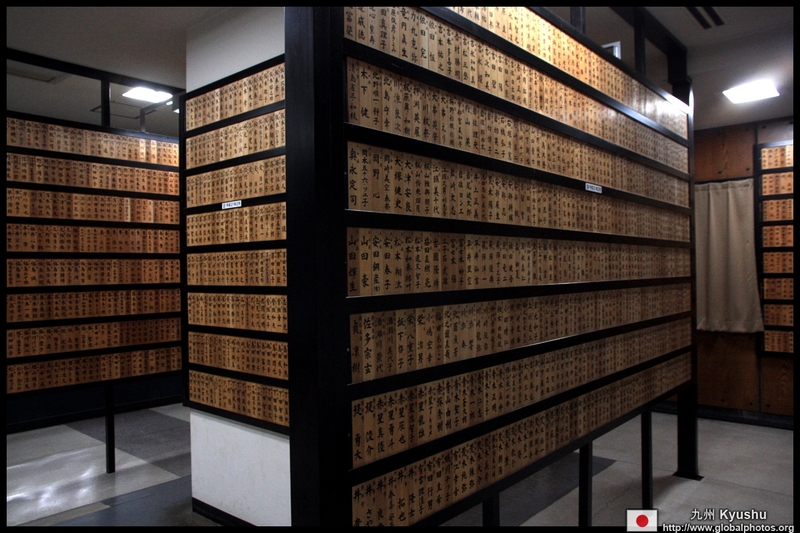 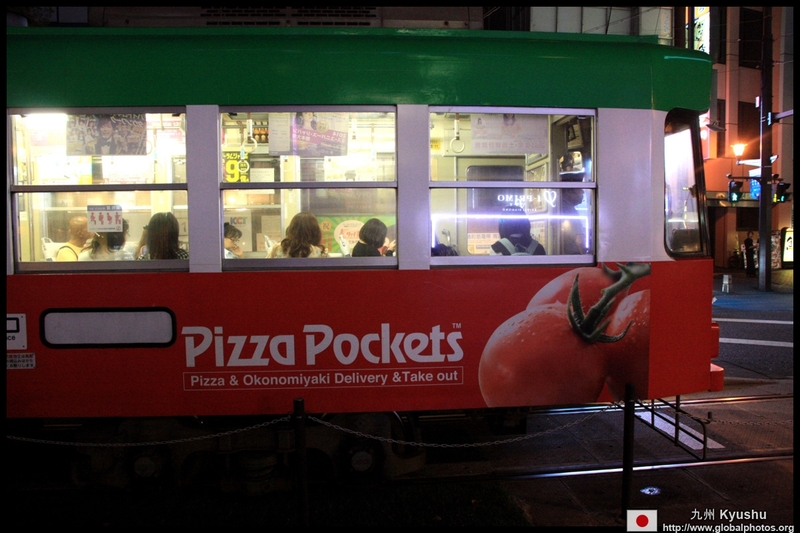 Space is a valuable commodity in Japan. 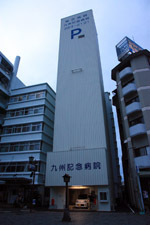 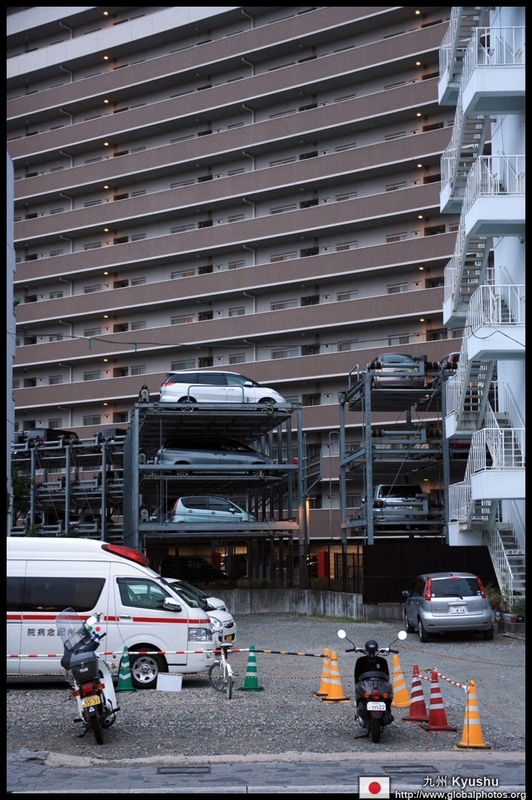 Even parking lots can be stacked up, with even an elevator possible. 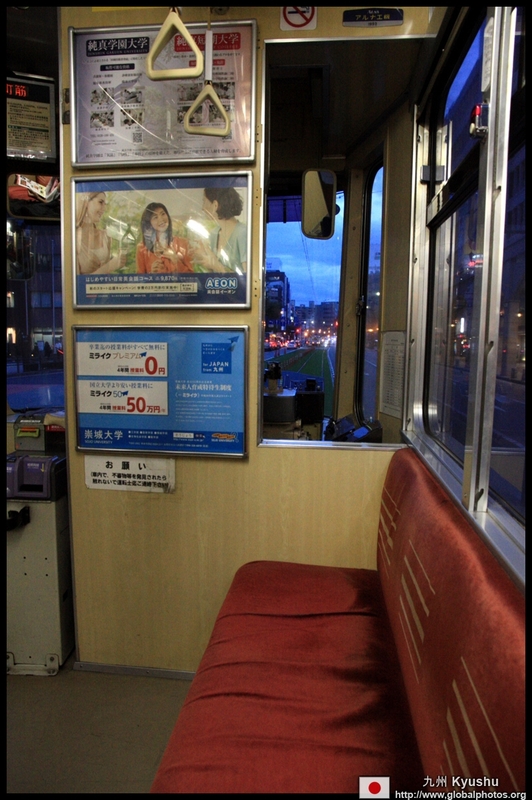 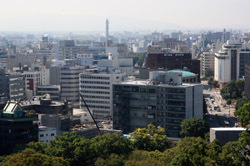 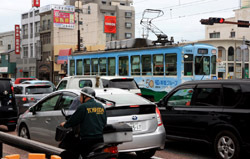 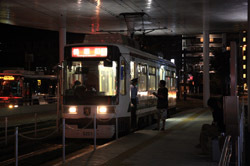 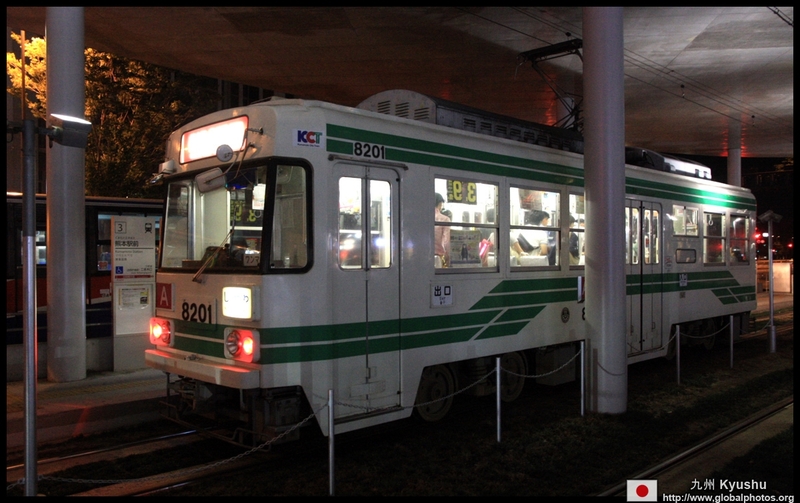 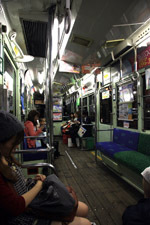 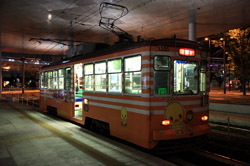 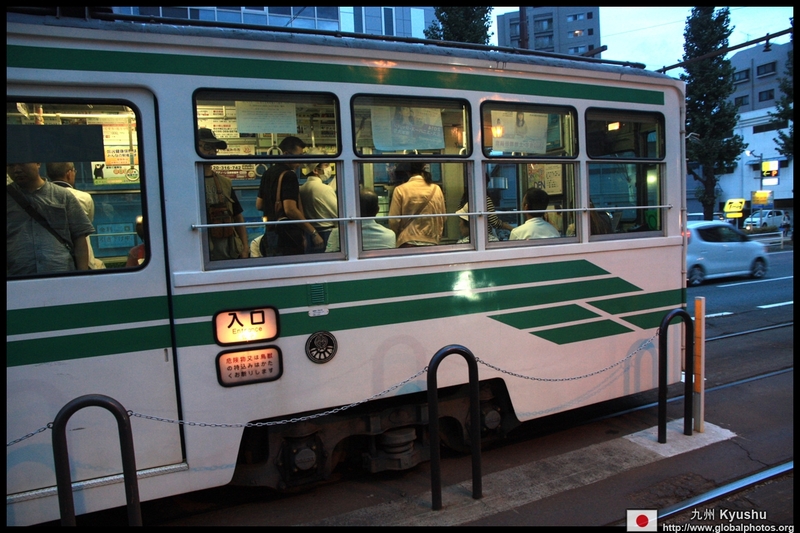 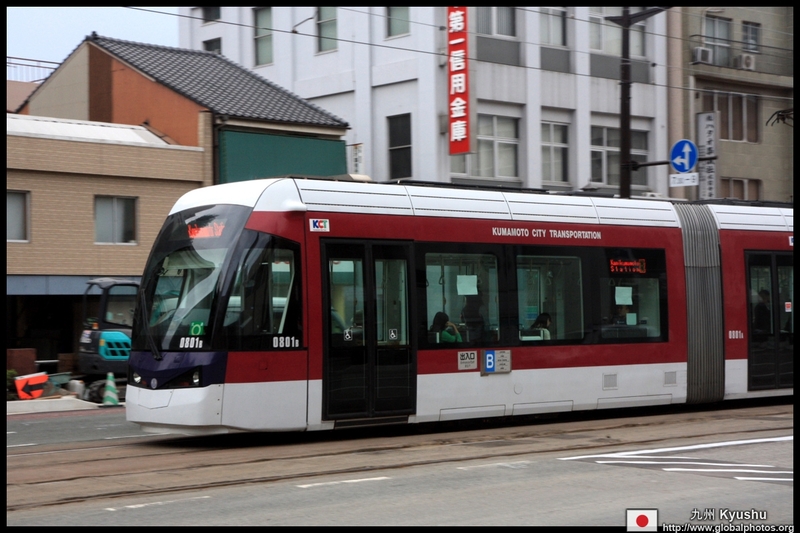 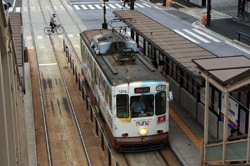 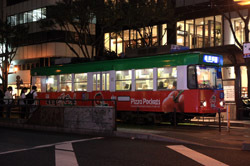 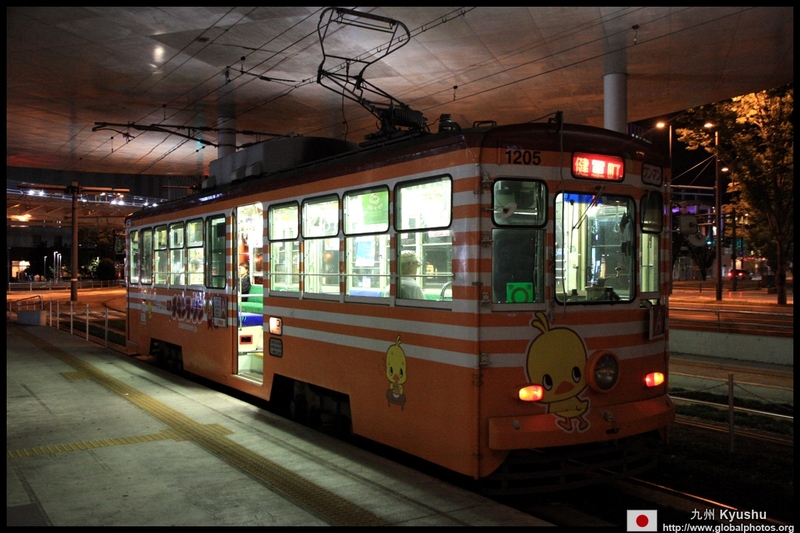 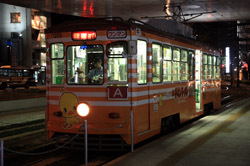 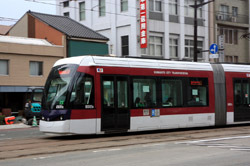 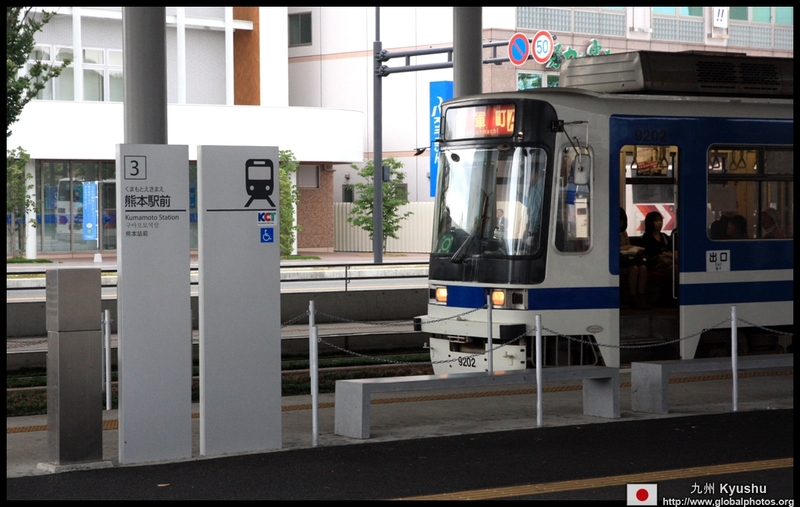 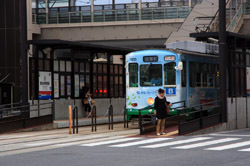 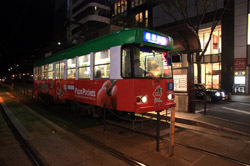 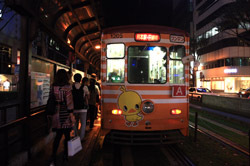 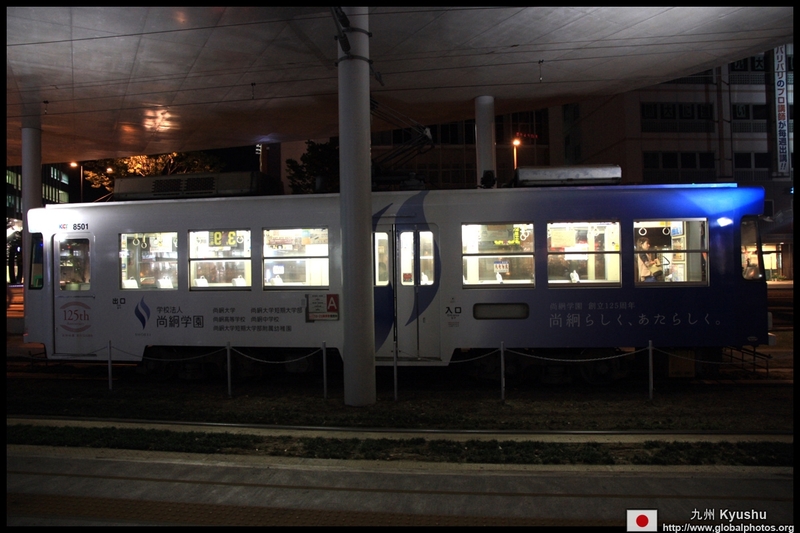 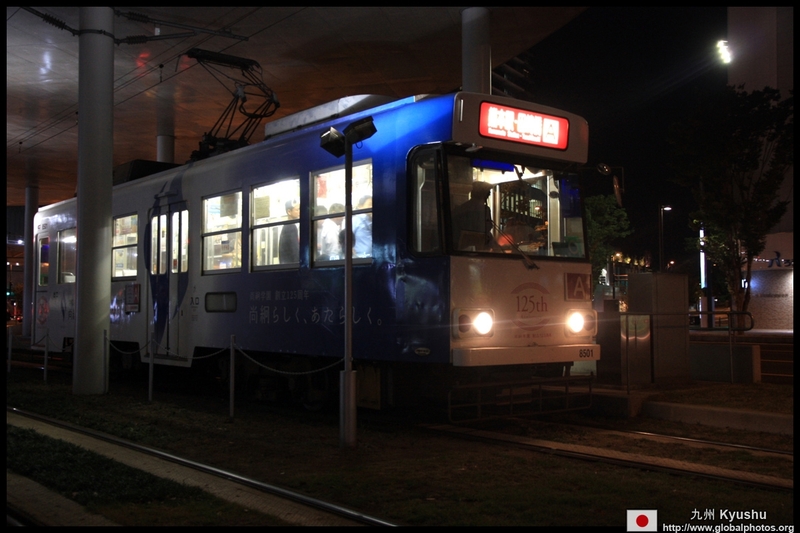 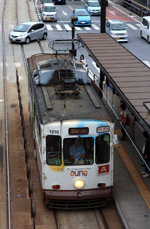 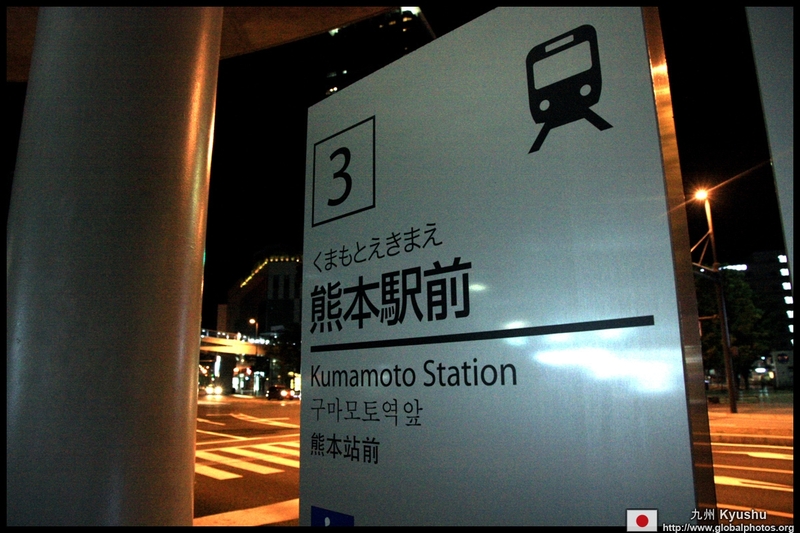 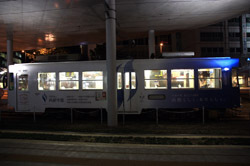 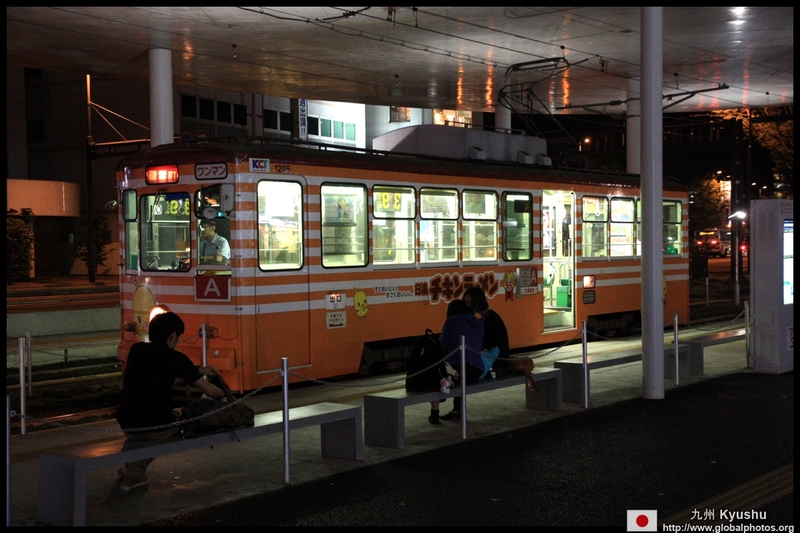 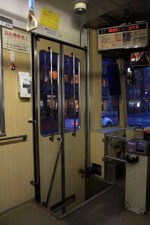 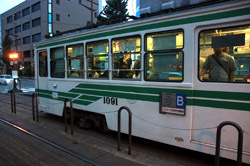 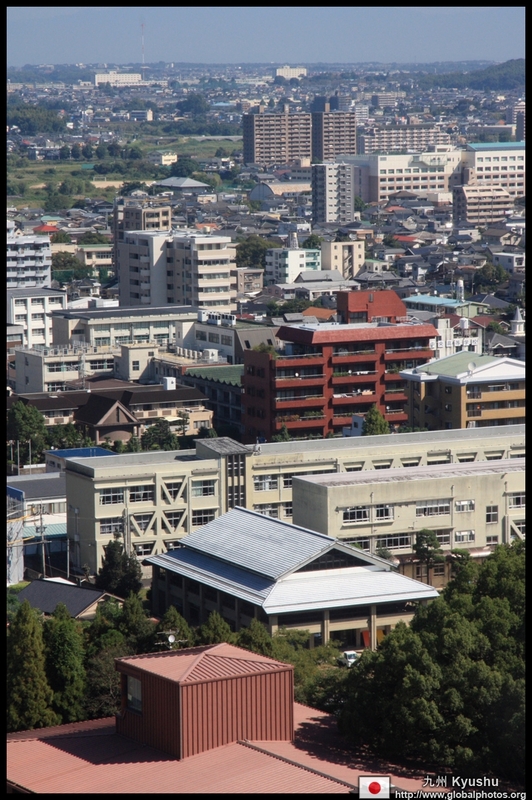 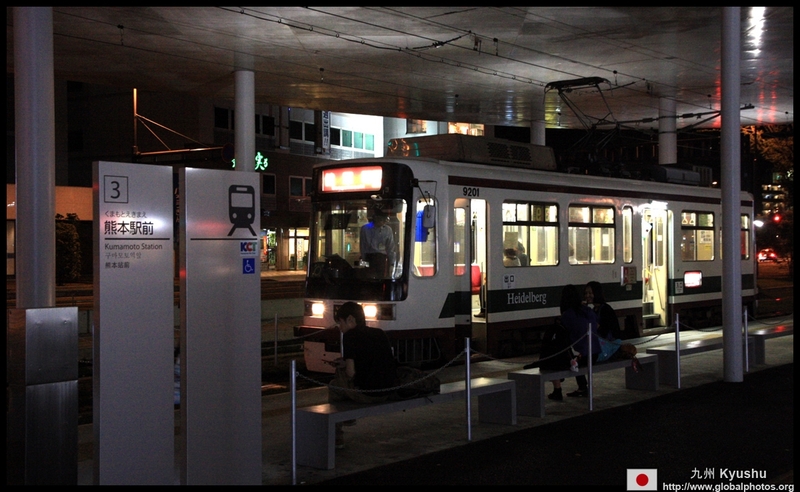 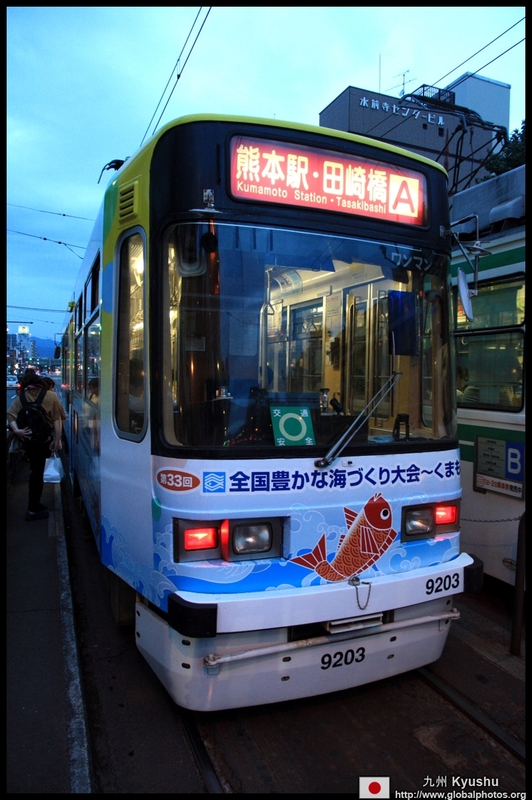 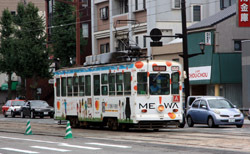 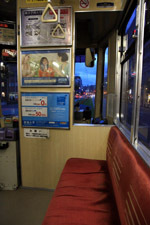 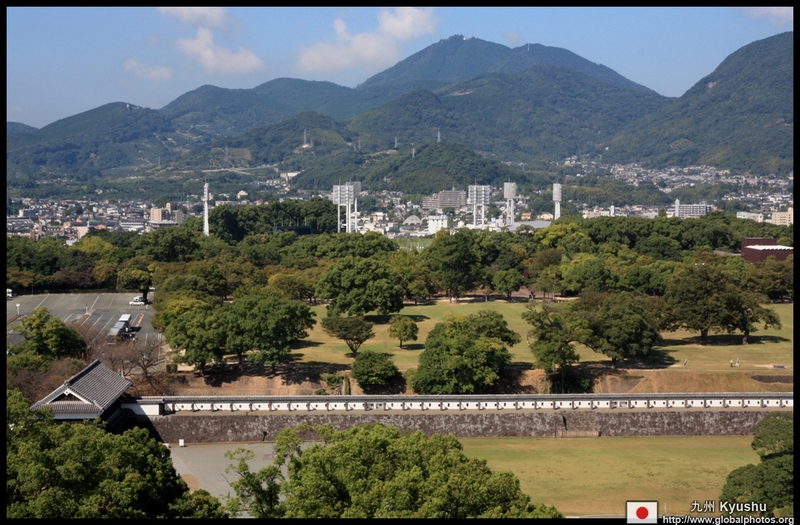 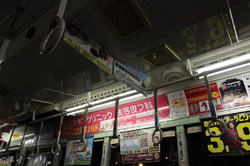 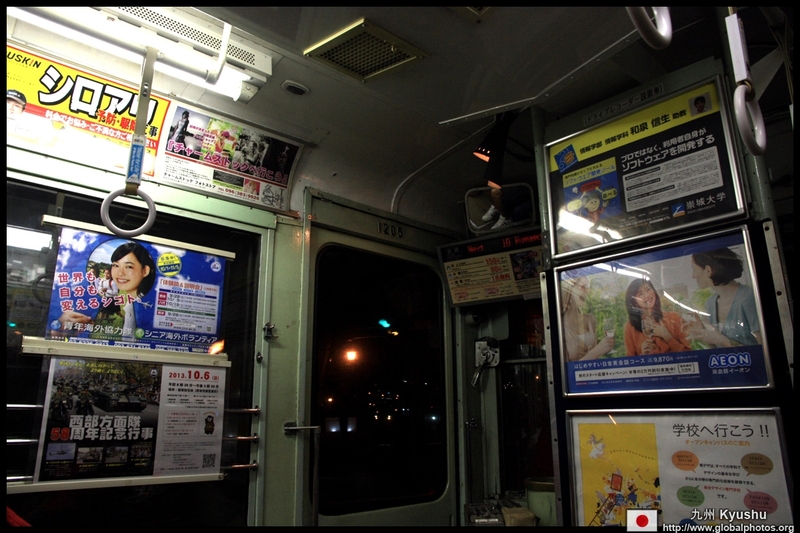 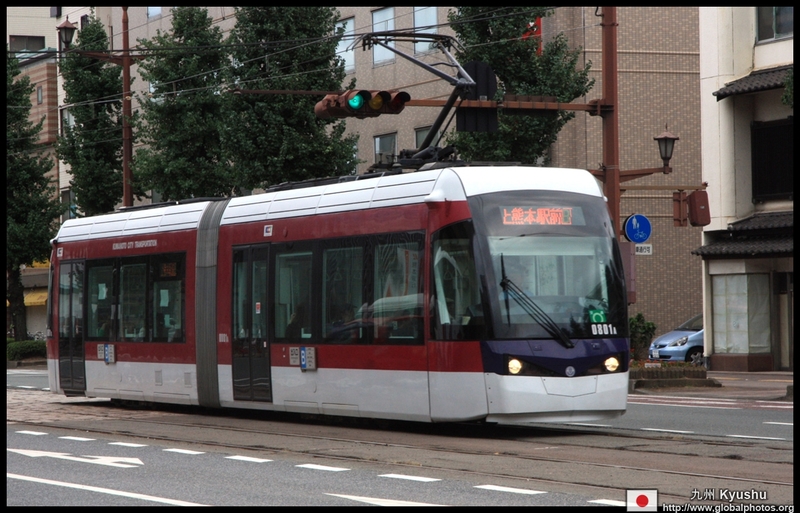 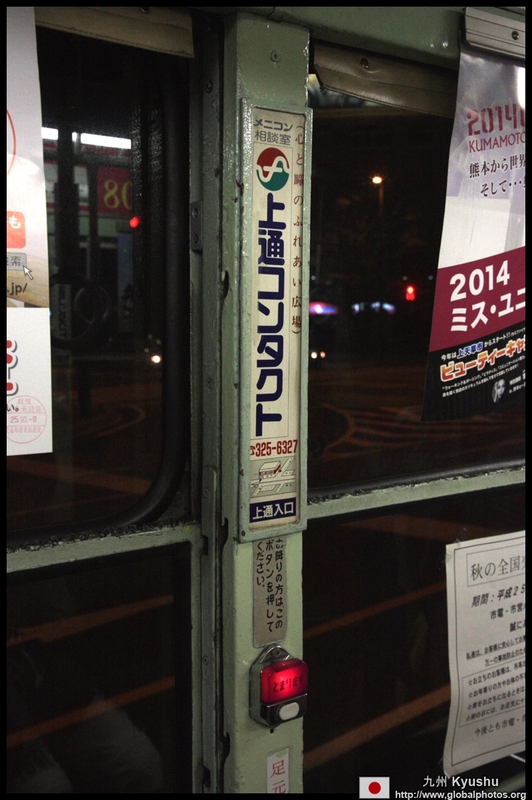 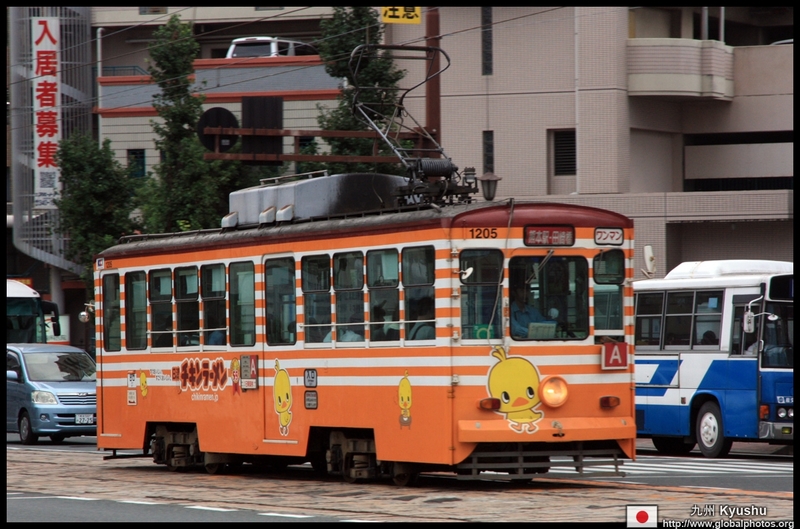 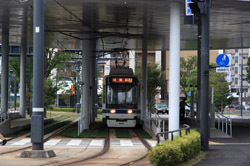 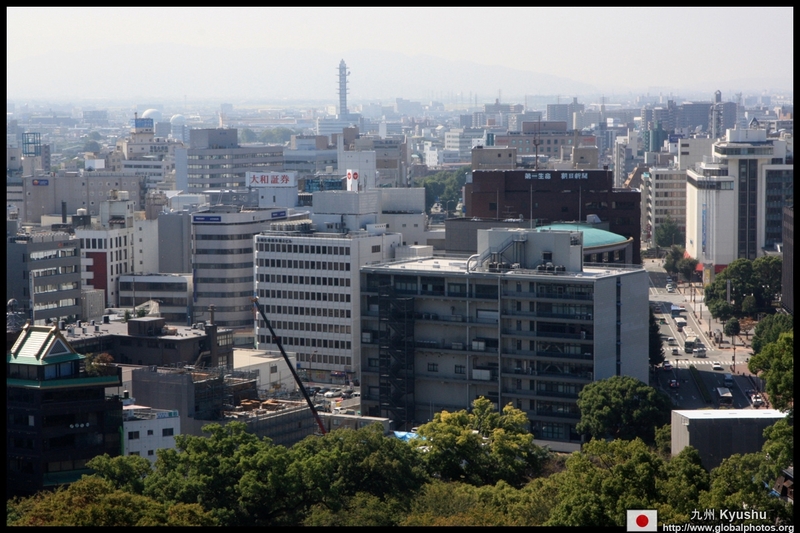 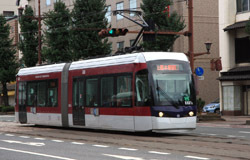 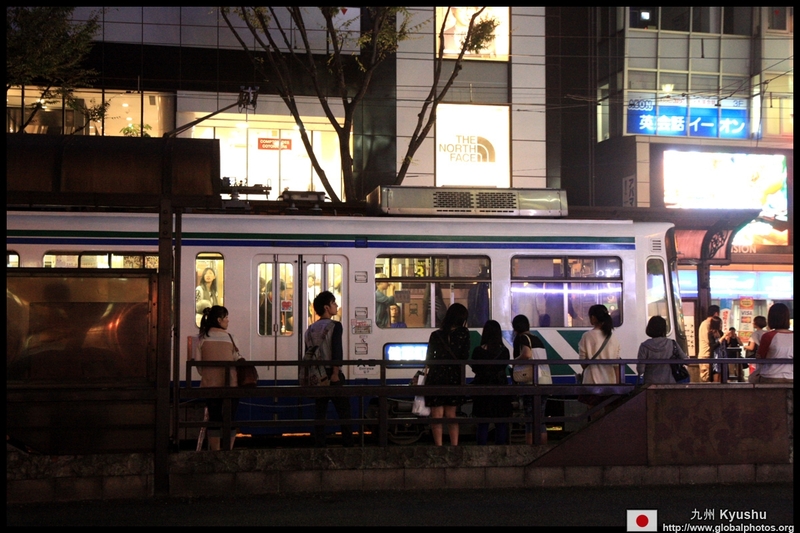 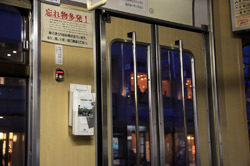 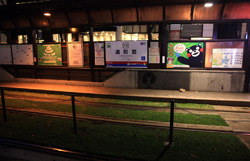 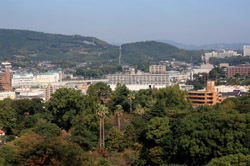 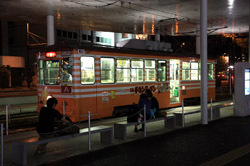 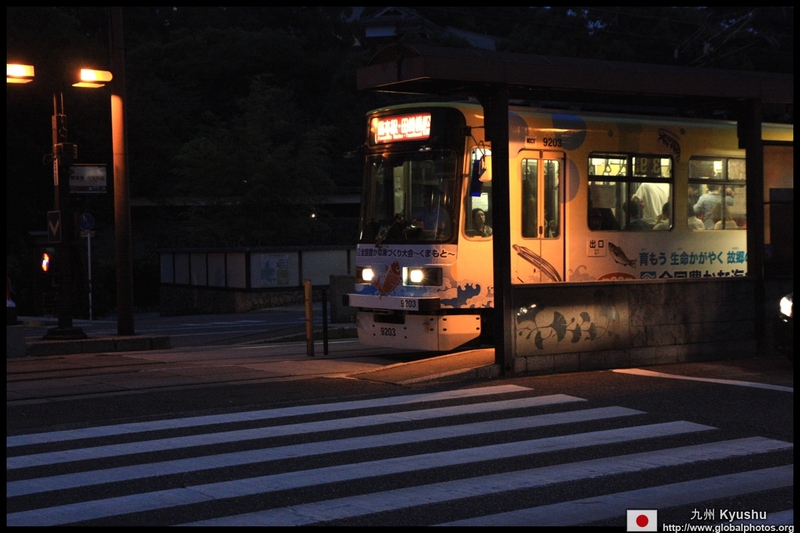 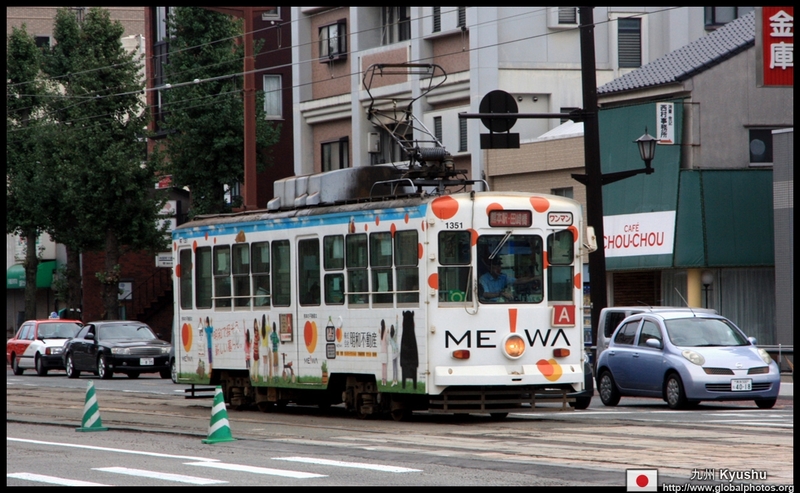 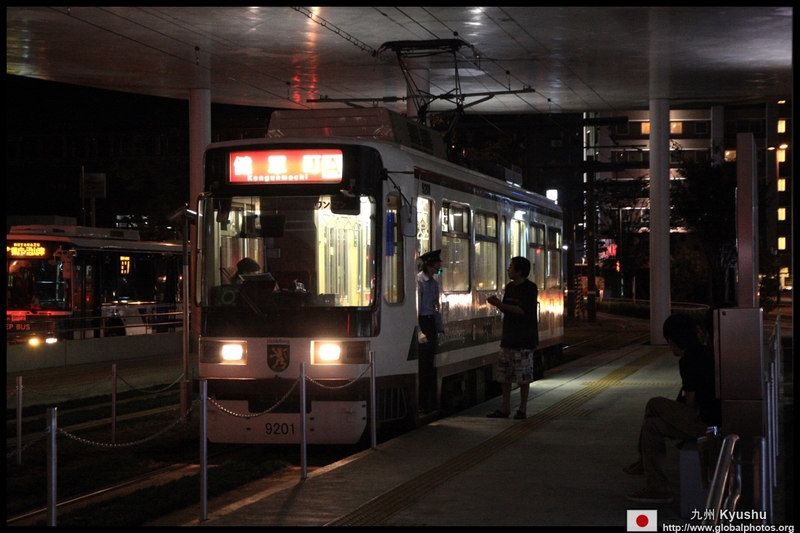 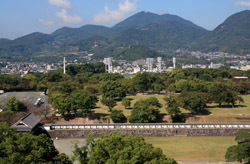 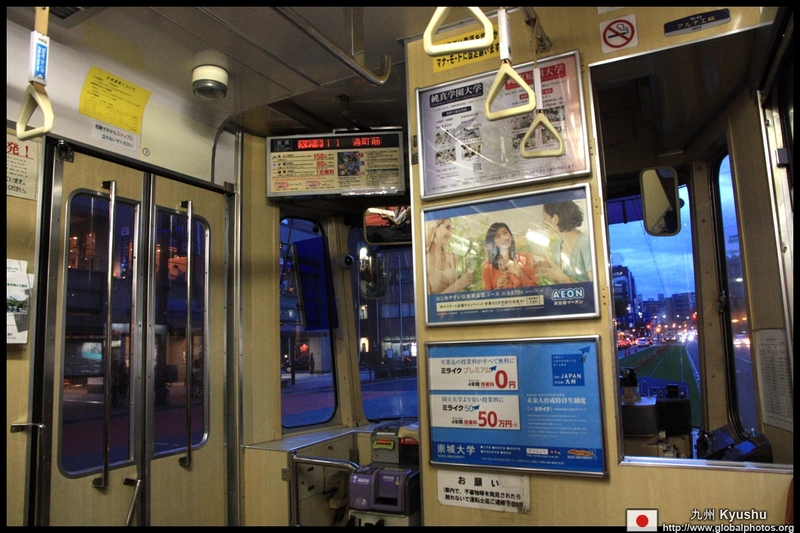 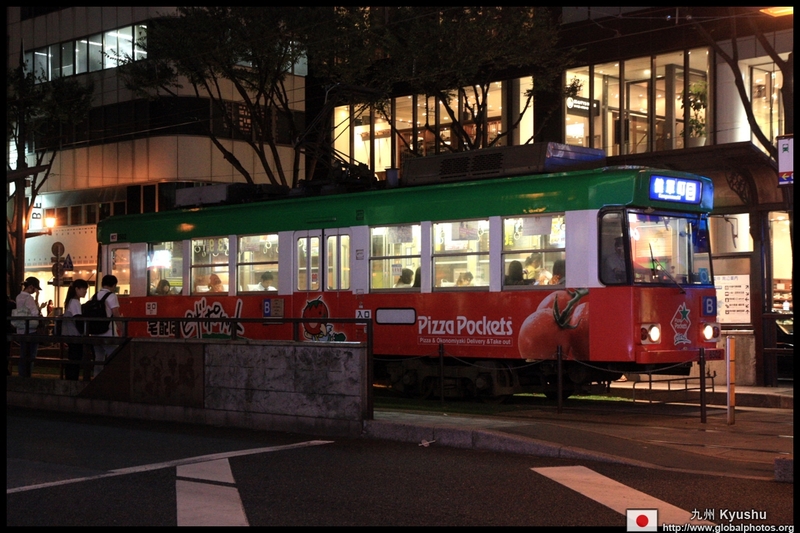 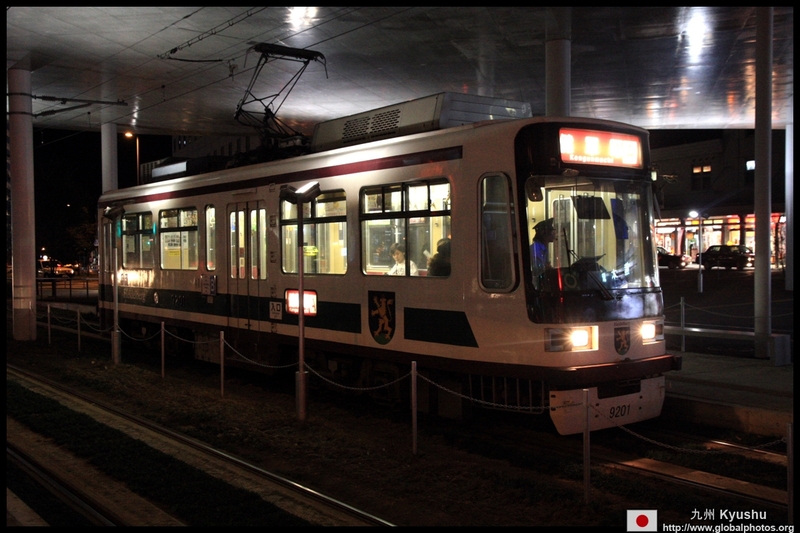 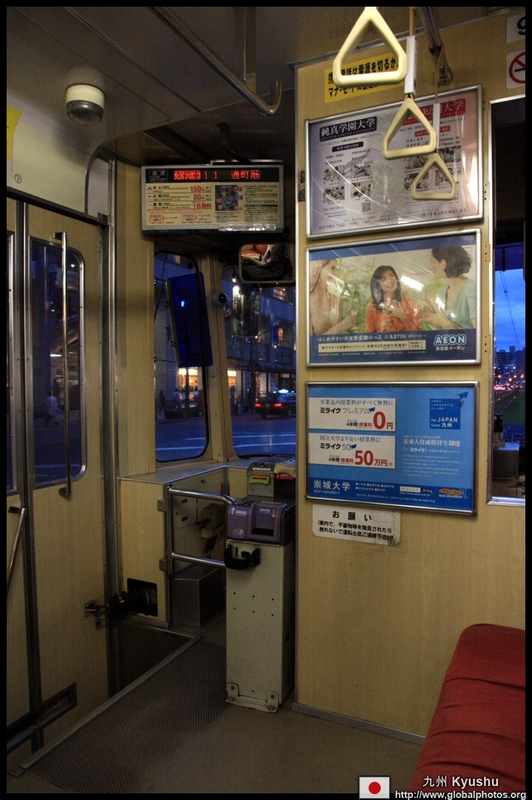 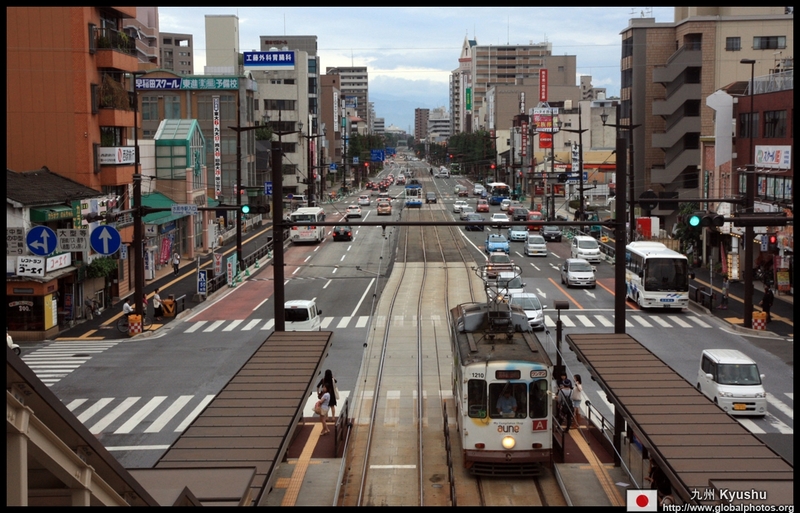 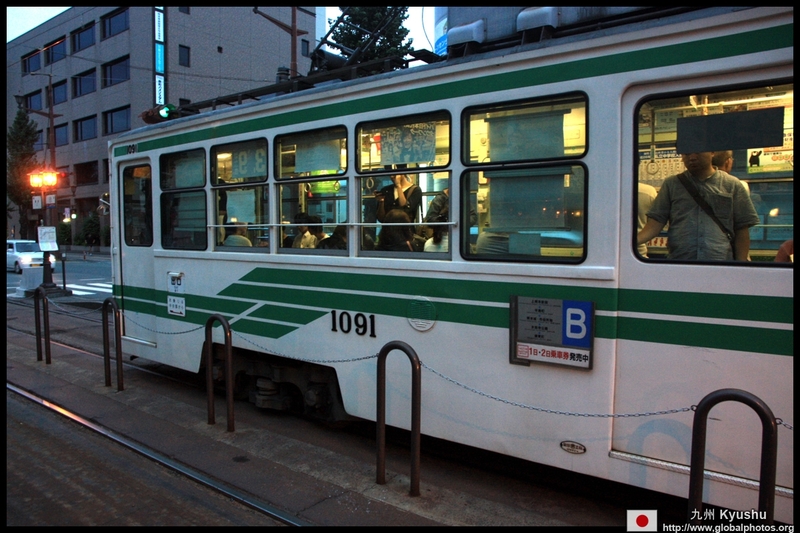 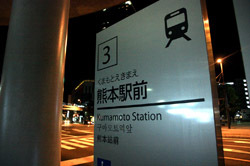 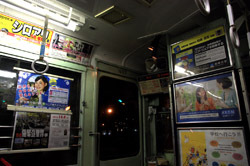 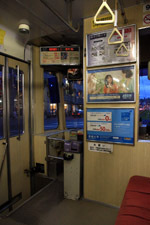 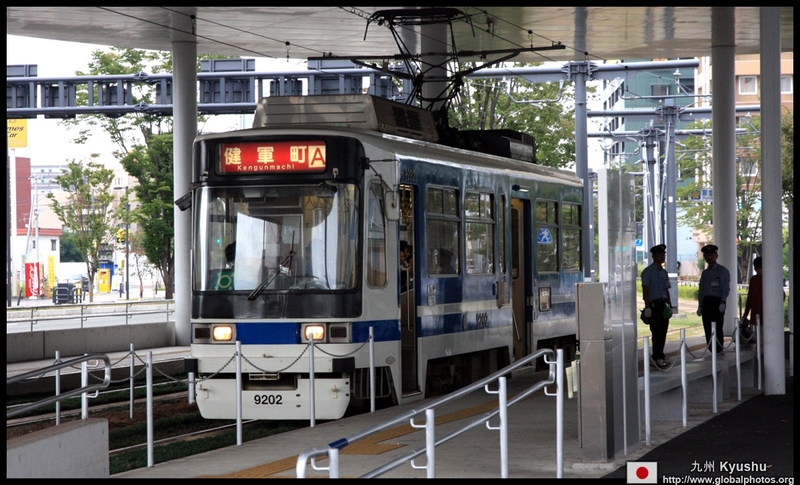 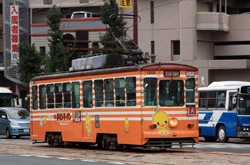 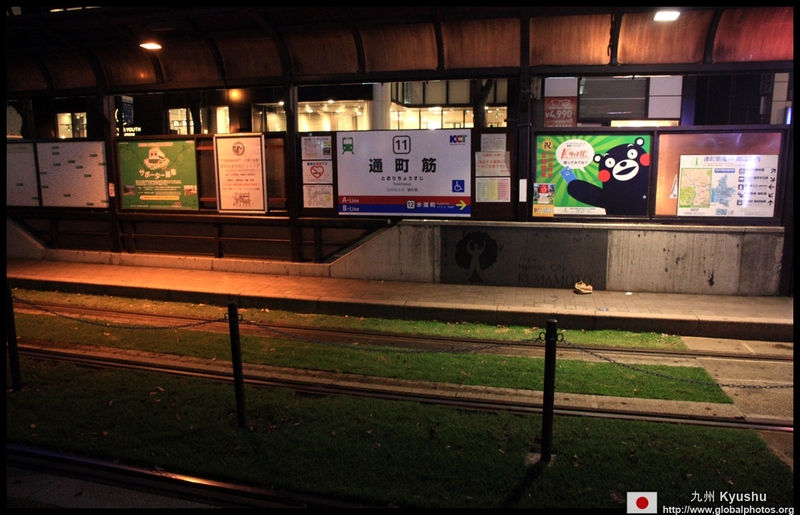 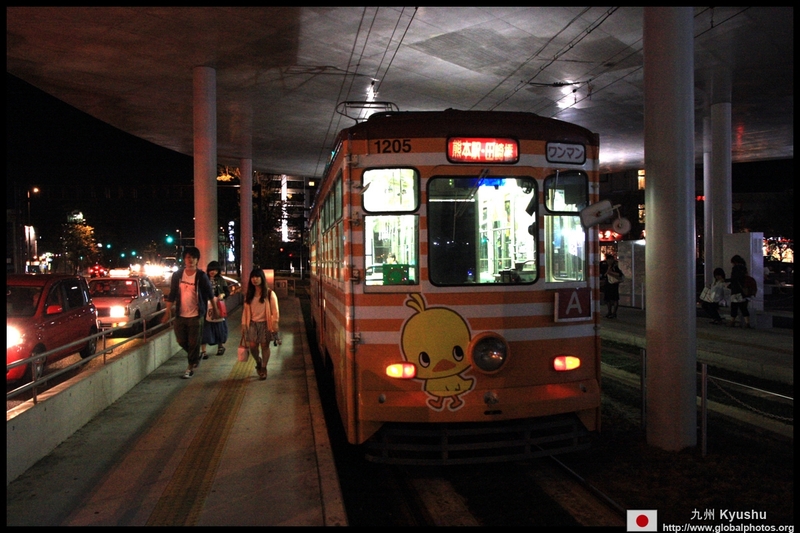 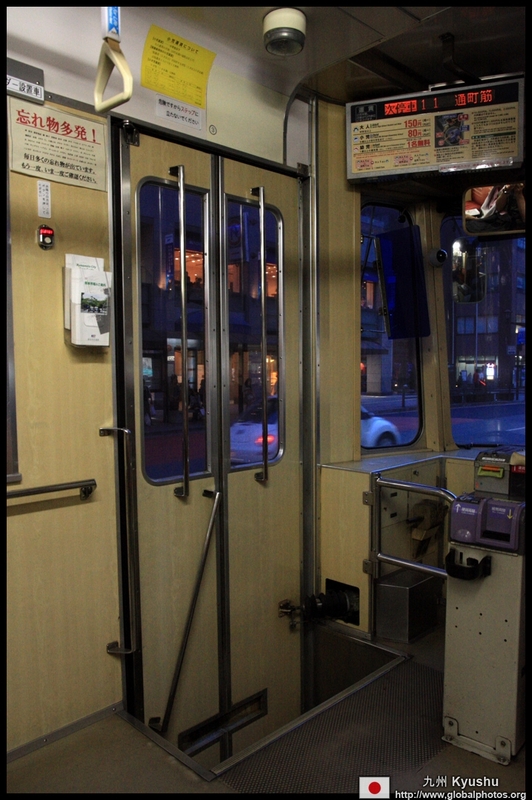 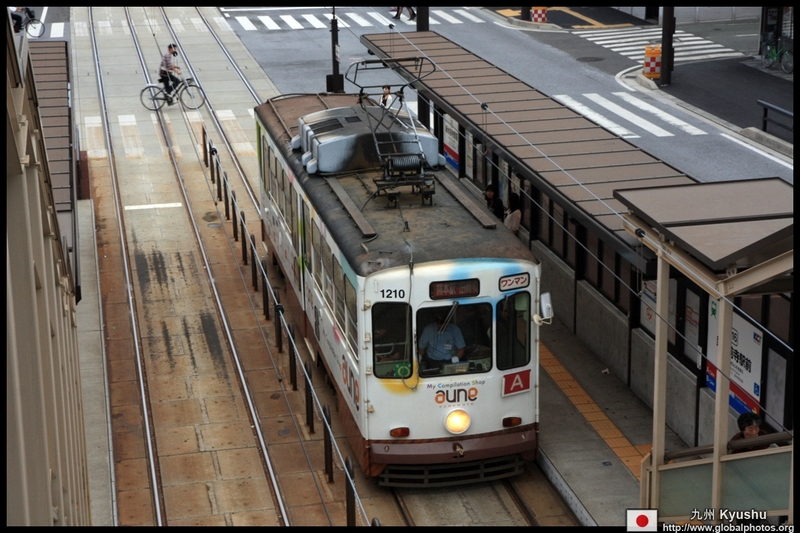 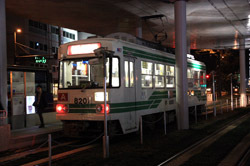 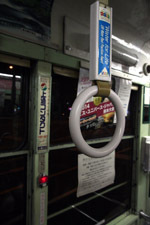 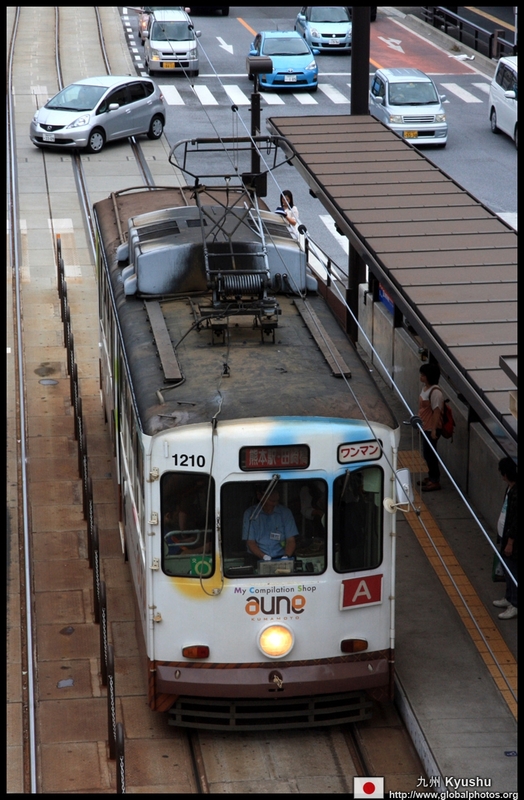 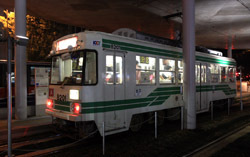 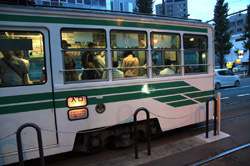 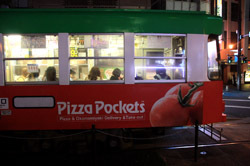 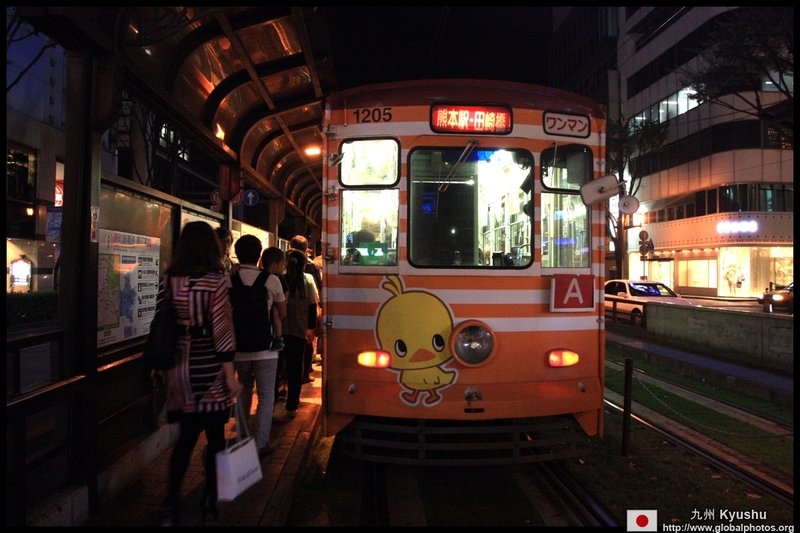 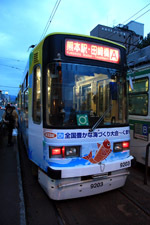 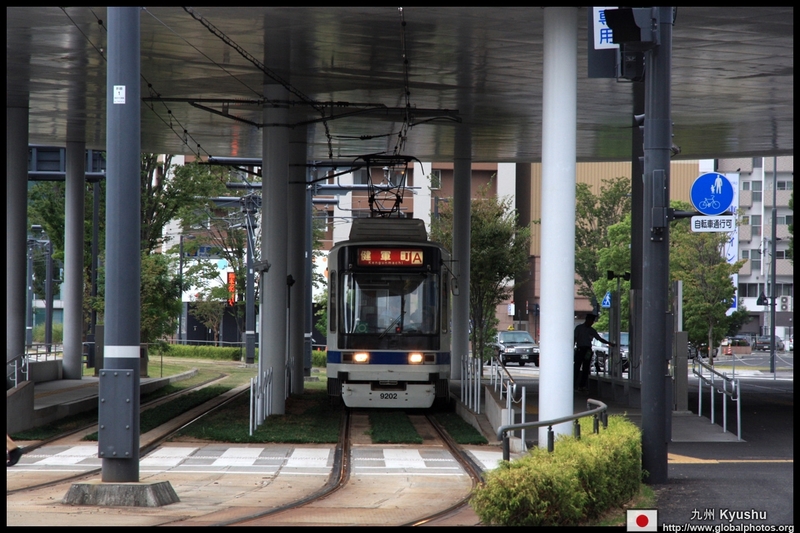 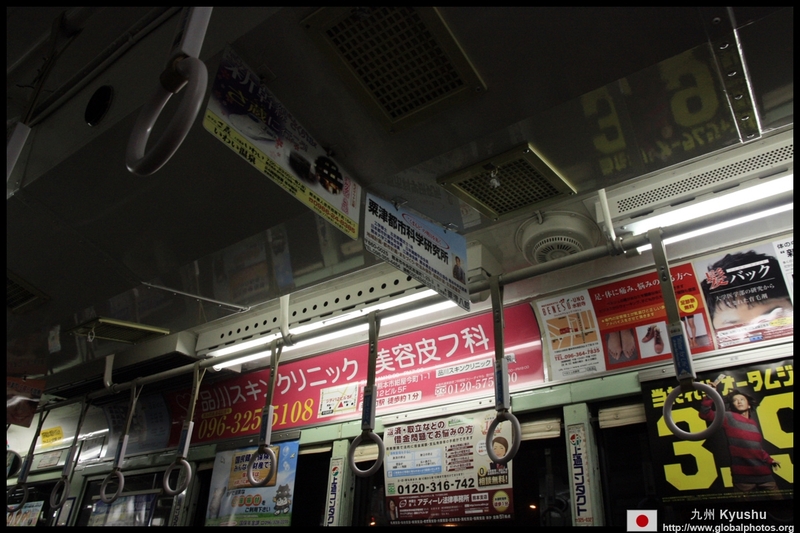 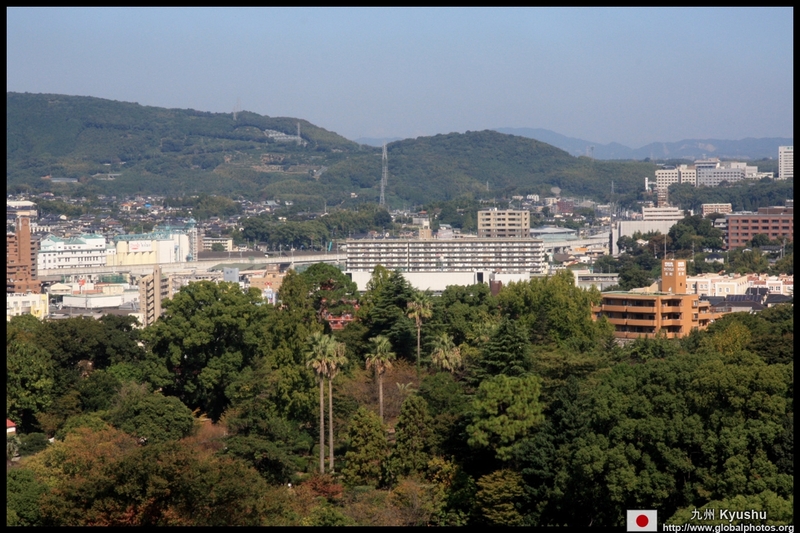 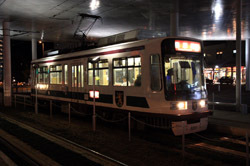 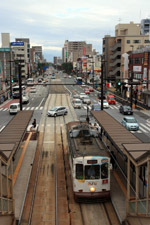 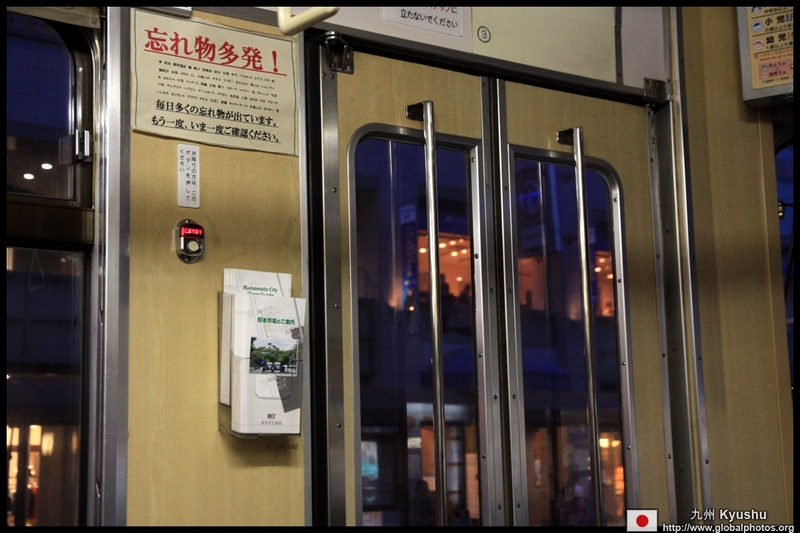 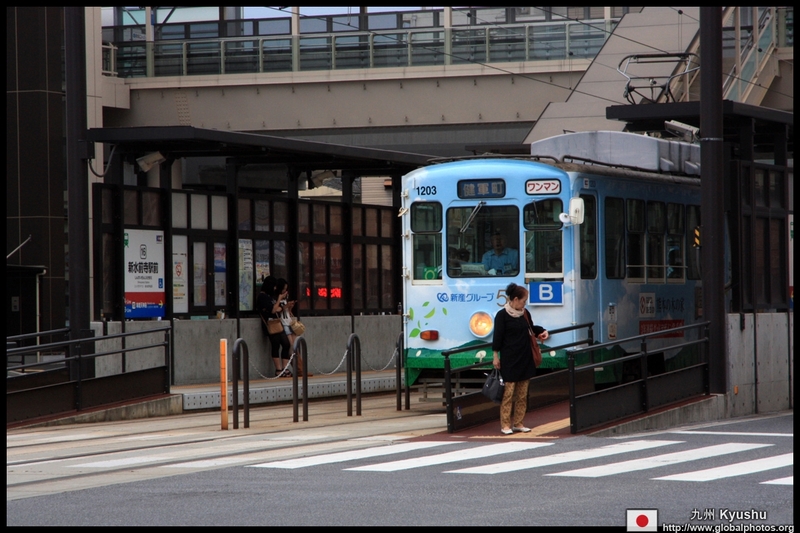 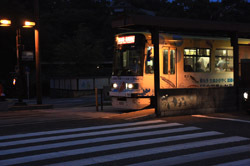 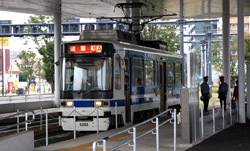 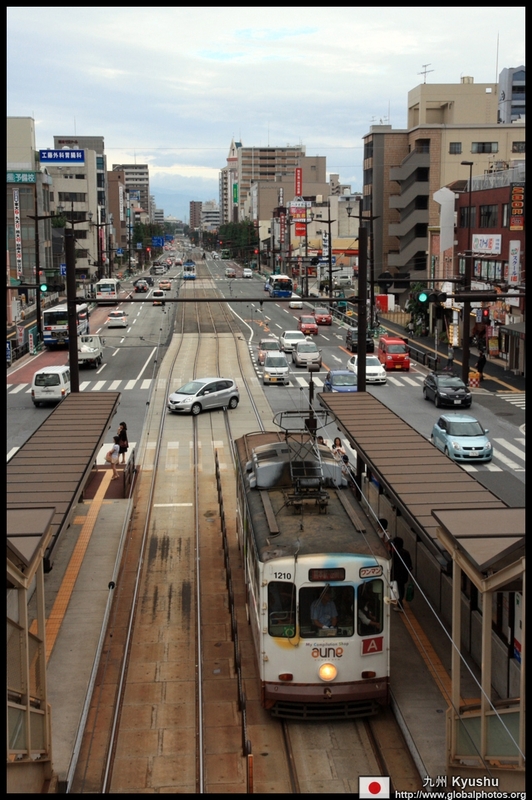 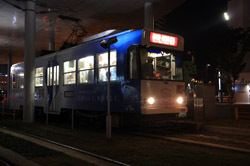 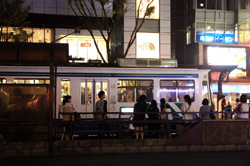 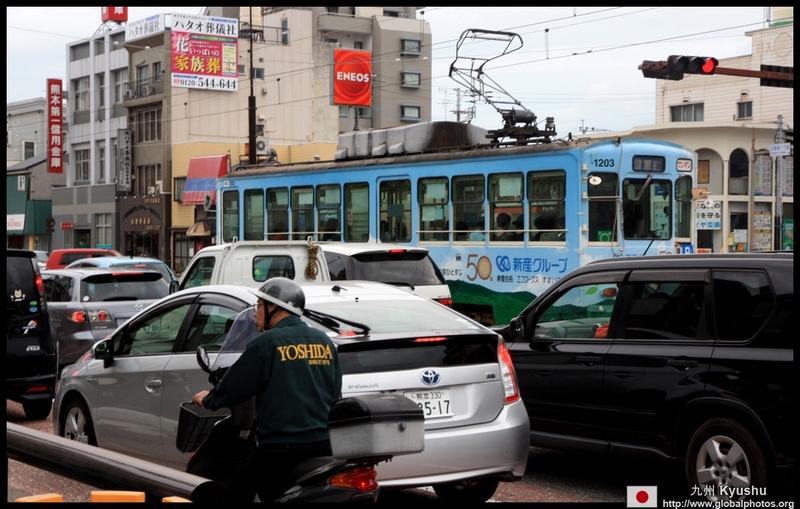 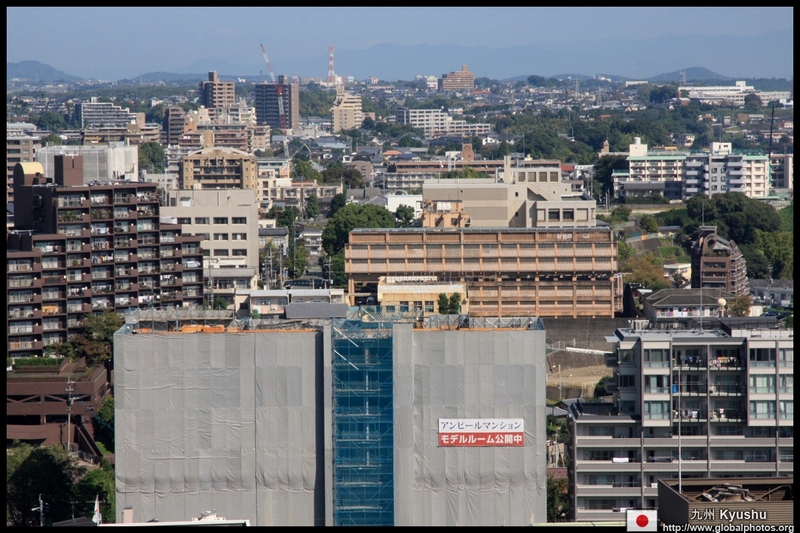 Kumamoto has 2 tram lines, which use a mix of both modern and antique rolling stock. 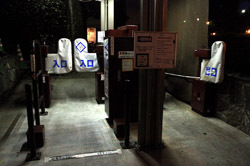 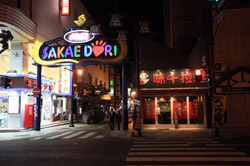 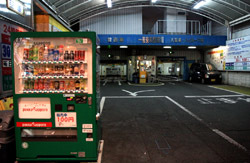 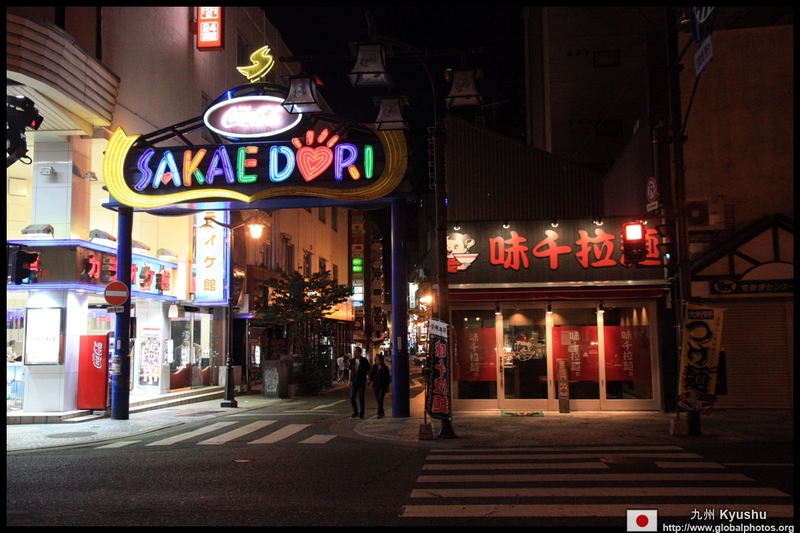 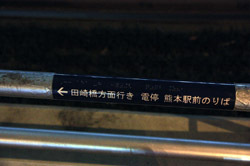 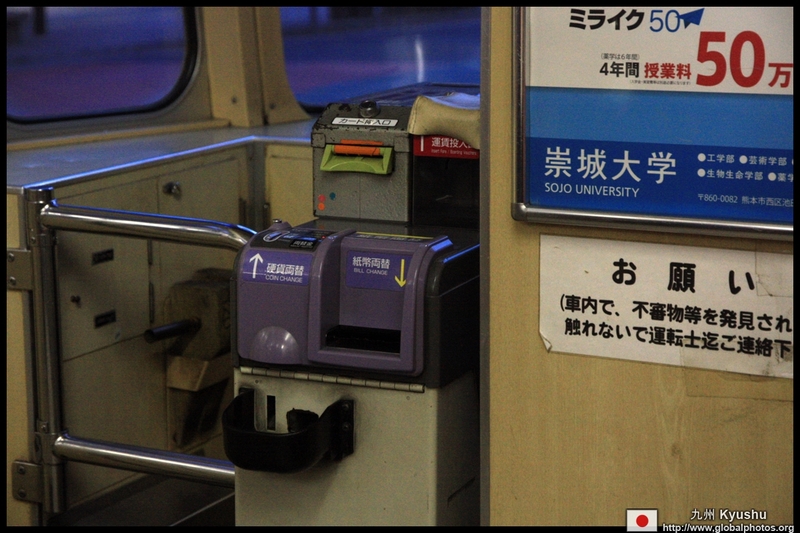 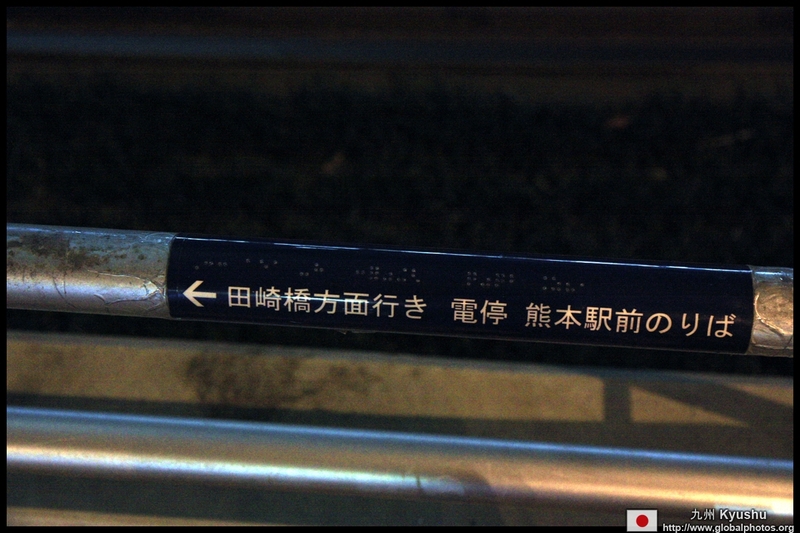 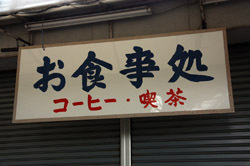 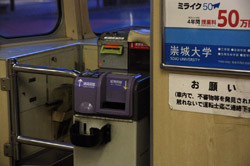 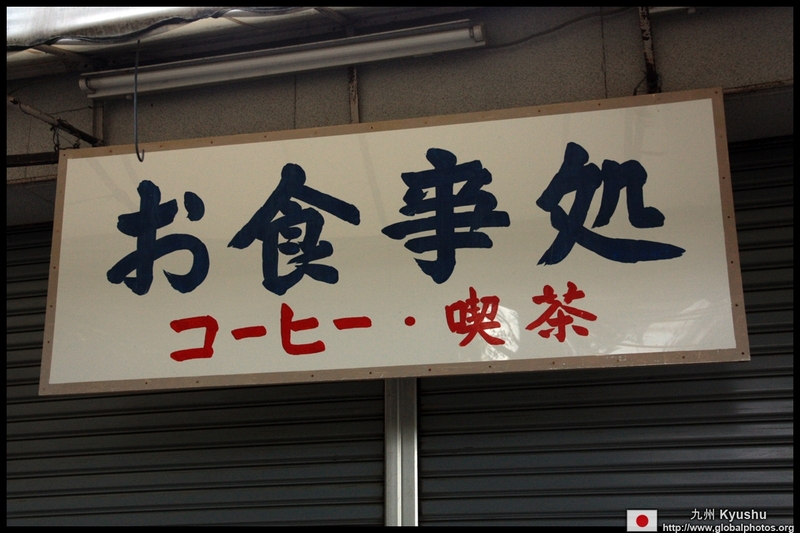 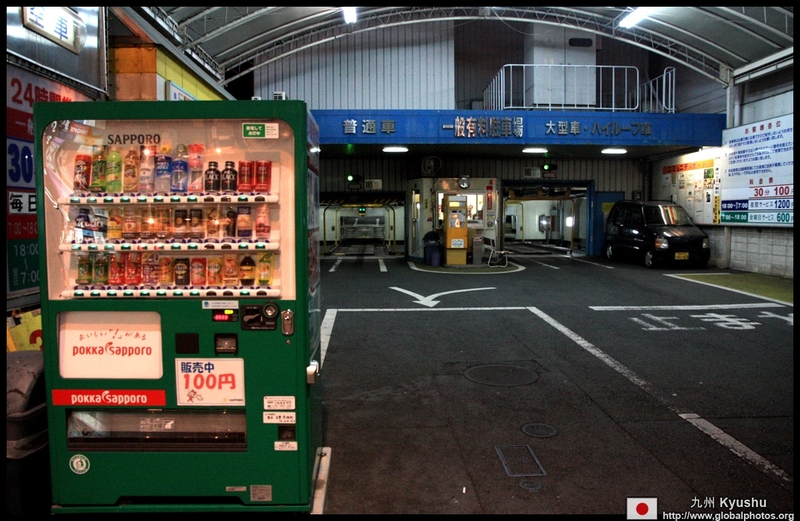 A single trip costs 150 yen and you pay when you exit. 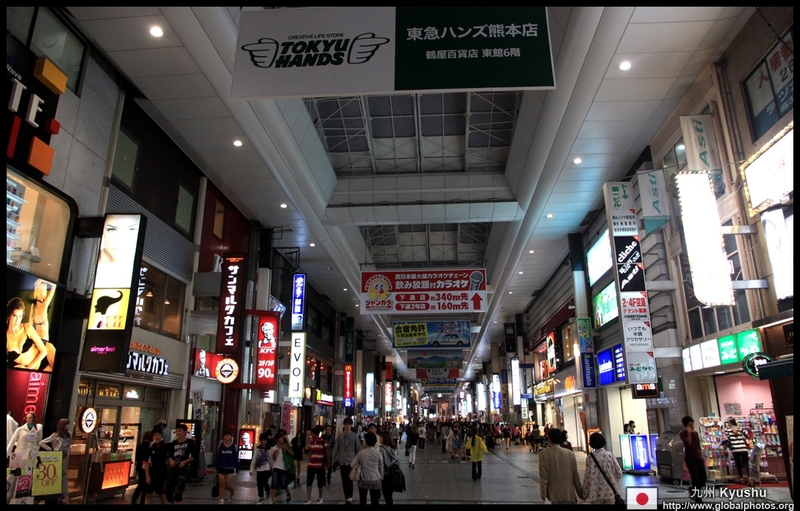 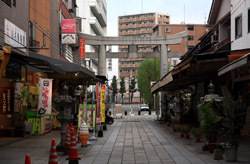 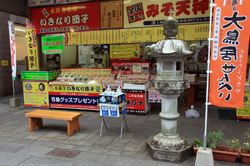 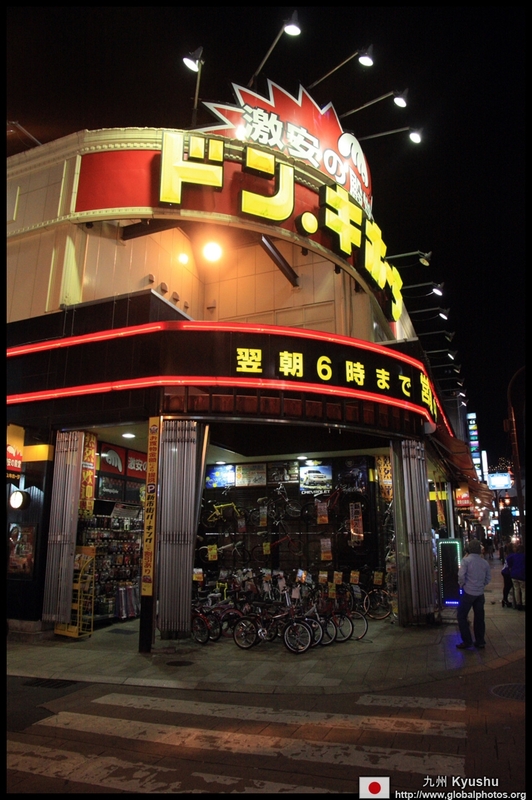 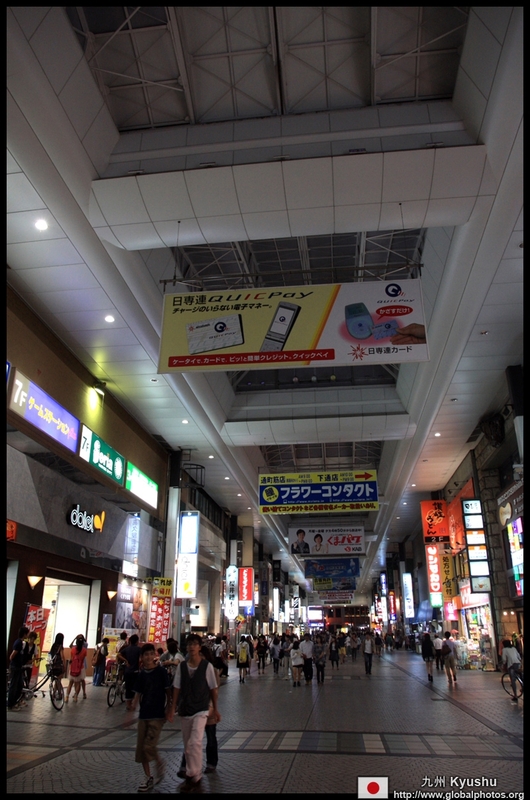 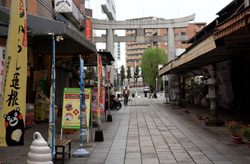 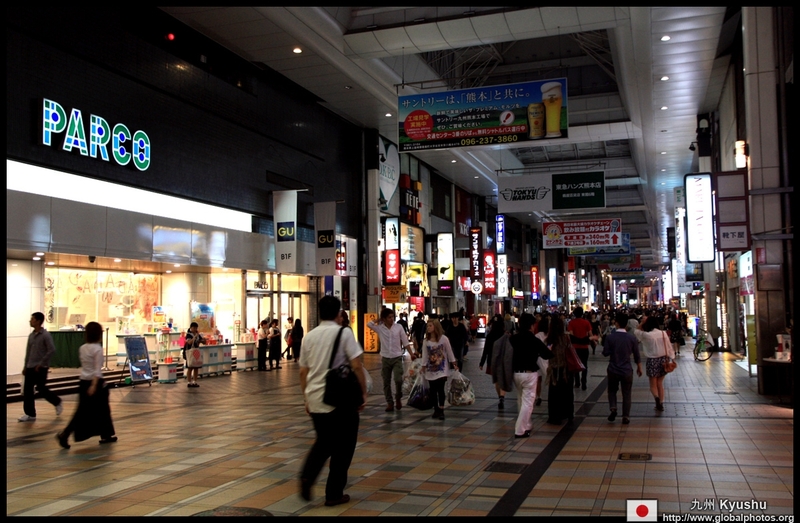 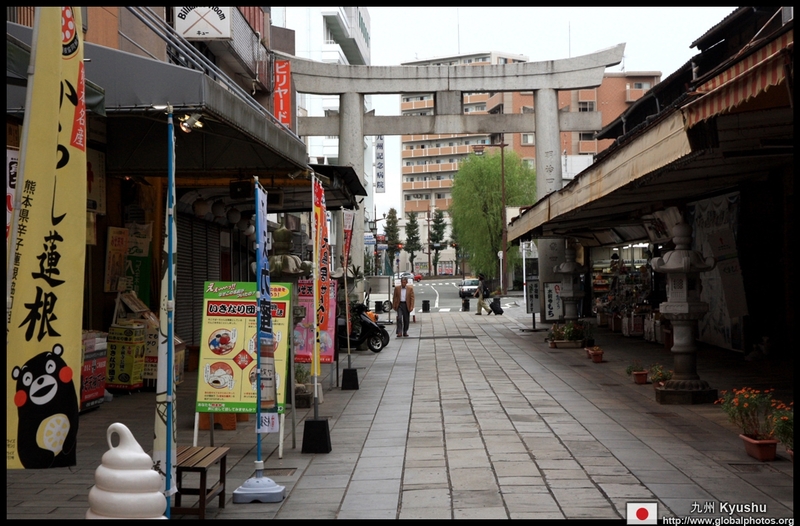 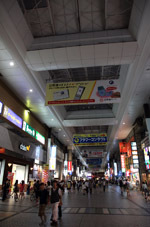 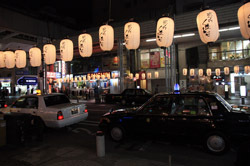 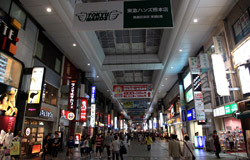 Shimotori has a spacious covered pedestrian shopping street. 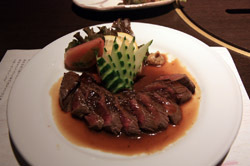 Horse meat is a local speciality. 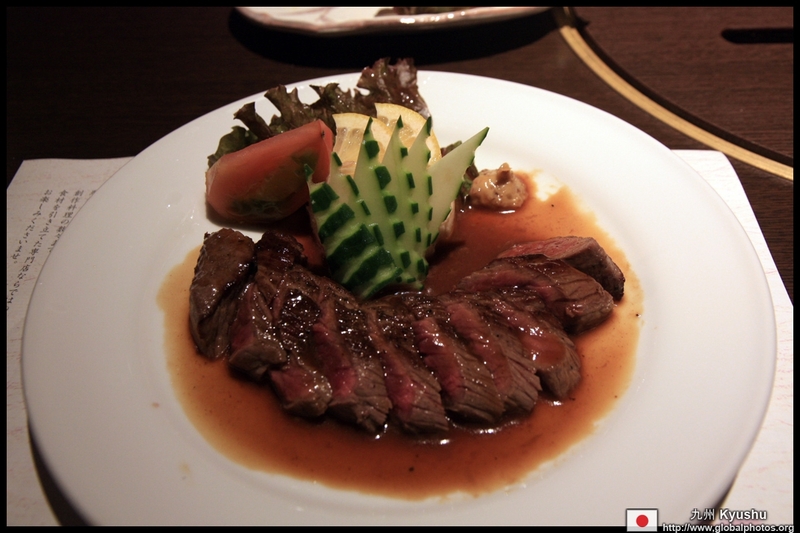 It tasted like a leaner version of beef, and looked like it as well. 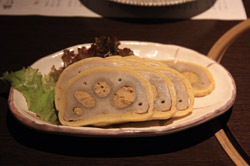 It is also possible to eat a raw version, but I think I need to get used to the taste first before venturing so far. 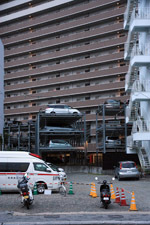 Cycling appears to be popular in the city. Even the bicycle parking lots look quite structured, with its own entry and exit gates. 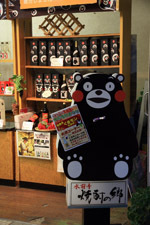 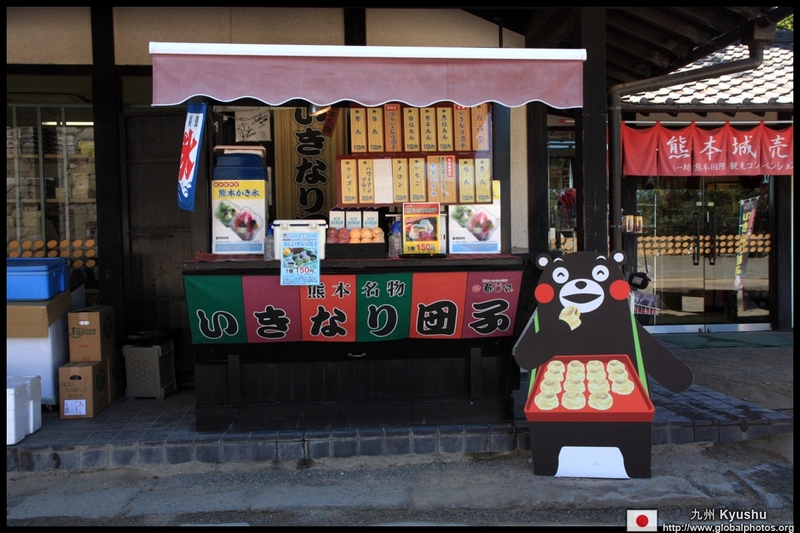 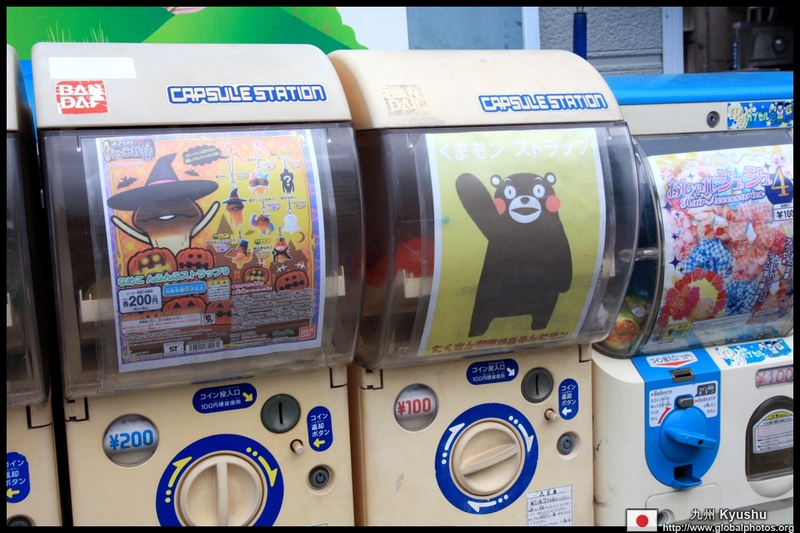 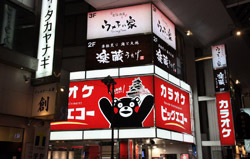 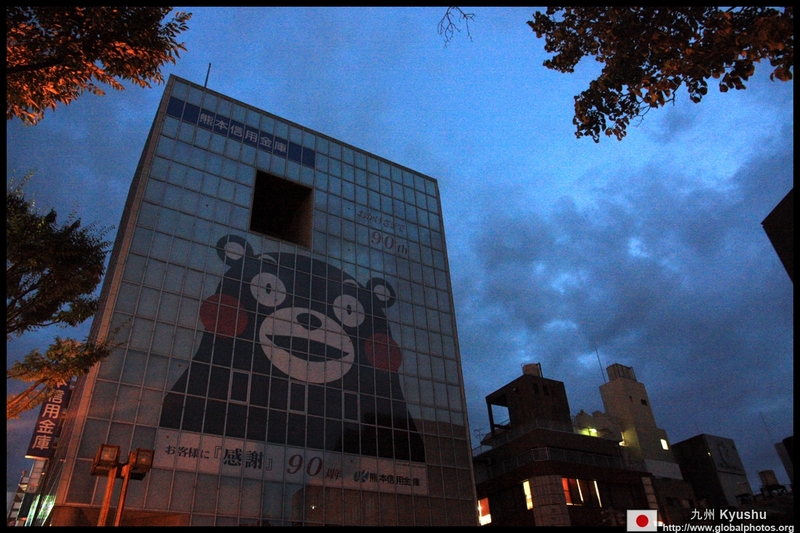 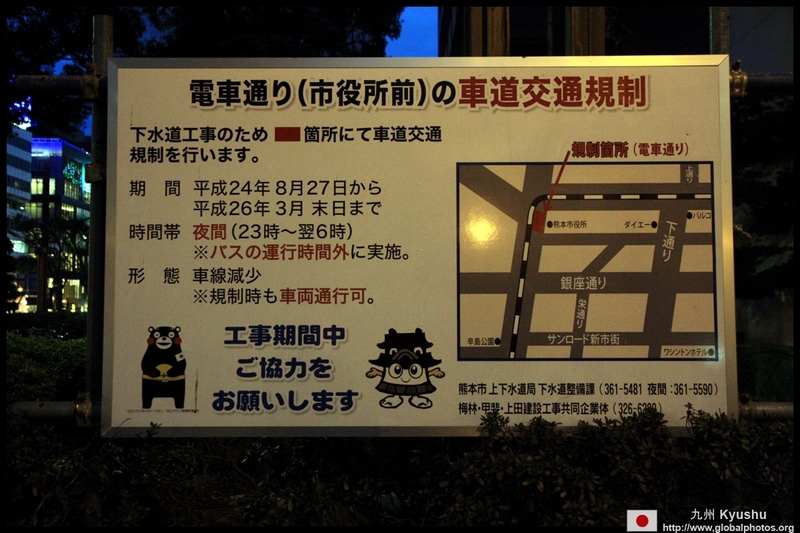 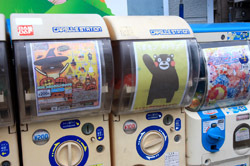 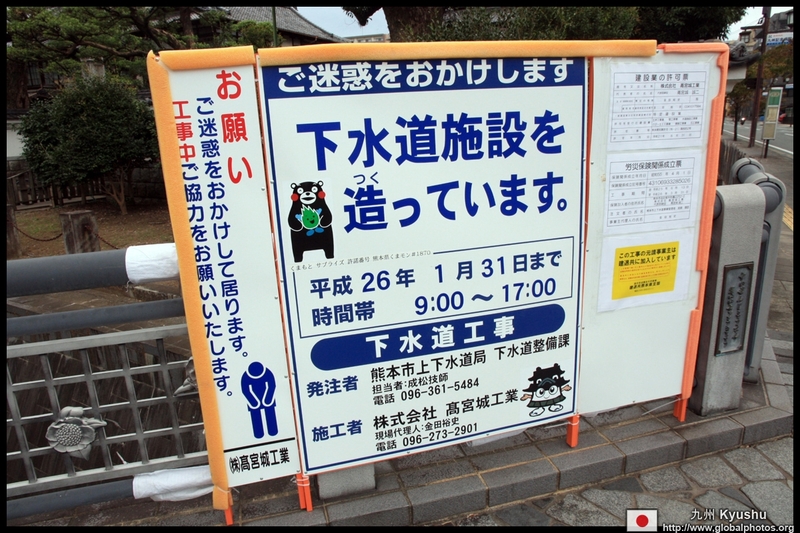 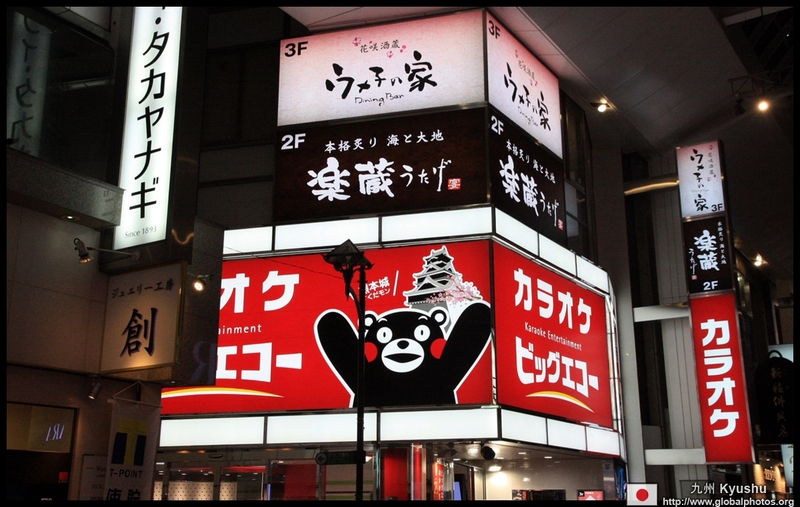 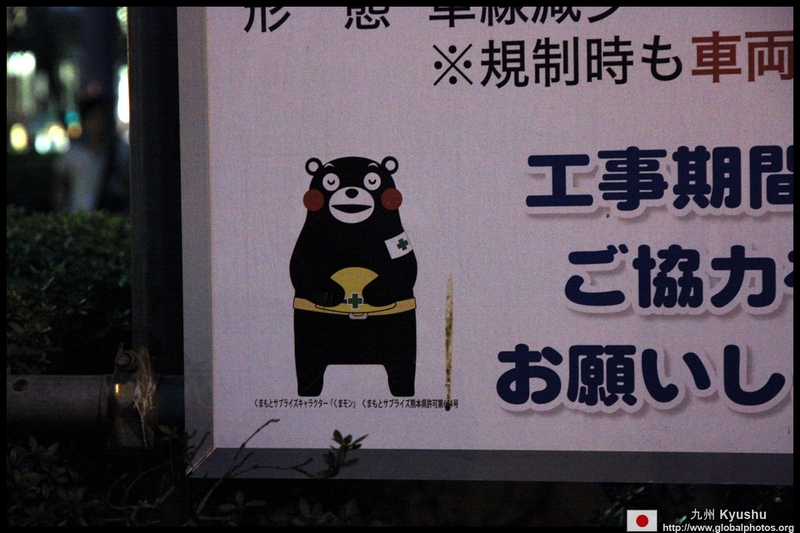 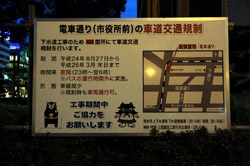 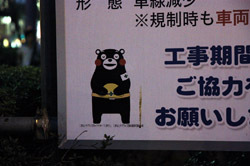 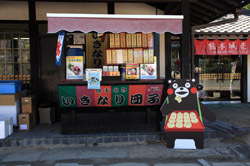 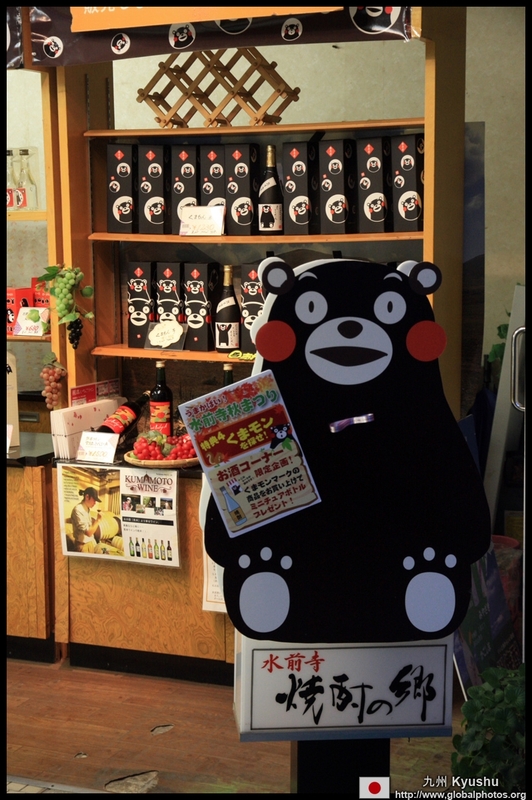 This is Kumamoto's official mascot, a black bear named Kumamon which seems to be everywhere in the city!